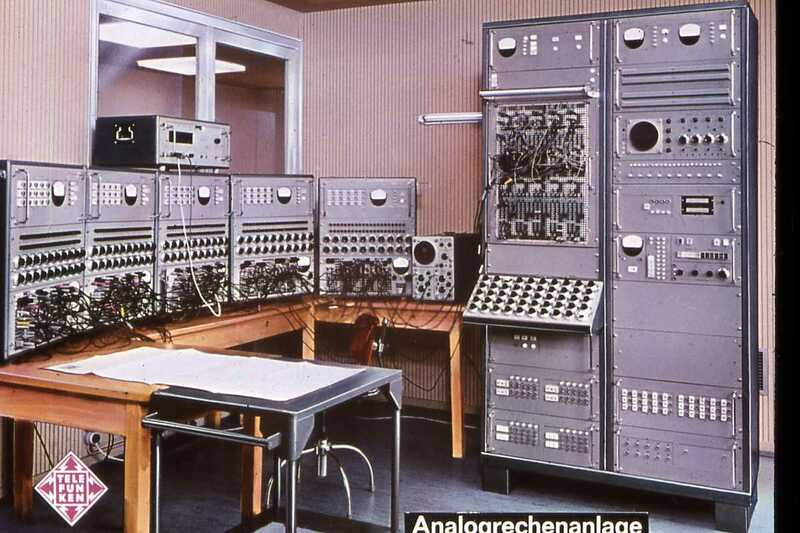 This page contains a variety of analog computer impressions - most of these machines have been scrapped a long time ago (which really makes me feel sad). Where ever possible picture sources are cited, but in many cases I have no idea where the pictures came from. I hope that I do not violate any ones copyright with this collection of pictures. The pictures are shown for academic purposes only to keep these machines from getting forgotten. 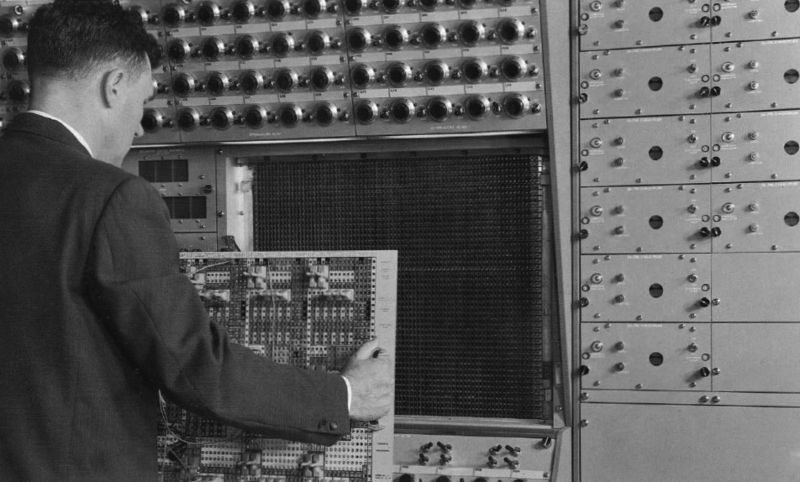 I you have pictures of analog computers not shown here, please send them to ulmann@analogmuseum.org. 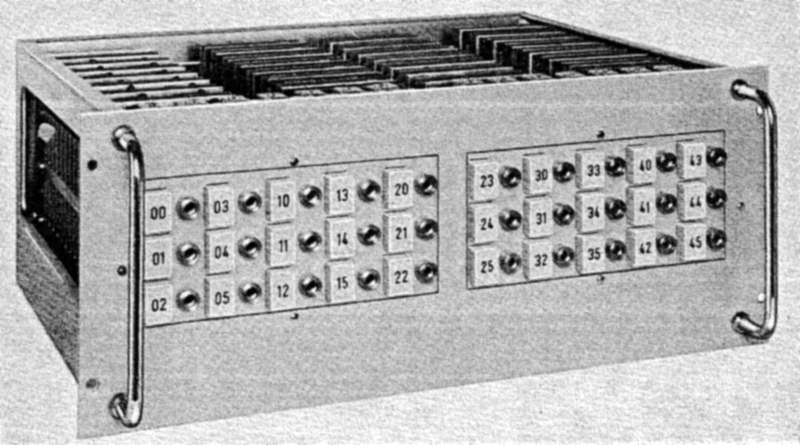 This picture (source unknown) shows an Applied Dynamics AD-2-32PB transistorized analog computer featuring a machine unit of +/-100 V, 12 integrators, 20 summers and 40 coefficient potentiometers. 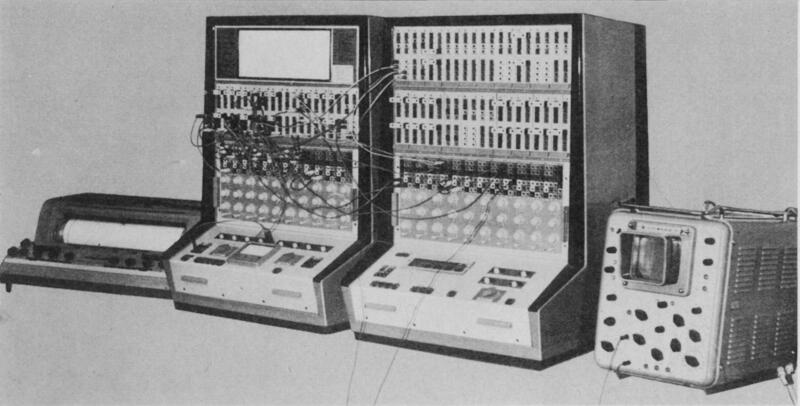 This picture shows a master/slave configuration of two transistorized MEDA analog computers. This series was designed and built in Prague (former Czechoslovakia). MEDA 41 (picture source: Dr. Th Müller). 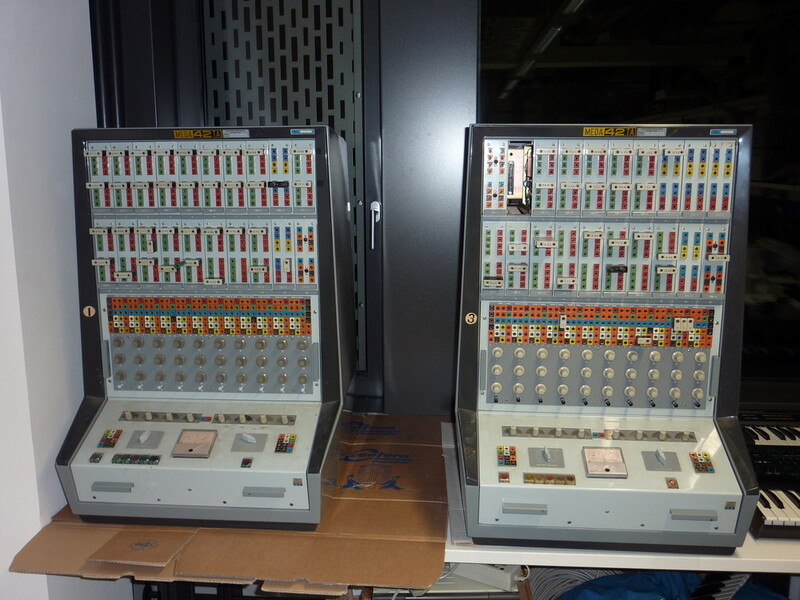 A series of pictures of two MEDA 42 analog computers (thanks to A. Shenshyn for these wonderful pictures): 1, 2, 3, 4, 5, 6, 7, 8, 9. 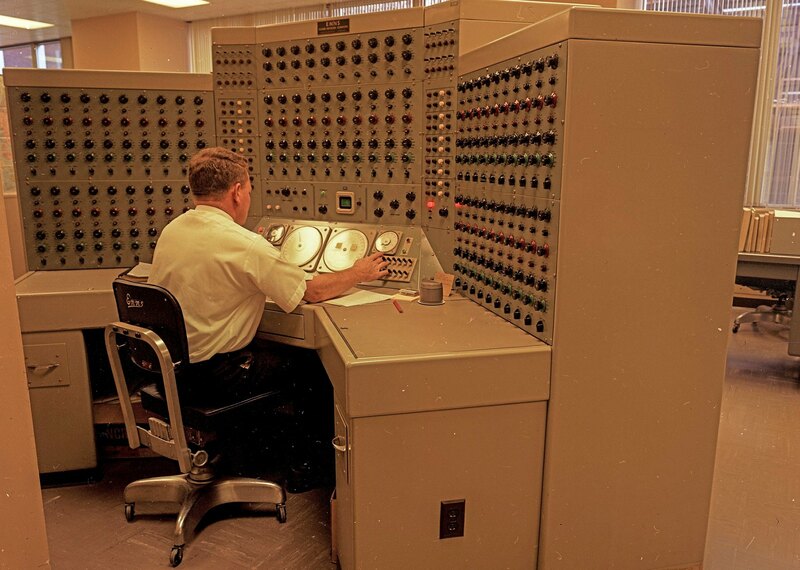 Beckman EASE 1032 analog computer as it was used by the Bonneville Power Administration to gain insight into stability questions of large power grids (cf. 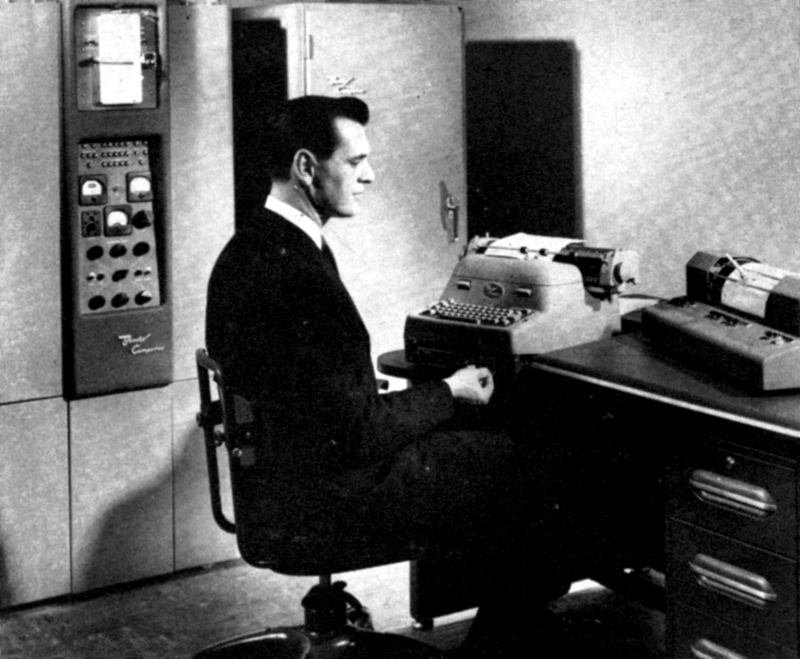 "Bonneville Power Administration Solves Swing Equations with EASE", in "Instruments and Automation", March 1957, p. 498). 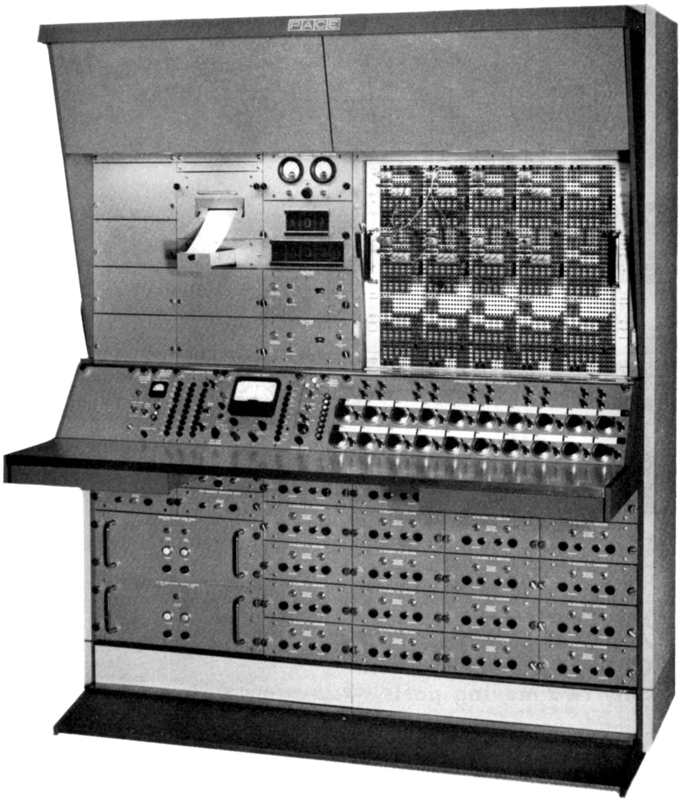 A Beckman EASE 1132 electronic analog computer as it was used in the Beckman/Berkely Computation Center that opened its doors on February 28th, 1958 in Los Angeles (cf. 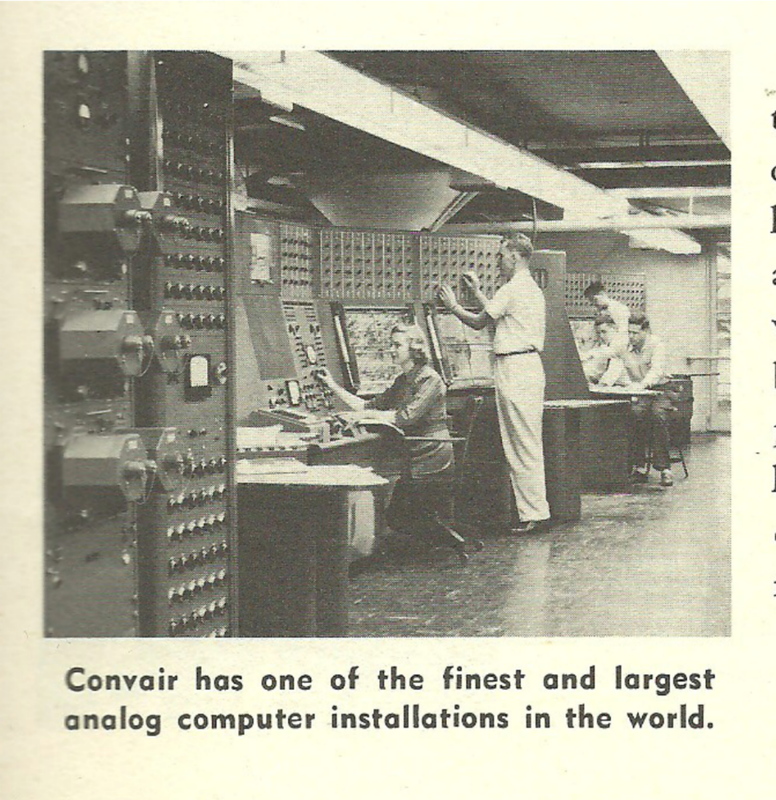 "Instruments and Automation", February 1958, p. 288). 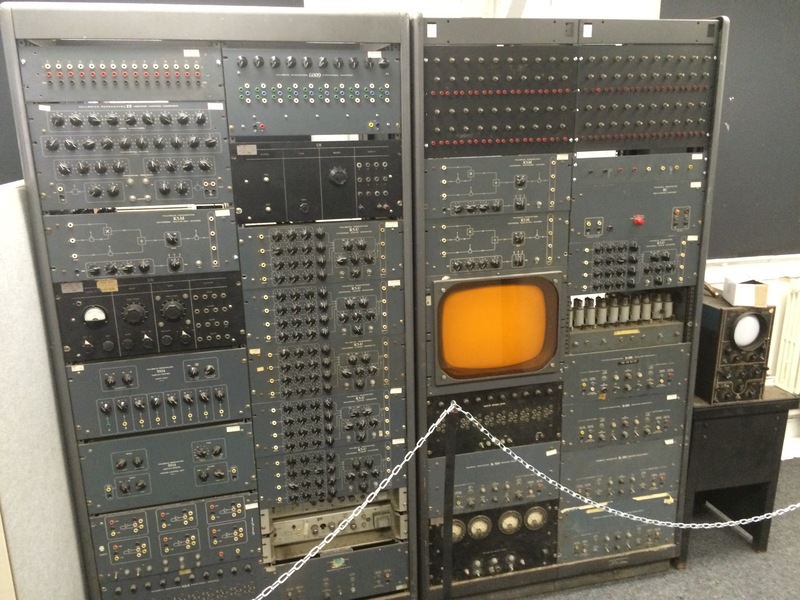 Beckman EASE 2132 - Greg Parkhouse shared some memories of this particular machine: "That machine was used at the University of Chicago hospital known first as the Argonne Cancer Research Hospital and then the Franklin McLean Memorial Hospital. That photo must have been taken in the late 1960s. I worked in that hospital from 1971 until 1976, the computer was there when I arrived and for the last two years I was tasked with the weekly maintenance of that machine. 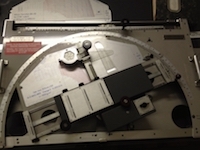 The machine was used for calculating dosimetry for treating cancer patients as well as doing research on other nuclear and non-nuclear research projects. I recognize the man standing but cannot remember his name. 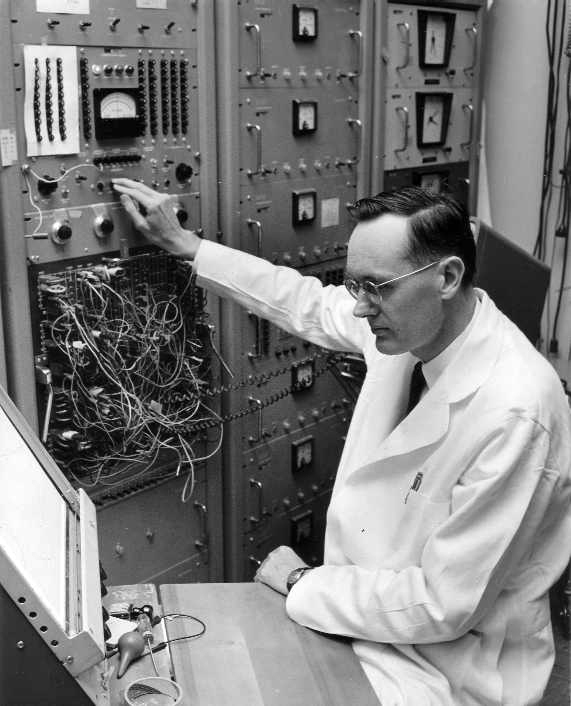 He was the physicist responsible for radiation safety in the hospital. The seated man I do not recognize. 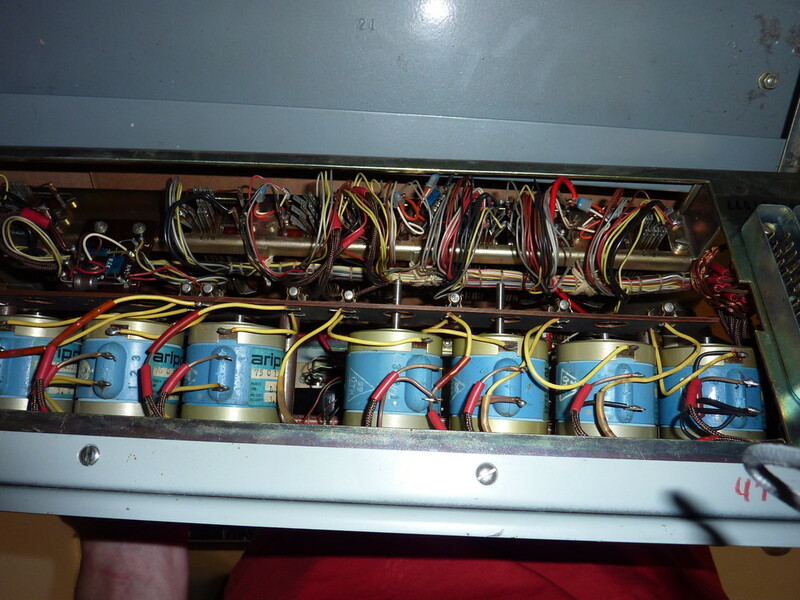 Three times a week I came in an plugged a meter into the end of each of the cards containing amplifiers and multipliers to check for bad tubes. There was never a week when I didn't change two or three. More on the use of the machine: Patient's x-rays were used to measure the depth of a tumor from many different angles and a treatment plan was formulated based on the type of tumor and it's location. The hospital had a 0-40 MEV linear accelerator, a Van de Graph generator and a Cobalt-60 source with which to irradiate the tumor. 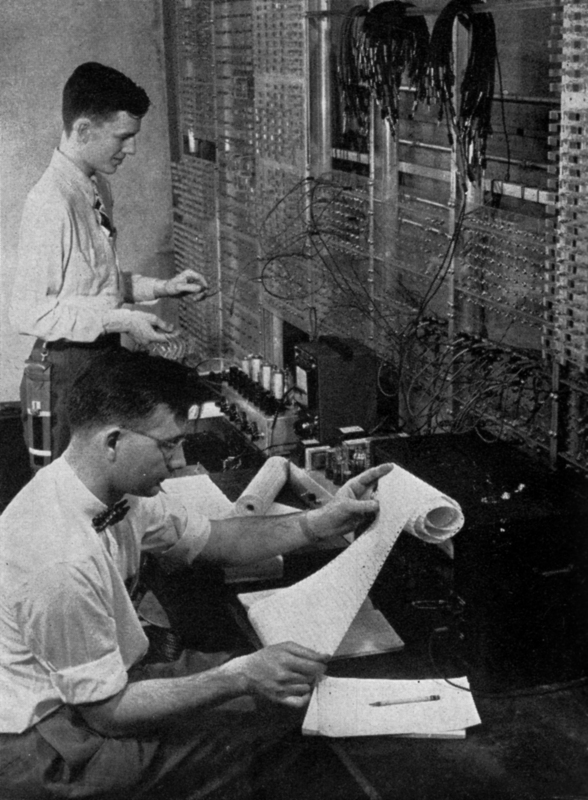 A calculus formula was then 'plugged in' to the computer and variables were adjusted in real time and displayed on the t.v. monitor on the left. When a satisfactory solution was attained, it could be plotted on the x-y plotter just showing on the right edge of the photo. 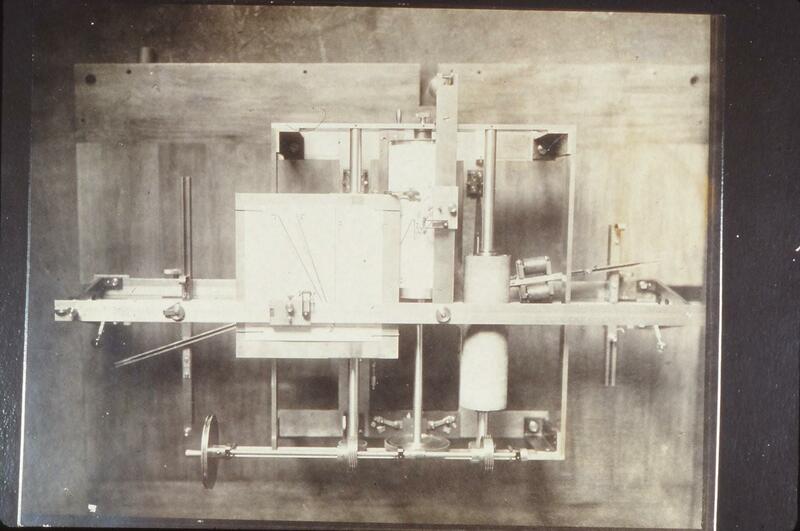 This was then used to orient the patient under the appropriate beam and adjust the beam strength and angular motion for the proper delivered dose. 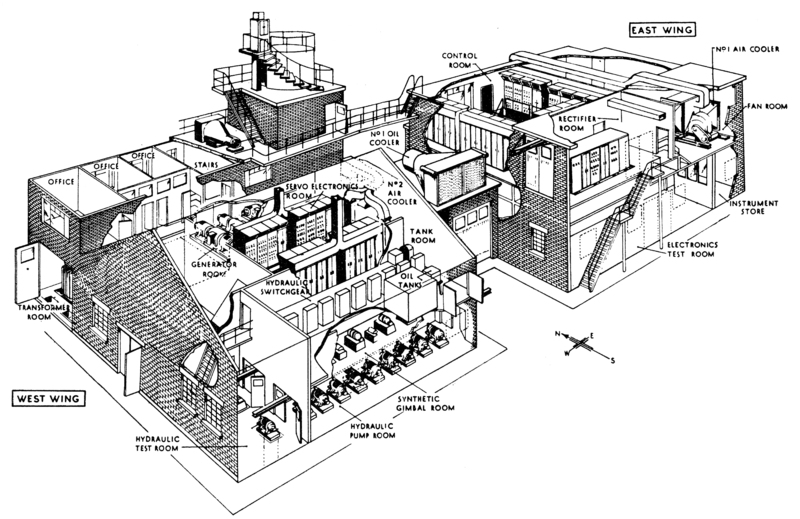 By delivering small amounts of radiation of different energy levels from different angles, the beams did little or no damage to vital tissues but were ultimately concentrated at the site of the tumor. 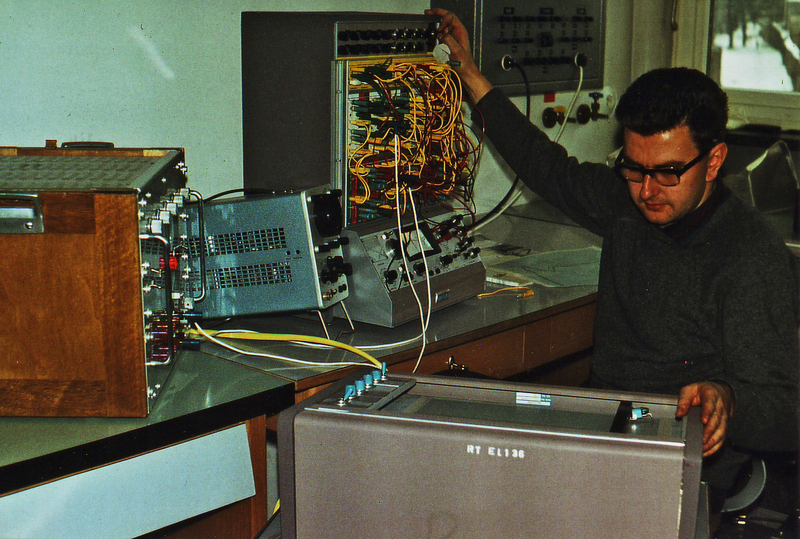 Another interesting note: That display of (very faint) numbers just to the left of the oscilloscope and just above the angled console, I was told, was one of the very earliest digital voltmeters. It had a precision to 1 mv if I remember correctly. I believe there were eight digits and each digit consisted of 10 small pieces of film with a single digit 0-9 in back of a small lens and in front of a small incandescent light bulb. To display the derived reading, the proper light for each digit was turned on and the number was projected on the rear of the mat-finished glass on the front of the unit! There were no LCD or LED displays available when this meter was developed! (I opened the photo in Photoshop and enhanced it and that allowed me to make out the digits which then reminded me of the meter.)" Rather gigantic EASE 2133 installation at the MBB (Messerschmitt Bölkow Blohm - a large German aerospace company) computer center (cf. "MBB Simulation", Firmenschrift Messerschmitt Bölkow Blohm GmbH, Unternehmensbereich Flugzeuge). 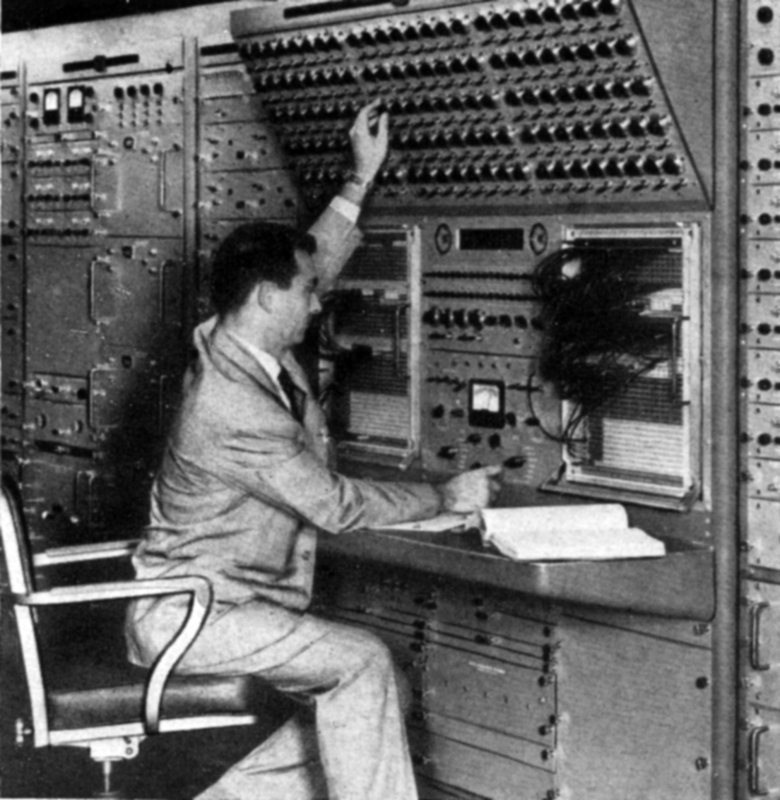 Richard FithHugh solves the Hodgkin-Huxley equations using a Beckman analog computer (source: Izhikevich E. M., FitzHugh R.). 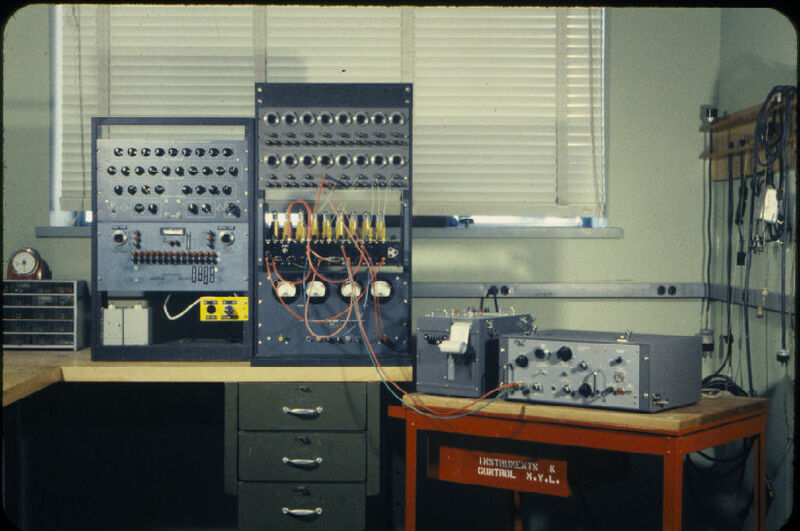 A function generator, based on a servo driven multi slider potentiometer developed by Bell. 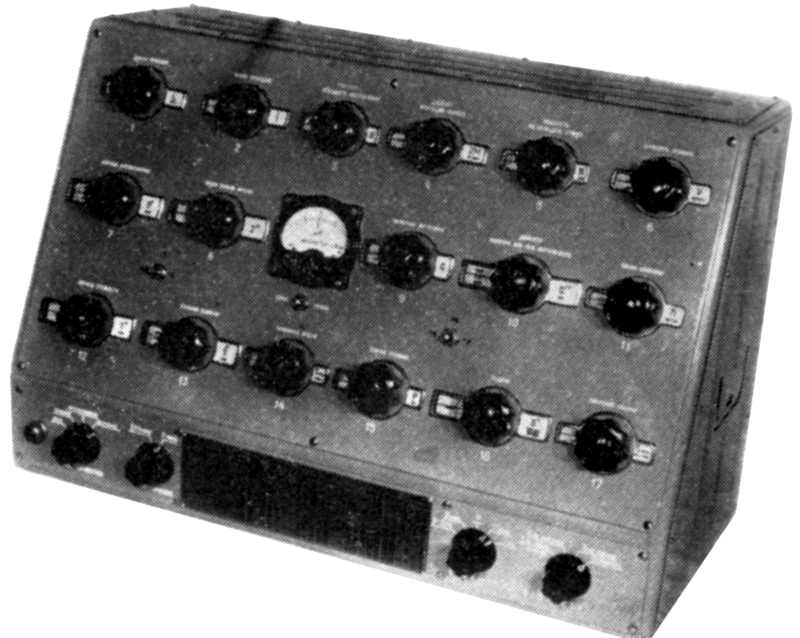 Function generators like this were used in fire control systems and the like. 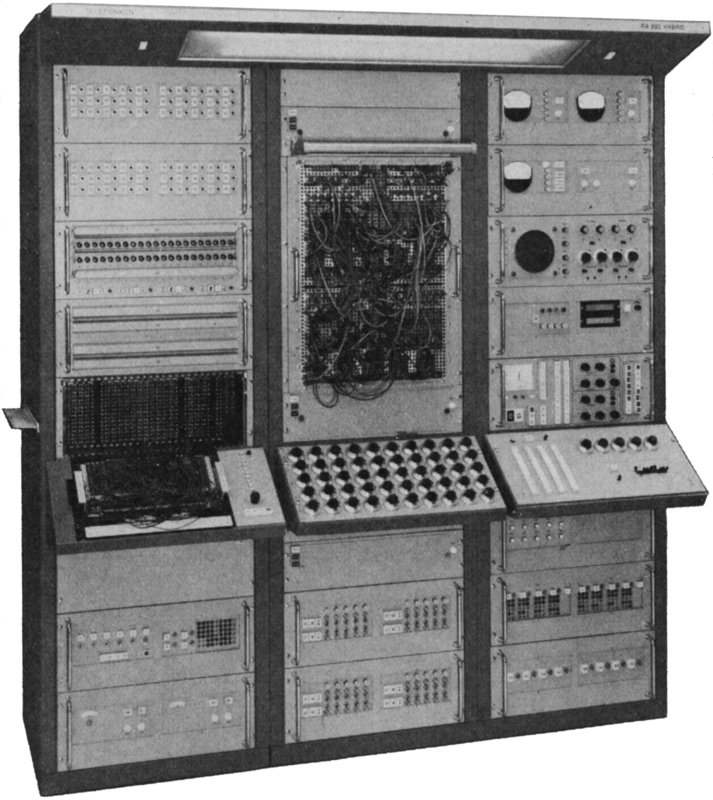 Bendix G15-D digital computer with attached Digital Differential Analyzer (cf. 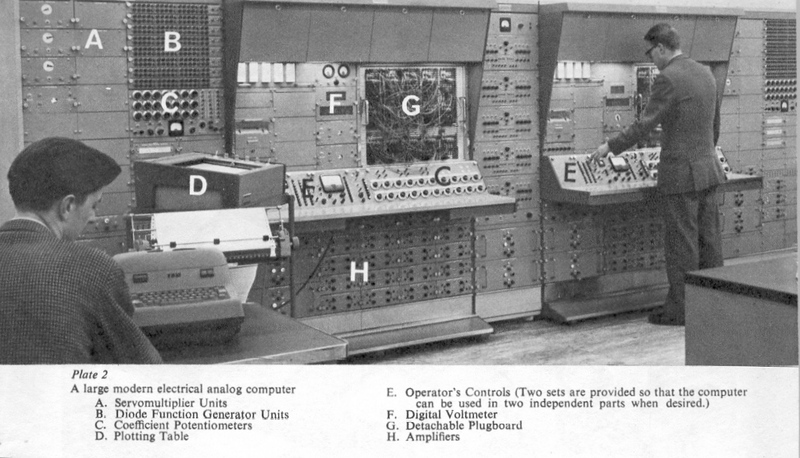 Martin L. Klein, Frank K. Williams, Harry C. Morgan, "Digital Differential Analyzers", in "Instruments and Automation", June 1957, p. 1105). 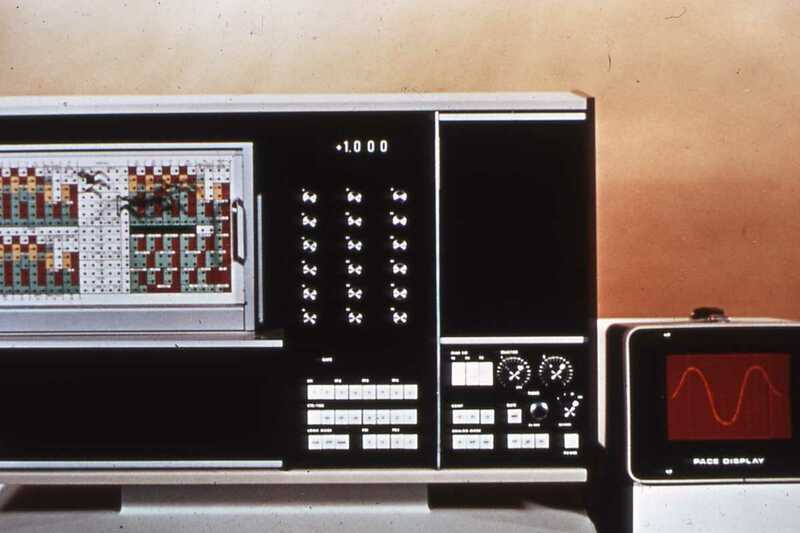 Bendix D-12 Digital Differential Analyzer (cf. 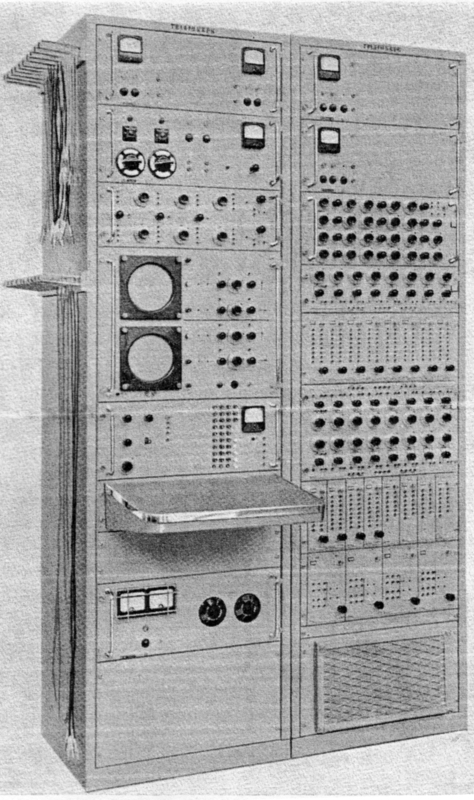 "Bendix Computer - Digital Differential Analyzer D-12", Bendix Computer, 5630 Arbor Vitae Atreet, Los Angeles 45, California, p. 2). 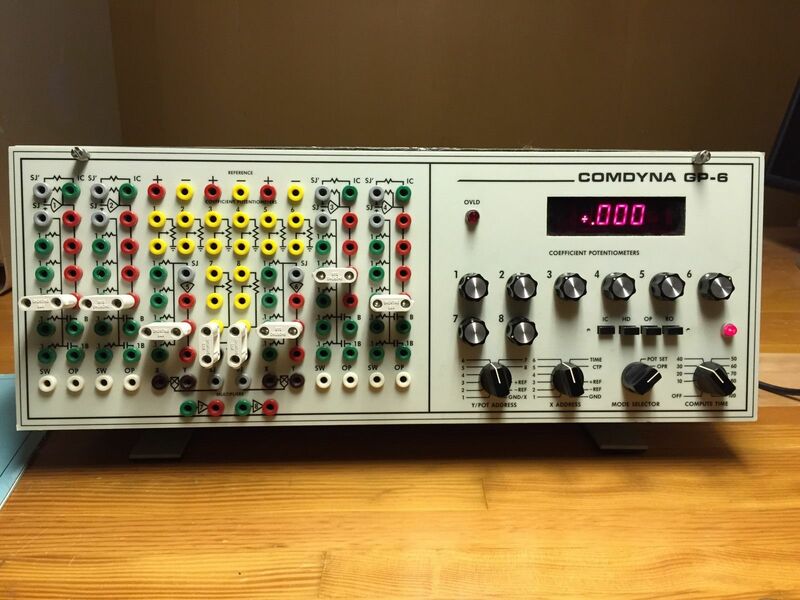 Front view of a COMDYNA GP-6 analog computer (unfortunately, I have forgotten where I got that picture from :-( ). 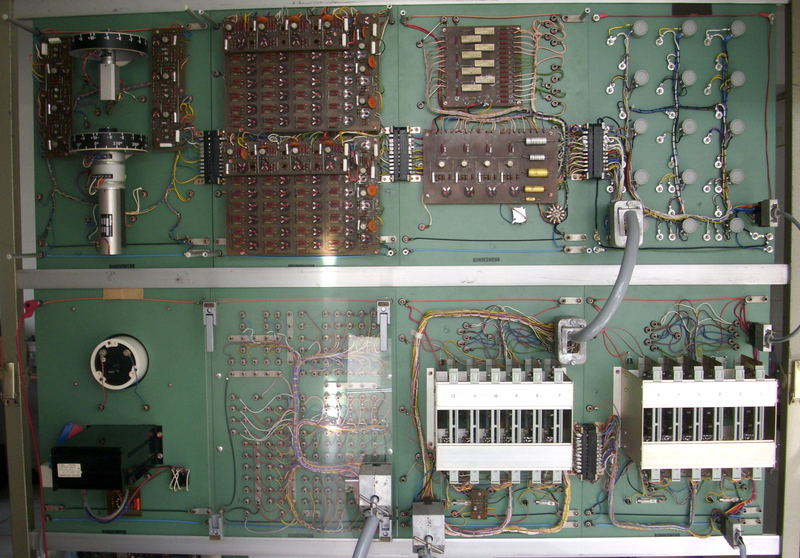 Interior view of a COMDYNA GP-6 analog computer (unfortunately, I have forgotten where I got that picture from :-( ). 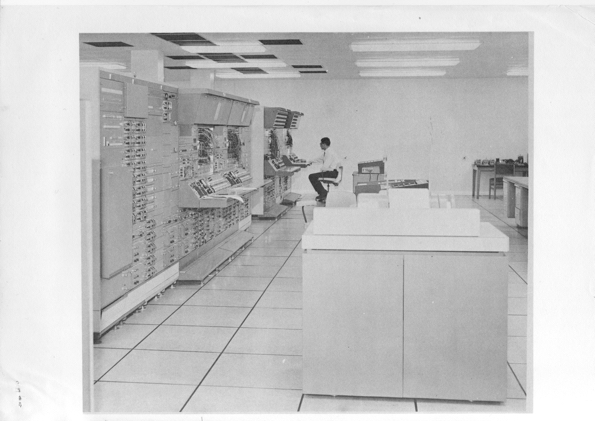 Scale model of the large hybrid computation facility which was installed at the Lockheed Missile and Space Company (cf. George A. Bekey, Walter J. Karplus, "Hybrid Computation", John Wiley & Sons, Inc., 1968, p. 166). 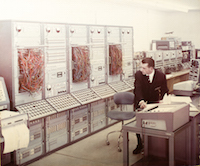 Hybrid computer installation at the Naval Postgraduate School (end of the 1960s) consisting of a SDS 9300 digital computer and a COMCOR CI 5000 analog computer (photo: Bob Limes). COMCOR INTRACOM CI-5100 (cf. George A. Bekey, Walter J. Karplus, "Hybrid Computation", John Wiley & Sons, Inc., 1968, p. 168). 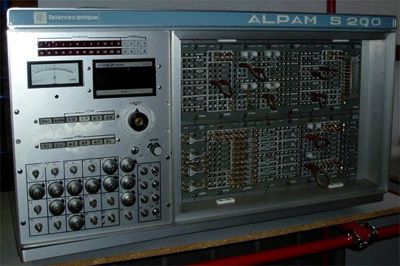 The tube based ELARD analog computer that was developed at the TU Darmstadt (Germany). 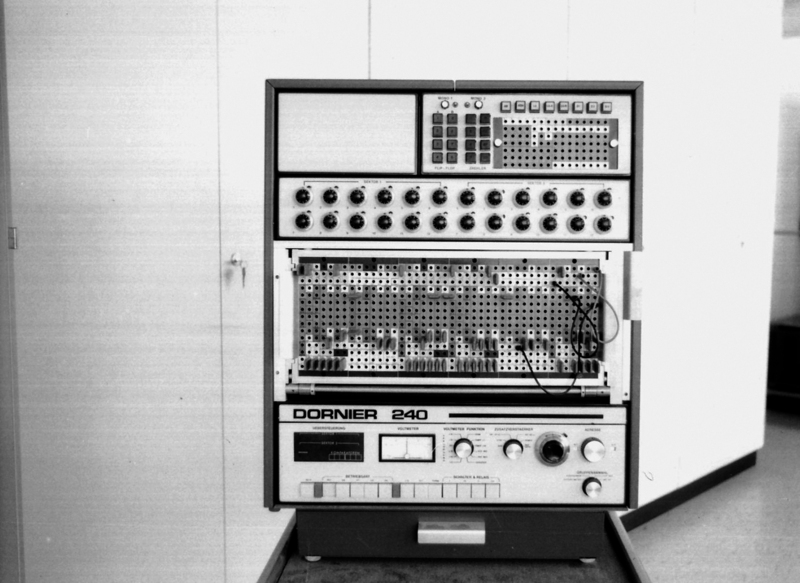 Front view of the prototype of the DO-80 analog computer (source: Prof. Dr. W. Becker). 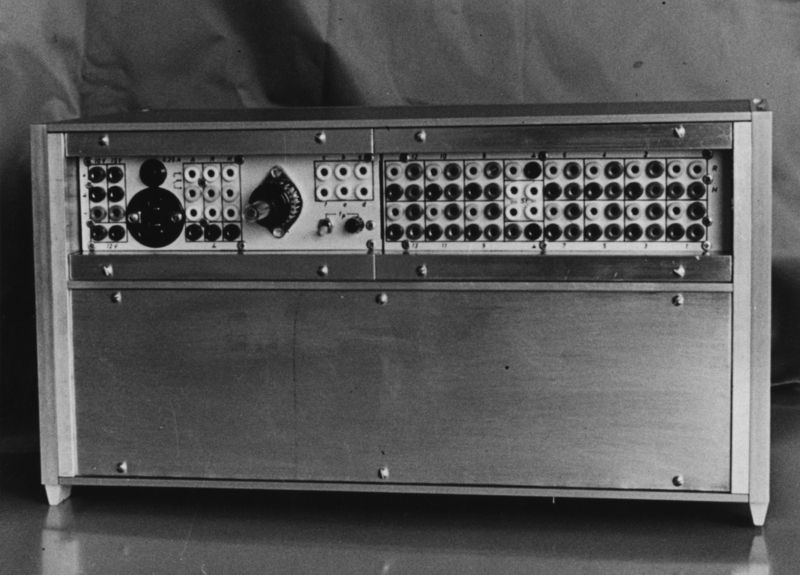 Rear view of the prototype of the DO-80 analog computer (source: Prof. Dr. W. Becker). 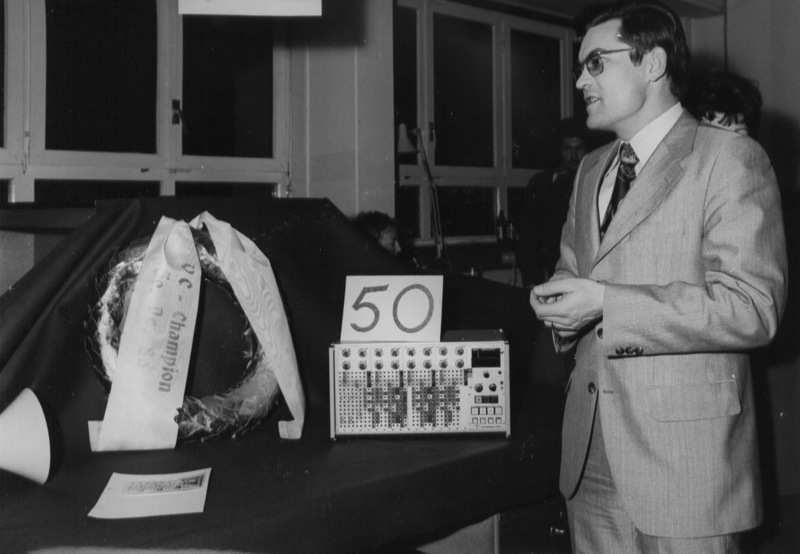 Ceremony due to the 50th DO-80 analog computer delivered to a customer (source Prof. Dr. W. Becker). 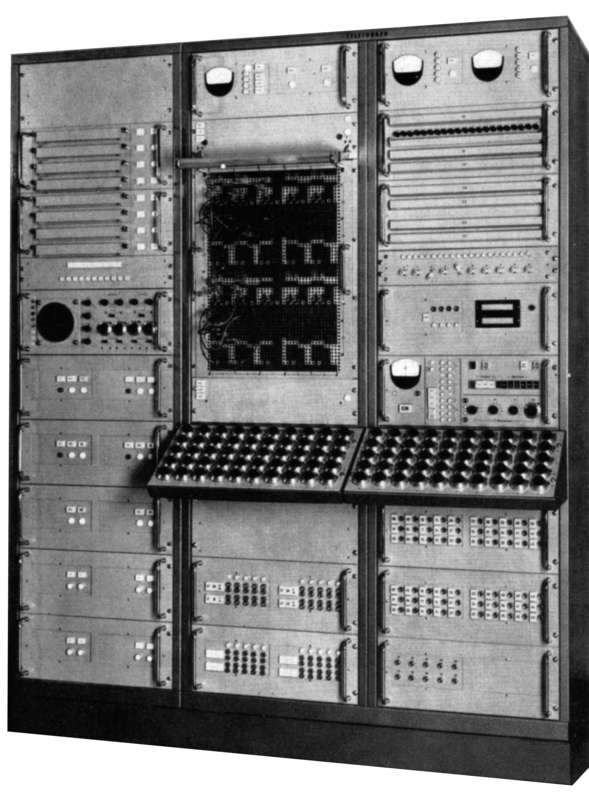 The Dornier 240 analog computer - as far as I know this machine is based on a very similar (identical?) 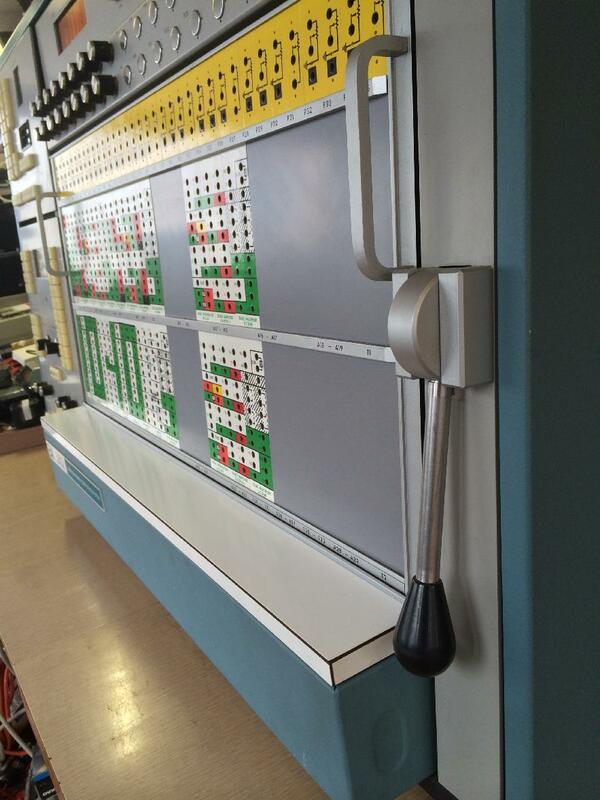 machine built by Simulators Inc. (Could someone confirm this?) 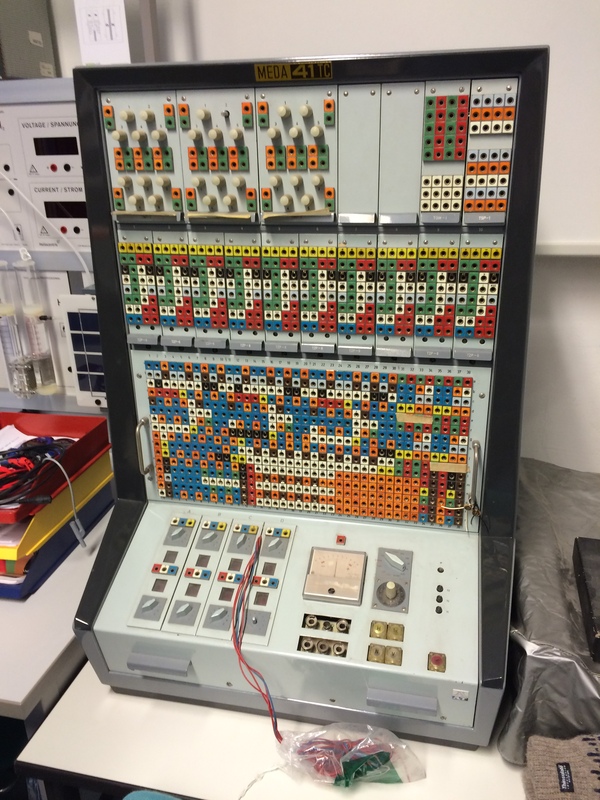 This machine was once in use at the Institut für Mess- und Regelungstechnik of the University Karlsruhe but has been scrapped. 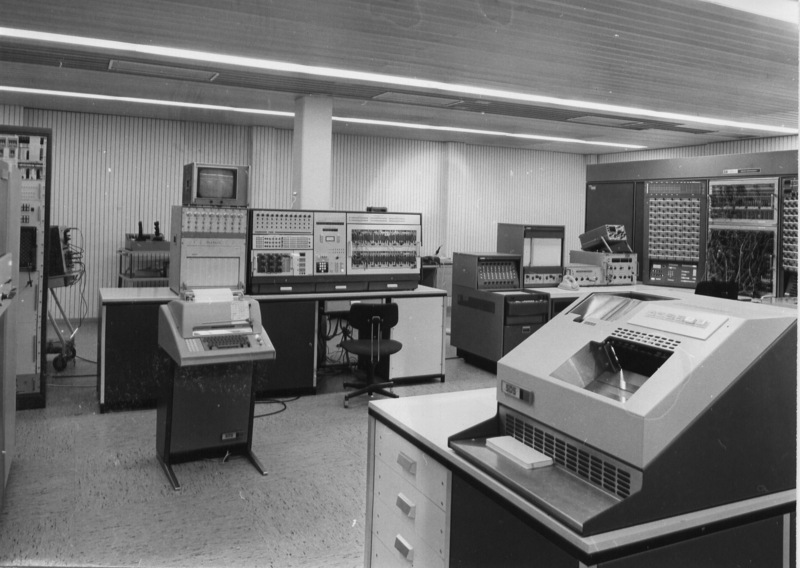 Overview of the Dornier hybrid computer center, DO-720 analog computer in the middle, EAI 8800 on the right (source: Prof. Dr. W. Becker). 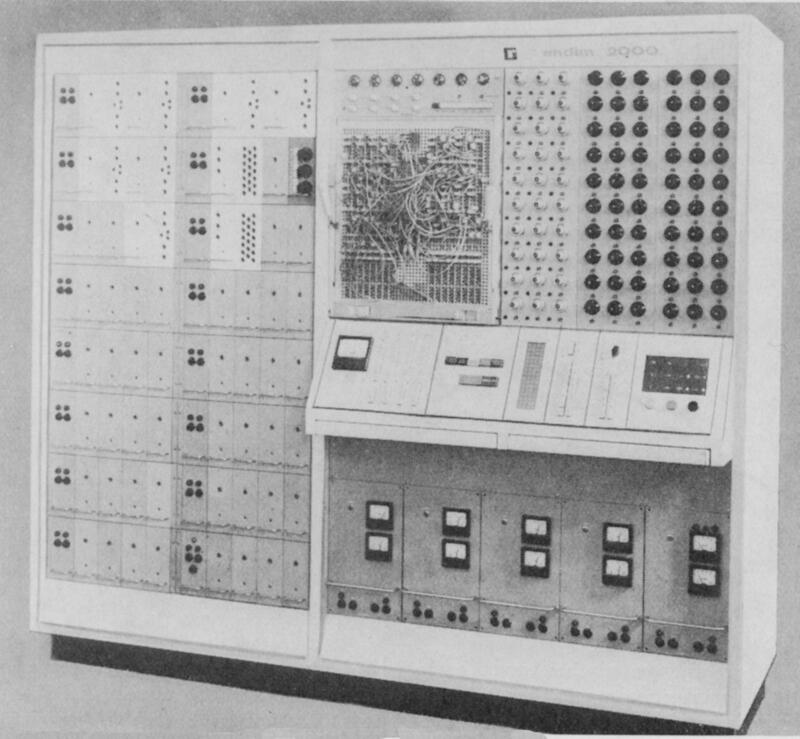 Dornier 720 analog computer at the Dornier hybrid computer center (source: Prof. Dr. W. Becker). 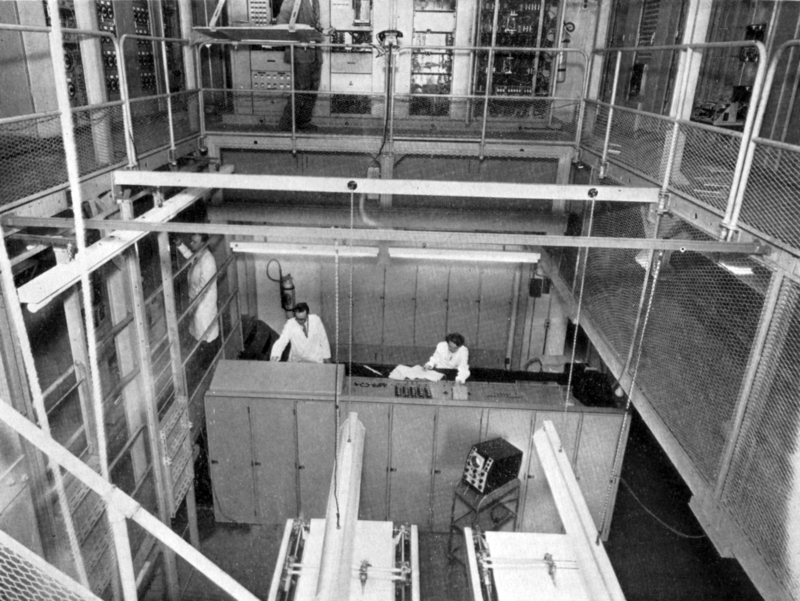 EAI 16-31R used at the 8x6 foot wind tunnel building of the NASA/Glenn research center in 1959. EAI PACE 16-31 (picture: Rolf Pixley). 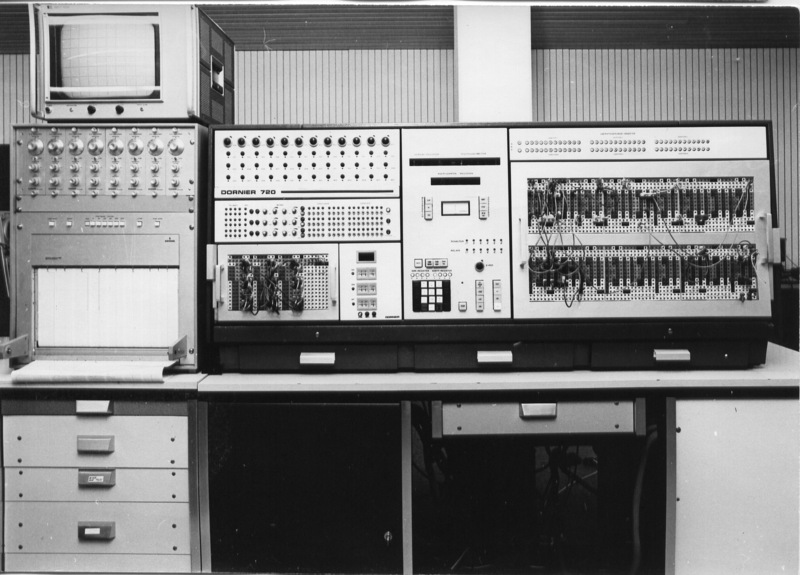 The EAI Pace 96 analog computer that was installed in the first europaean analog computer center in Brussels in 1957 (cf. 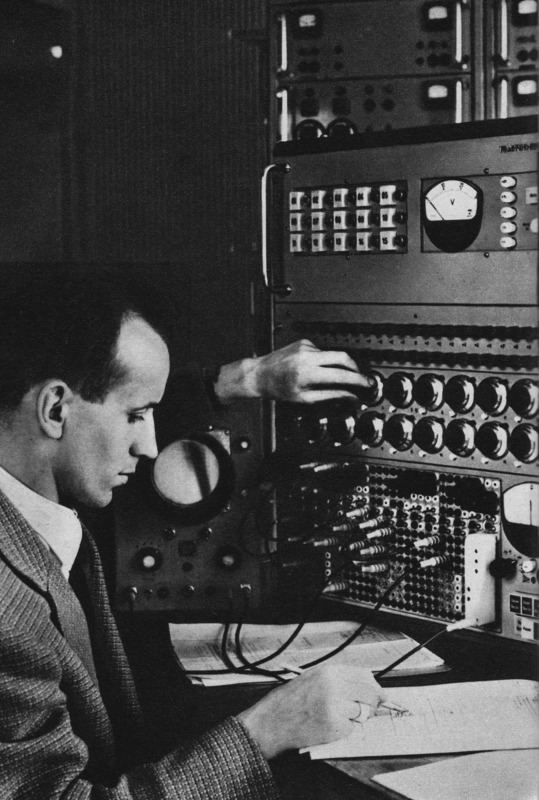 "Eröffnung des ersten europäischen Analog-Rechenzentrums", in "Elektronische Rundschau", August 1957, 11. Jahrgang, Heft 8, p. 253). 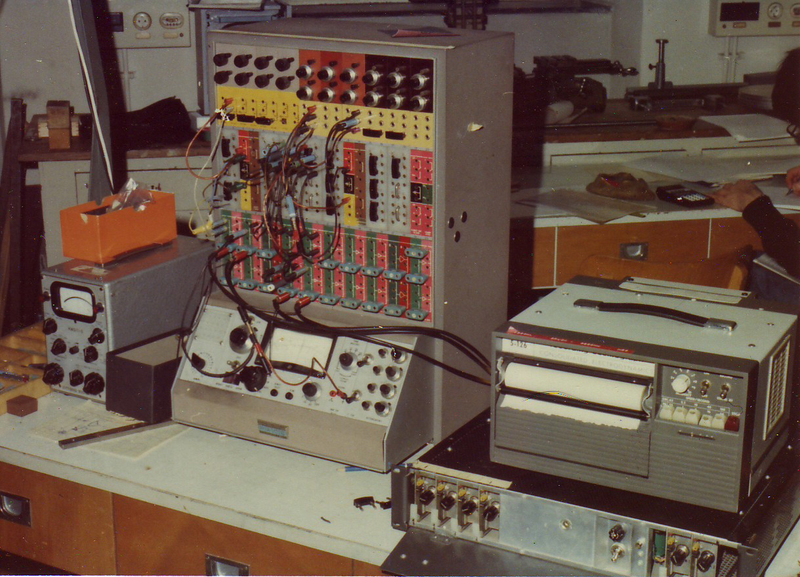 A wonderful triple Pace 16-31R installation (right hand side) with optical function generators (cylindrical objects in the background) and various support equipment. Unfortunately I managed to forget where this photo came from. 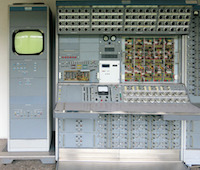 EAI analog computer at the DLR (Deutsches Zentrum für Luft- und Raumfahrt, Picture source: Dr. Jessika Wichner, DLR, signature FF-756.) 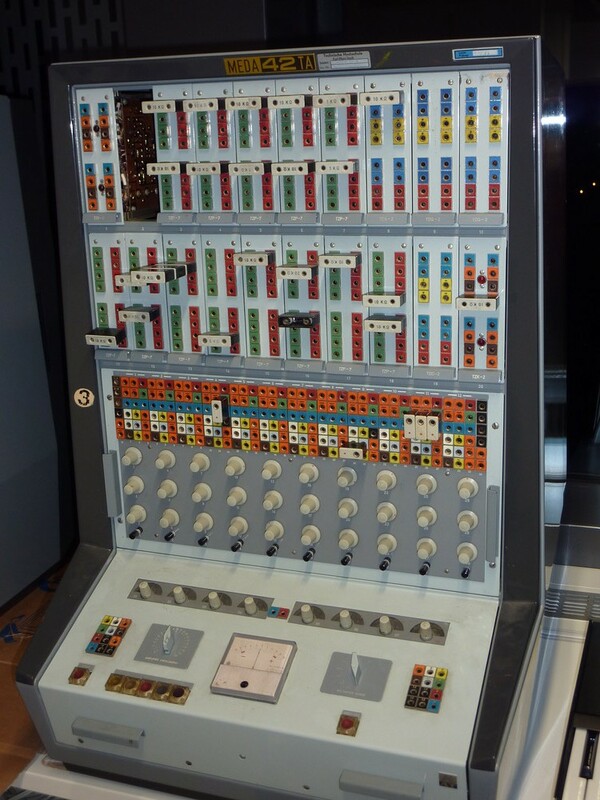 Bruce Baker has some information about this particular machine: "It is a 231X rack used to repair modules from a 231R. 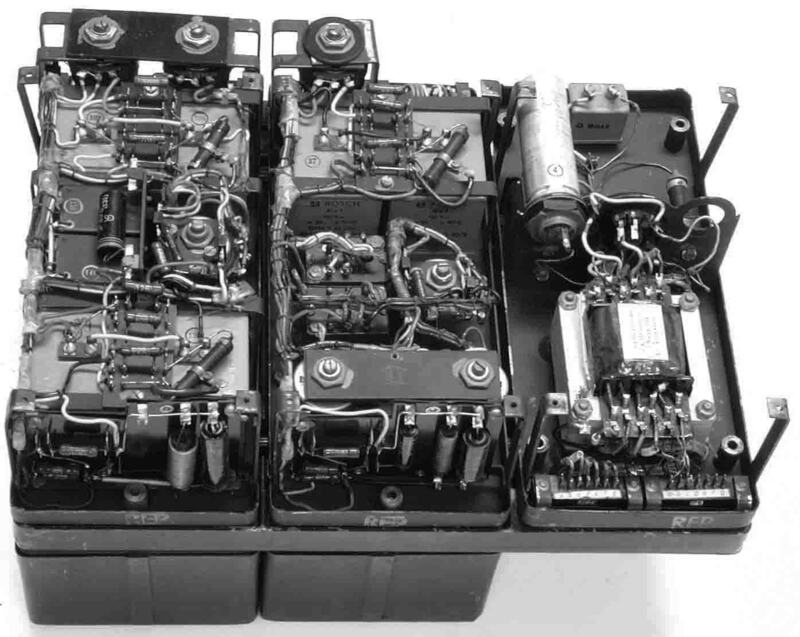 I think the later ones could also repair modules from a 231R-V. We had one of these when I was at Martin Marietta. The two chassis sitting on the work shelf are for the DVMs. 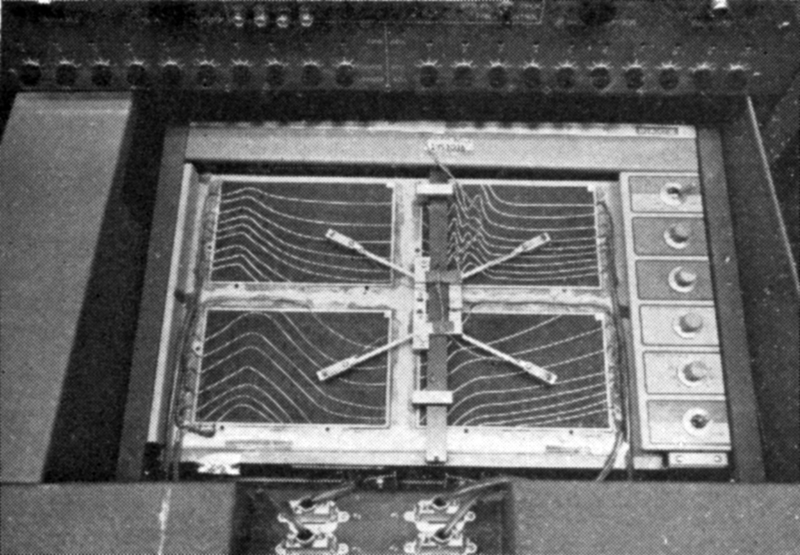 The DVMs had a 200 Hz sample rate and were 4 1/2 digit units. 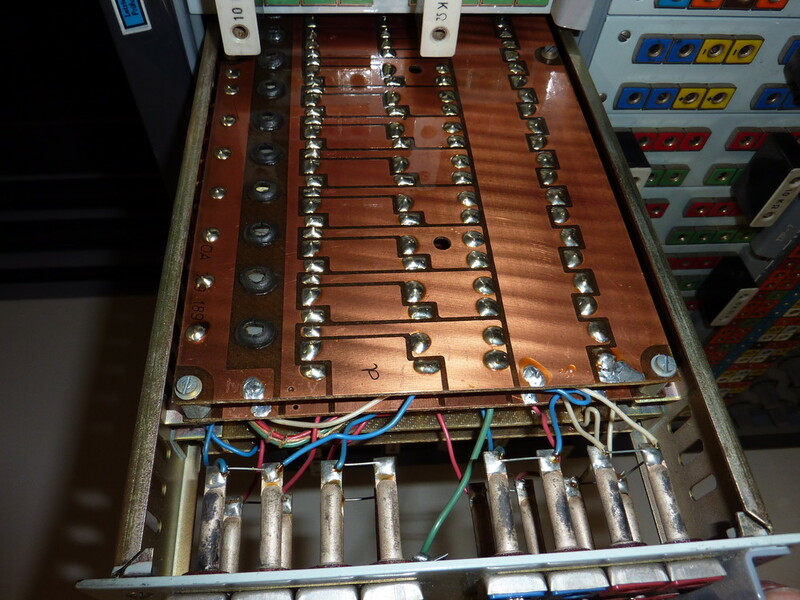 They had an unloading amplifier on the input and had an input impedance in excess of 10^12 ohms." 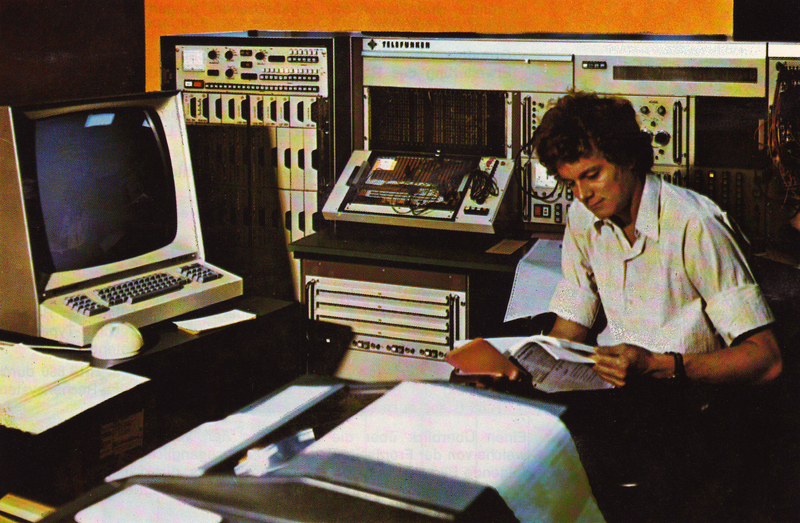 EAI 231R analog computer (with gaussian noise generator and readout printer). 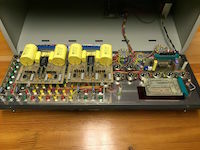 A late model of EAI's highly successful tube based EAI 231 analog computer. 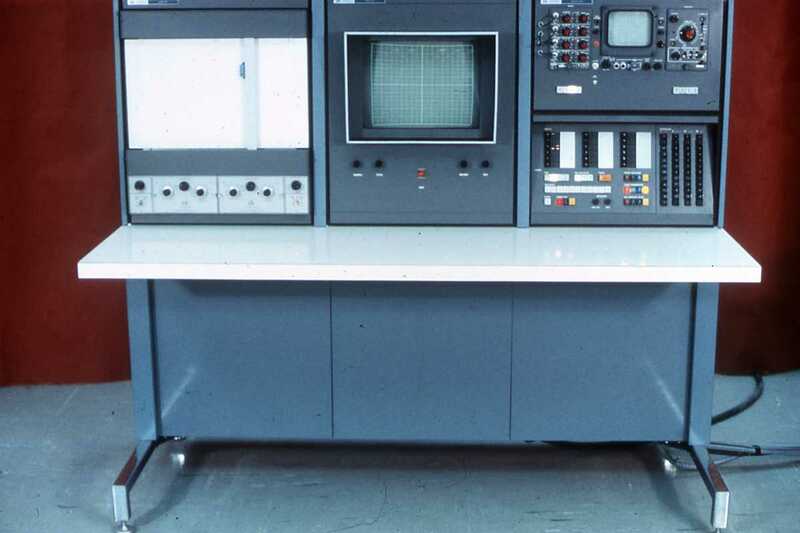 Note the digital expansion unit on the left (above the table plate). 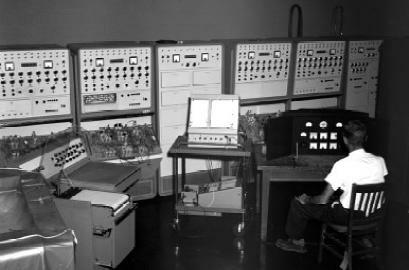 A rather large installation of two EAI 231R analog computers with additional devices such as plotters, function generators, multipliers and the automatic setup system ADIOS - far right (cf. 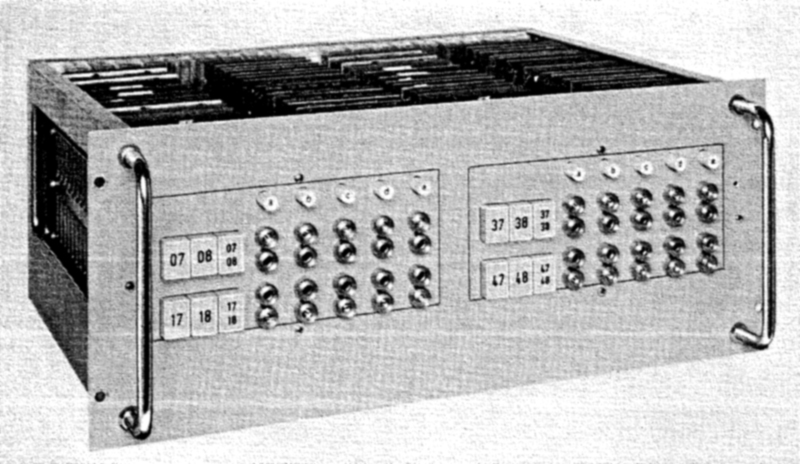 "PACE 231R analog computer", Electronic Associates, Inc., Long BRanch, New Jersey, Bulletin No. AC 6007). 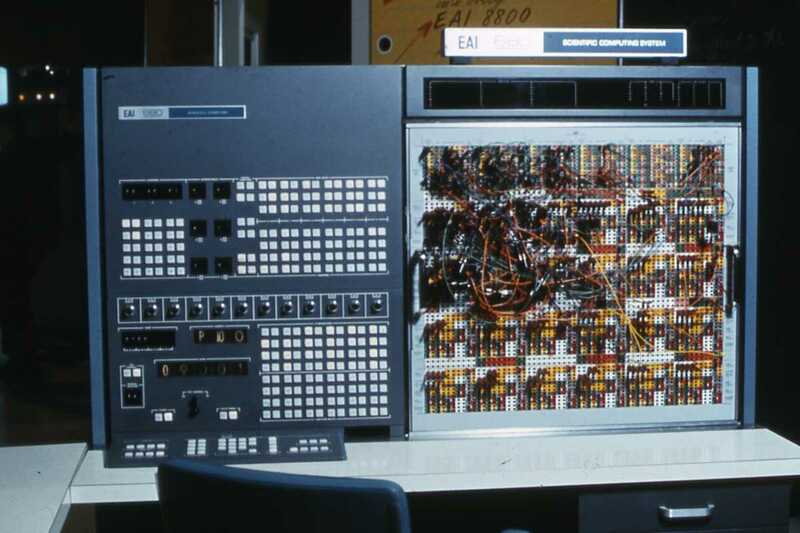 A large EAI 231R analog computer installation. 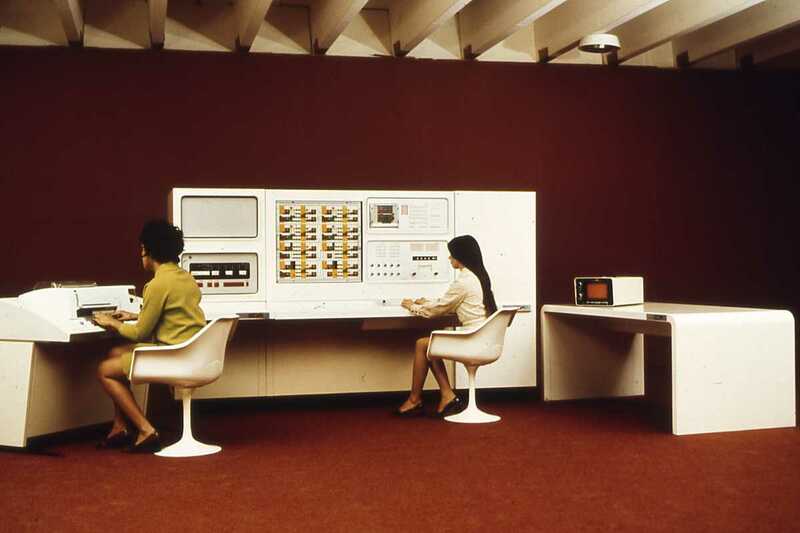 EAI Pace (231) installation at the Control Engineering Department of Cambridge University, UK, early to mid-1970s (picture source: Matthew Butler). 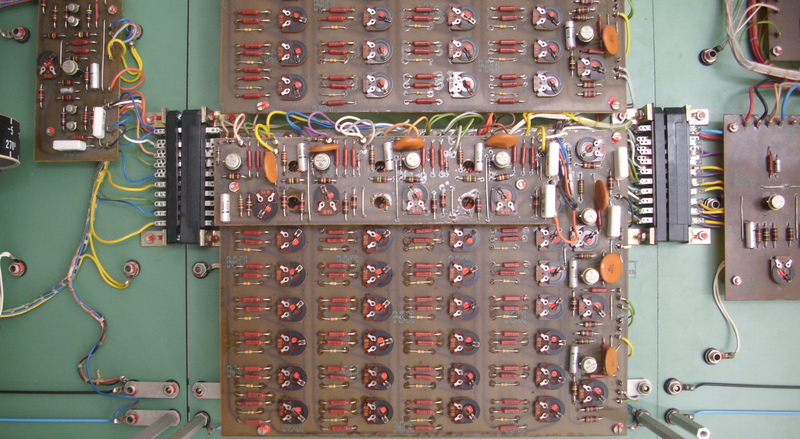 Closeup of the removable patch field of an EAI 231R analog computer (cf. 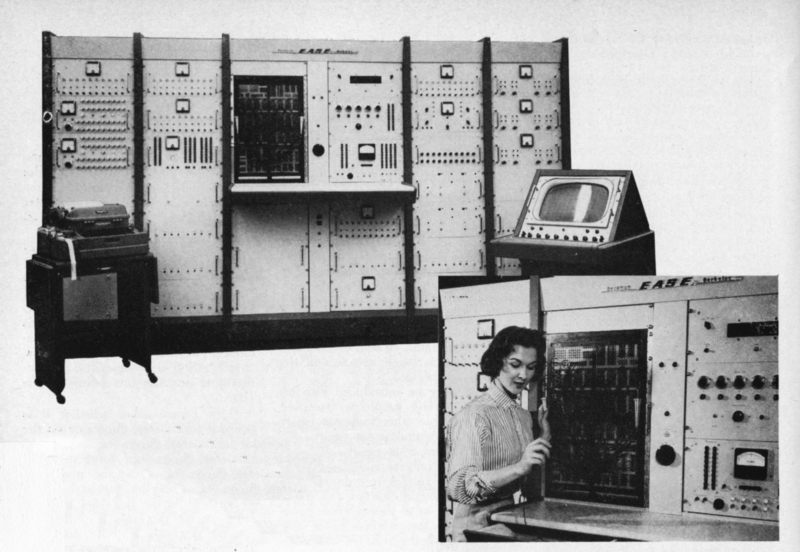 "PACE 231R analog computer", Electronic Associates, Inc., Long BRanch, New Jersey, Bulletin No. AC 6007, p. 6). The EAI 231R installation at the Deutsches Elektronensynchrotron in Hamburg (picture: Inge Borchardt). 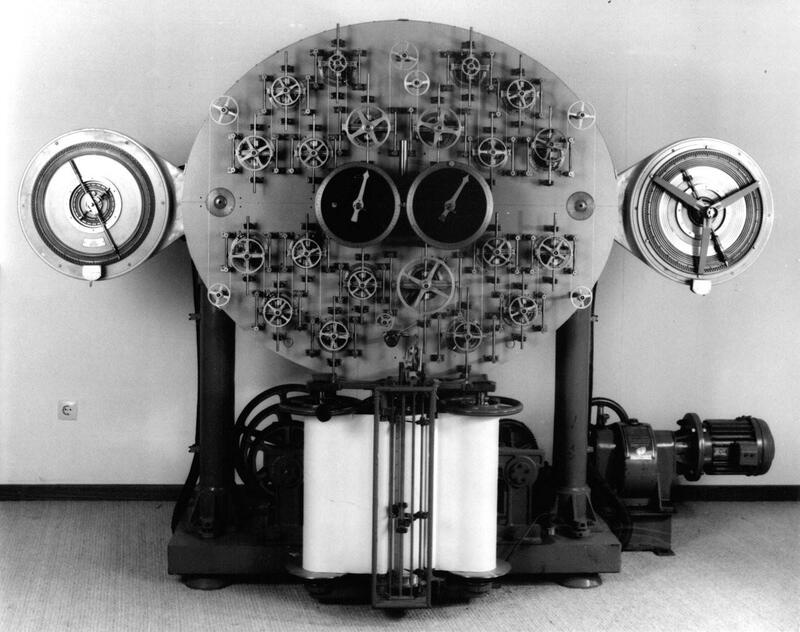 This system was mainly used to develop the magnetic lenses for the electron accelerator. 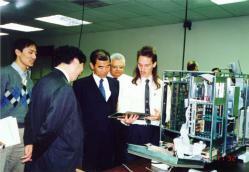 Other projects involved the development of the power supplies for the accelerator etc. 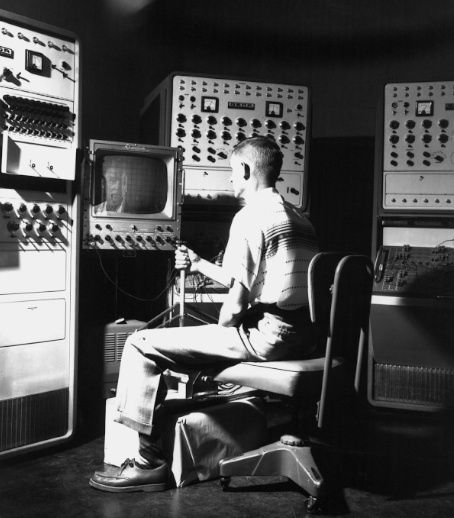 Bell developed this simulator for project Mercury which was based on an EAI 231R analog computer (cf. M. D. Fagen (Ed. 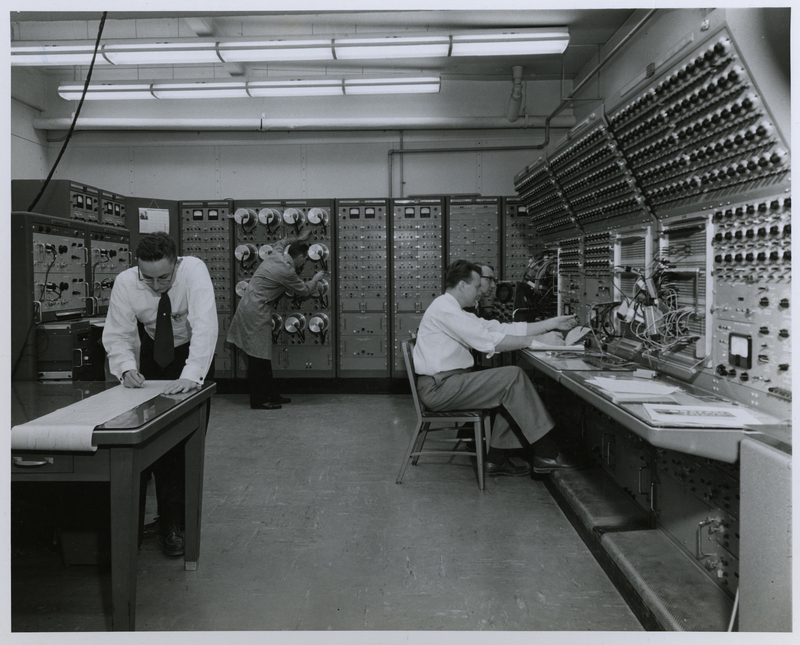 ), "A History of Engineering and Science in the Bell System - National Service in War and Peace (1925 - 1975)", Bell Telephone Laboratories, Inc., p. 569). 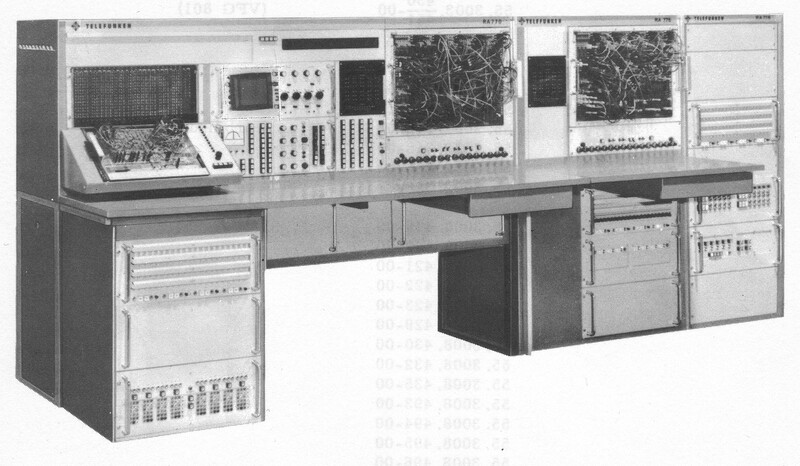 The Tactical Avionics System Simulator, TASS, about 1968 (photo: Bruce Baker). EAI 231R installation (photographer Colin Adby, thanks to James Miller). 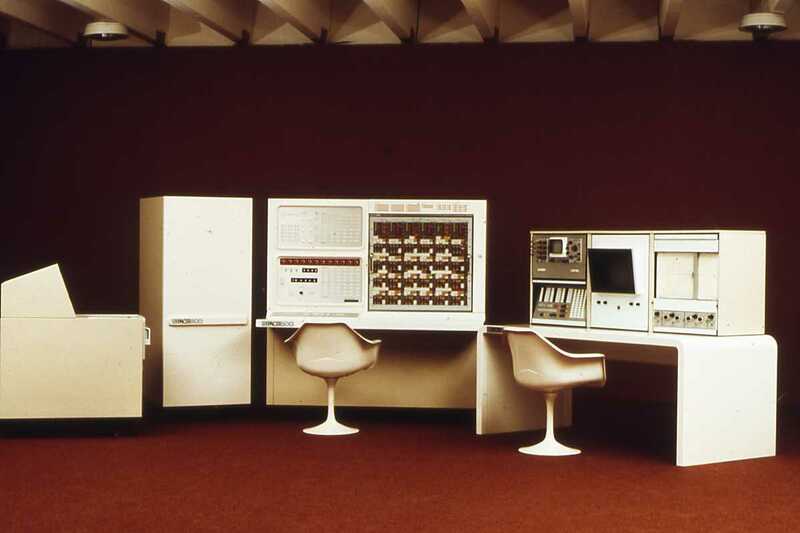 A wonderful EAI 231 computer (picture: Wolfgang Strobl). The same machine from a different perspective (picture: Wolfgang Strobl). 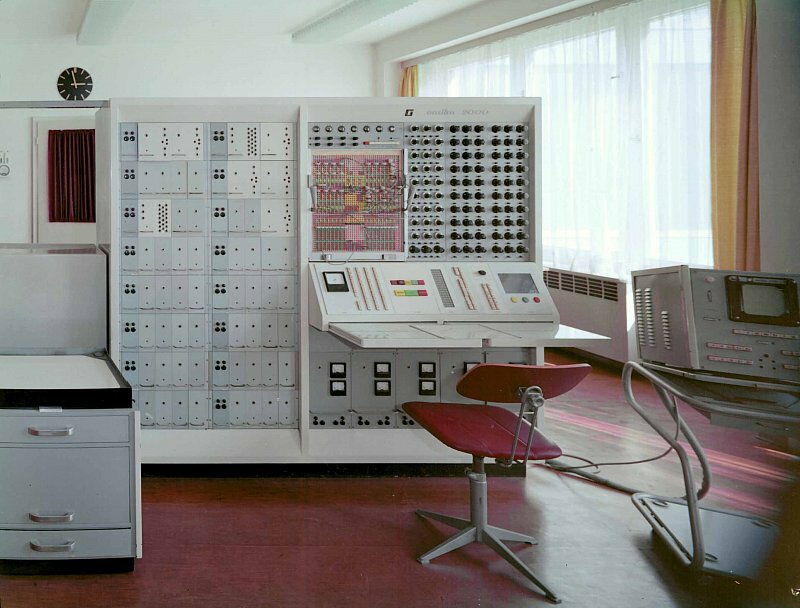 The same machine again (picture: Wolfgang Strobl). Detail of the handset potentiometers (picture: Wolfgang Strobl). 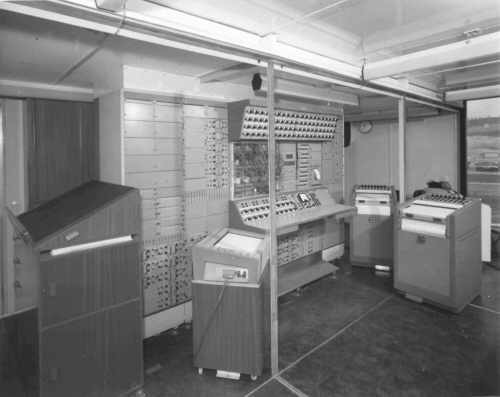 The HYDAC 2000 installation in the EAI computer center in Brussels (cf. 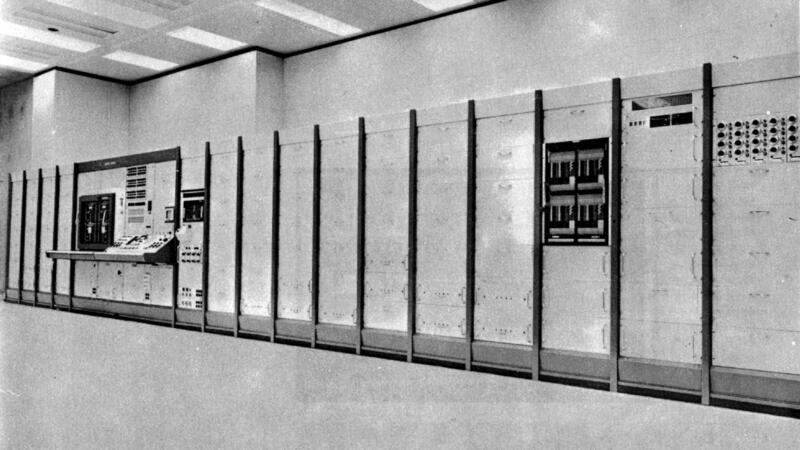 "Electronic Associates, Inc., Europäisches Rechenzentrum für Analog- und Hybridrechentechnik", in "Elektronische Rechenanlagen", 6 (1964), Heft 4, p. 214). EAI PACE installation at Convair. 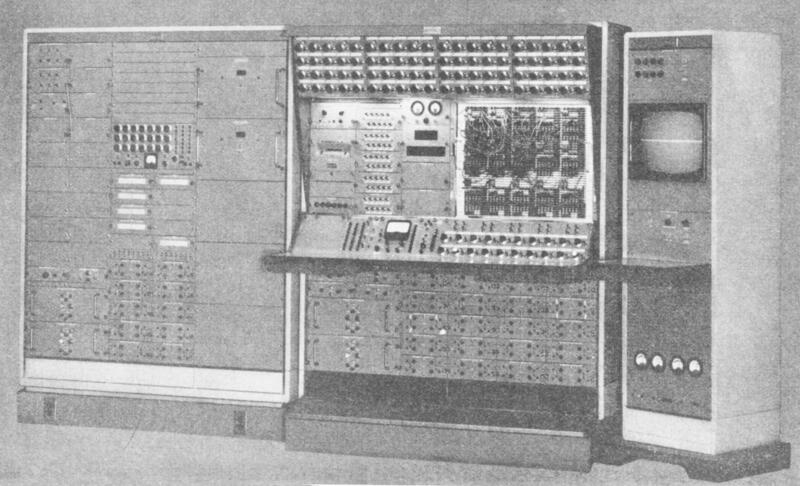 Early picture of an EAI TR-10 table top analog computer. 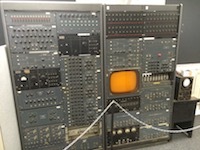 EAI TR-10 table top analog computer at the TU Darmstadt. 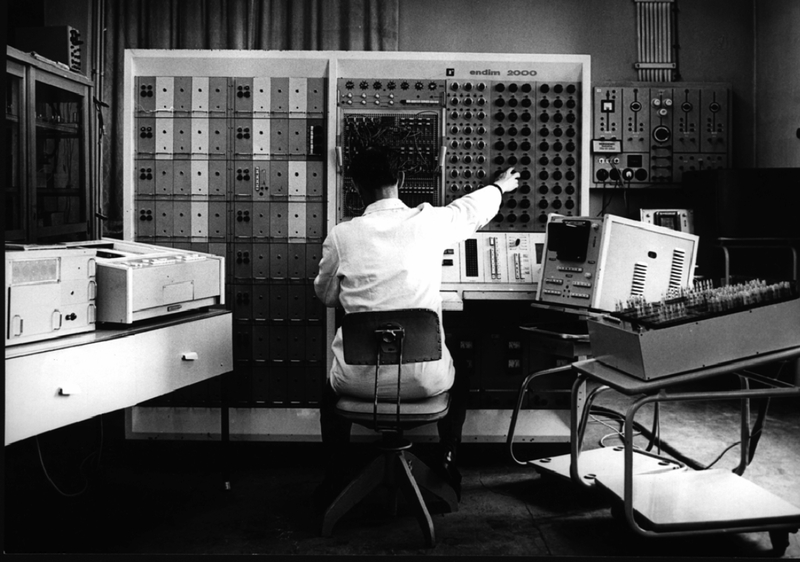 This picture shows Dr. Willi Frisch in about 1964 working on his diploma thesis with an EAI TR-10 table top analog computer at the TU Darmstadt (photo: Dr. Willi Frisch). 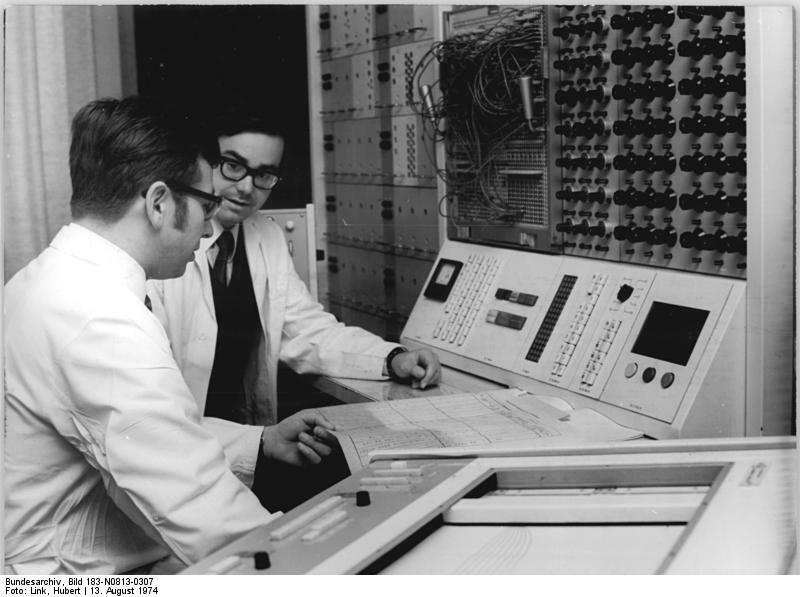 This is another picture showing Dr. Willi Frisch in about 1964 working on his diploma thesis with an EAI TR-10 table top analog computer at the TU Darmstadt (photo: Dr. Willi Frisch). 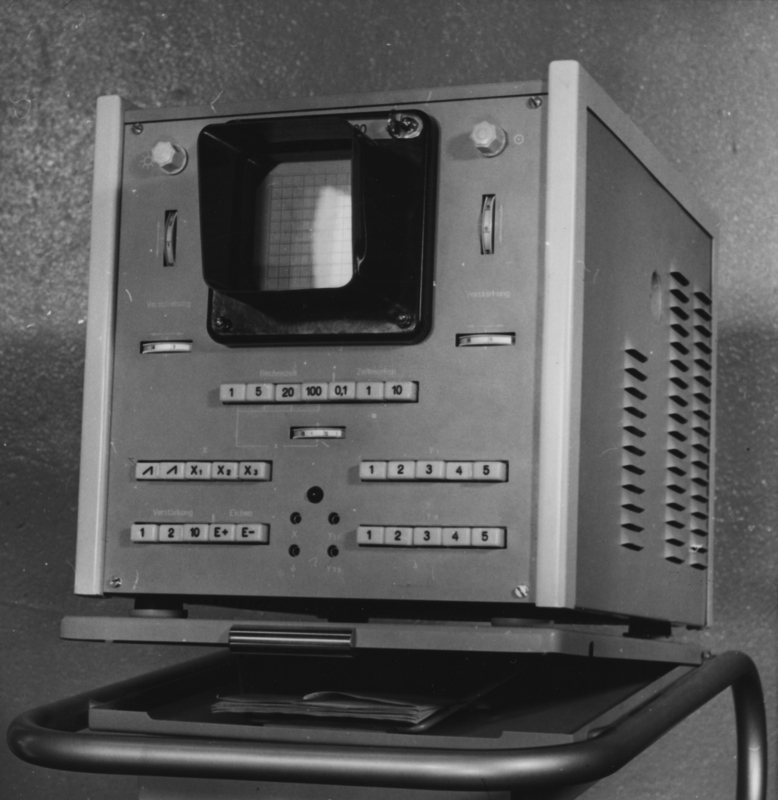 The ray tracer of Light, Badger and Barnes, based on an EAI TR-10 transistorized table top analog computer (cf. L. Light, J. Badger, D. Barnes, "An Automatic Acoustic Ray Tracing Computer", in "IEEE Transactions on Electronic Computers", Vol. EC-15, No. 5, October 1966, p. 724). 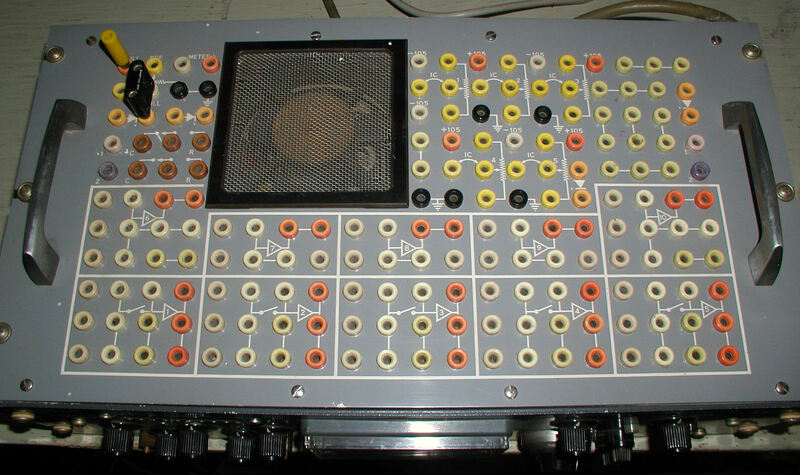 EAI TR-48 table top analog computer. 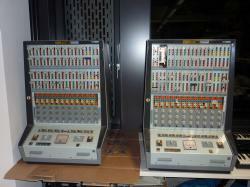 Partially populated EAI TR-48 table top analog computer (background left) and PDP-11 on the right (11/20?). 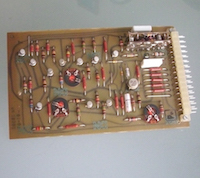 An EAI 380 transistorized analog computer. 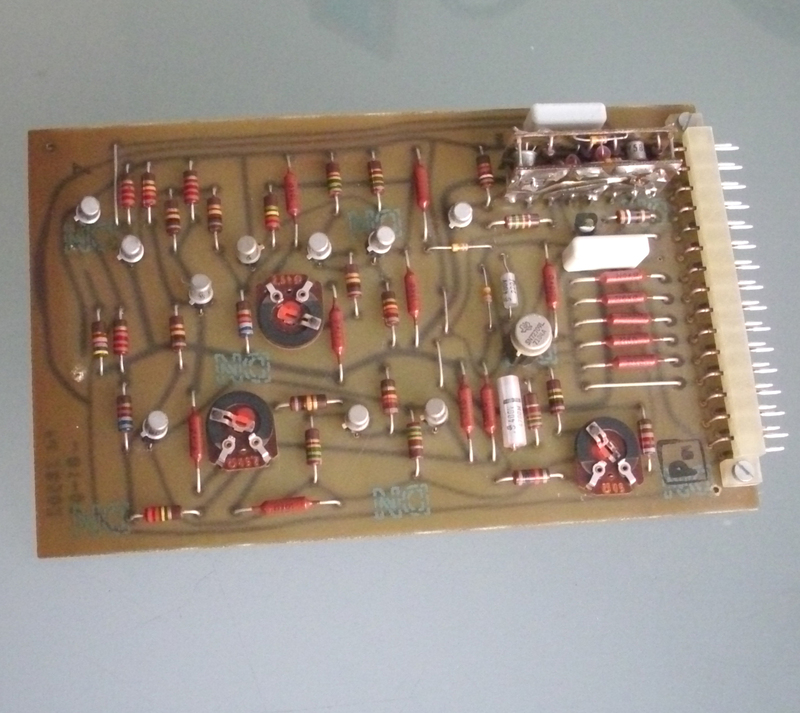 An EAI 580 transistorized analog computer. 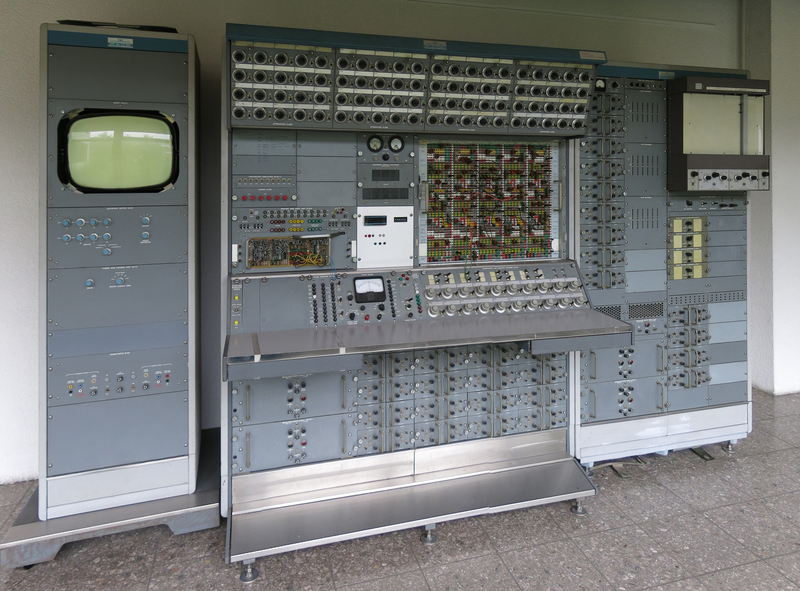 This particular machine was once used at the Institut für Mess- und Regelungstechnik of the University Karlsruhe and is now part of the collection of the Analog Computer Museum. 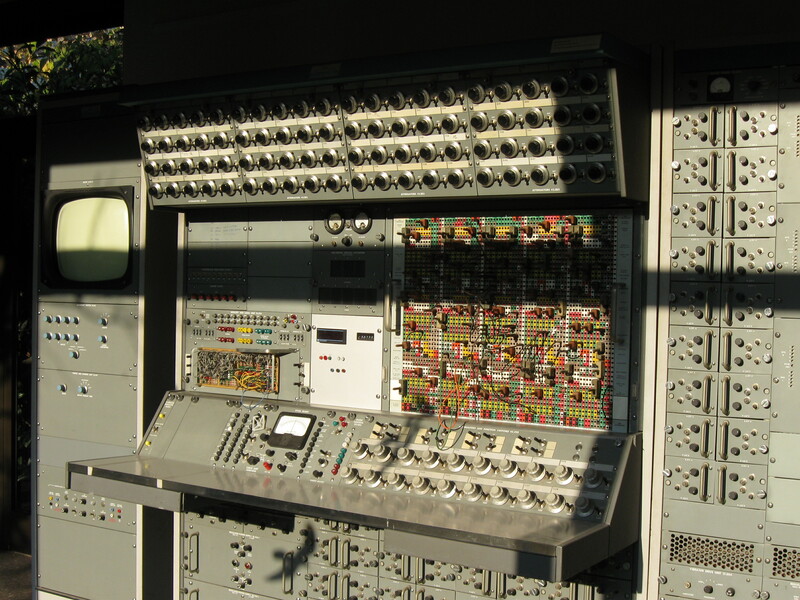 An EAI 680 transistorized analog computer. 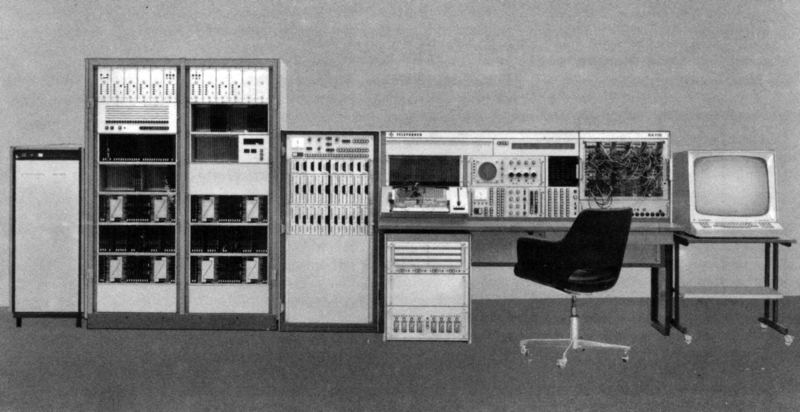 A wonderful operator's desk for an EAI 680 analog computer. 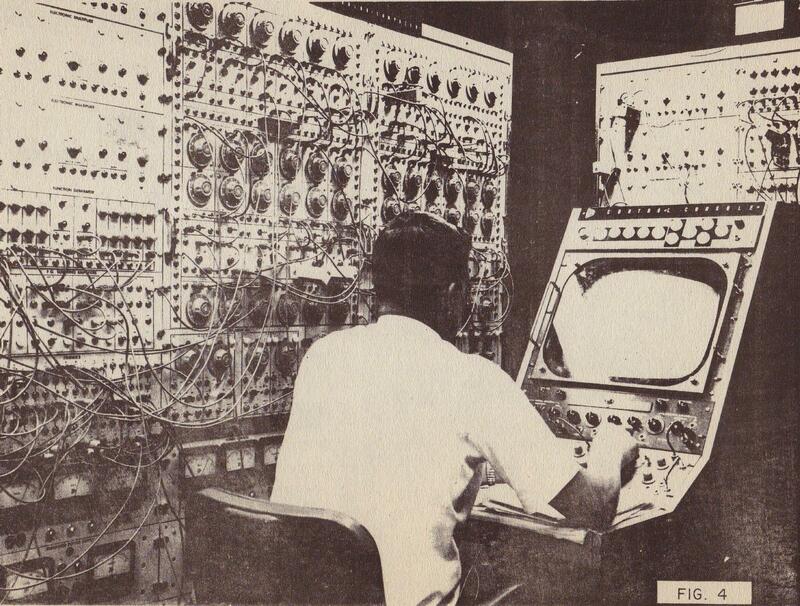 Note the electronically generated grid on the large screen oscilloscope display in the middle. EAI MiniAC - a small table top transistorized analog computer. A rather large EAI Pacer hybrid computer installation - the rack on the left holds the digital processor. 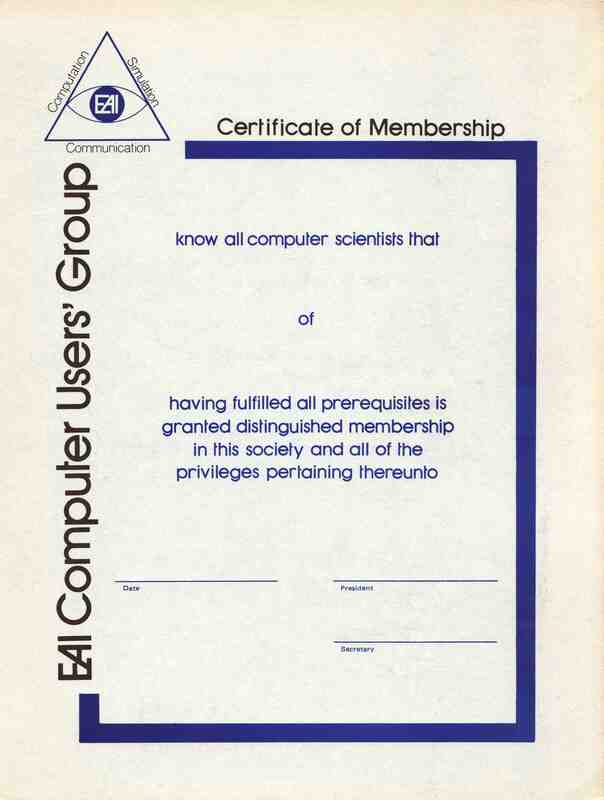 Yet another EAI Pacer hybrid computer installation. 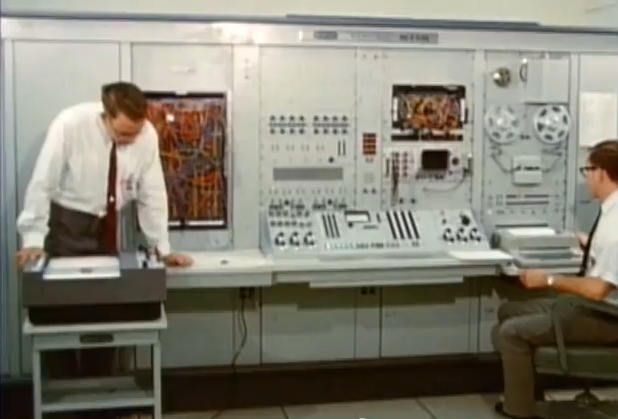 And another EAI Pacer hybrid computer installation. 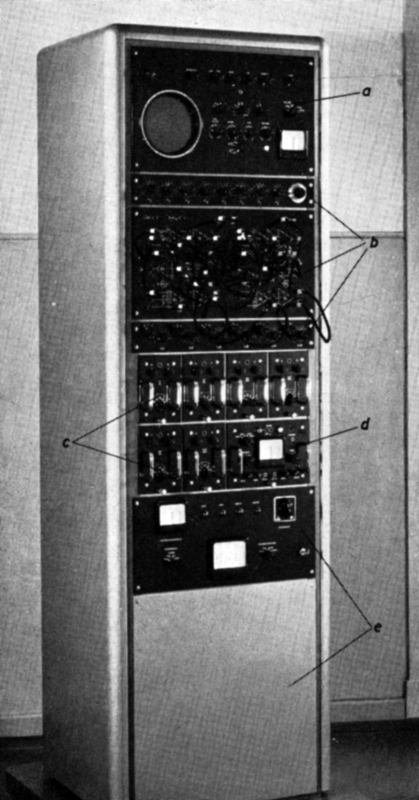 The stand alone rack on the left contains the AD/DA-converters and the necessary control logic to interface the digital processor with the analog computer. EAI curve follower. 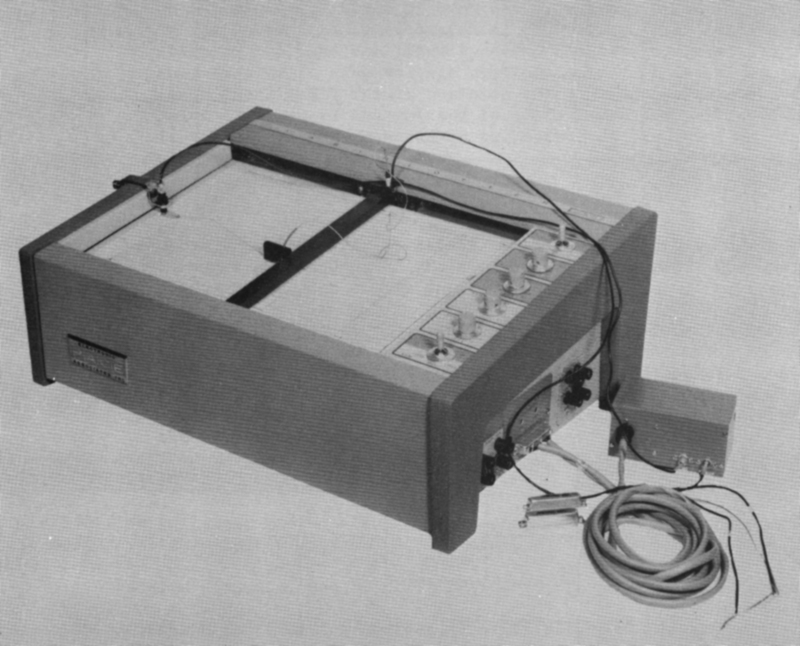 This device was based on a conventional X/Y-plotter which was extended with a pickup and a small servo circuit that allowed the plotter to follow a trace painted on paper representing the function desired. 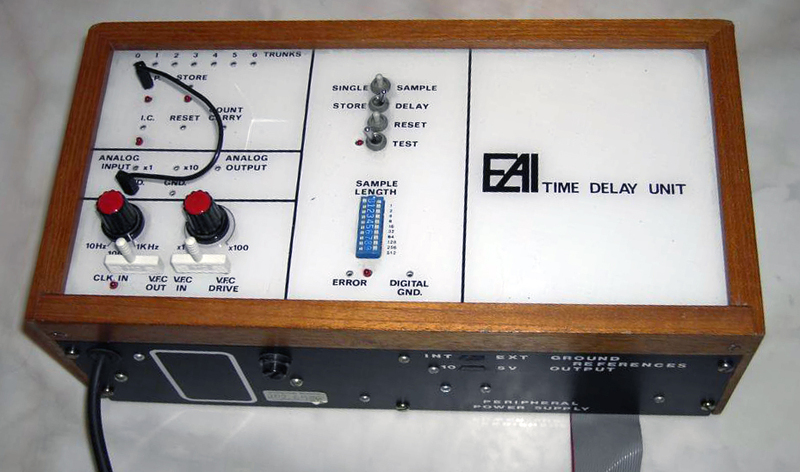 EAI delay line, used to simulate processes with a time lag. 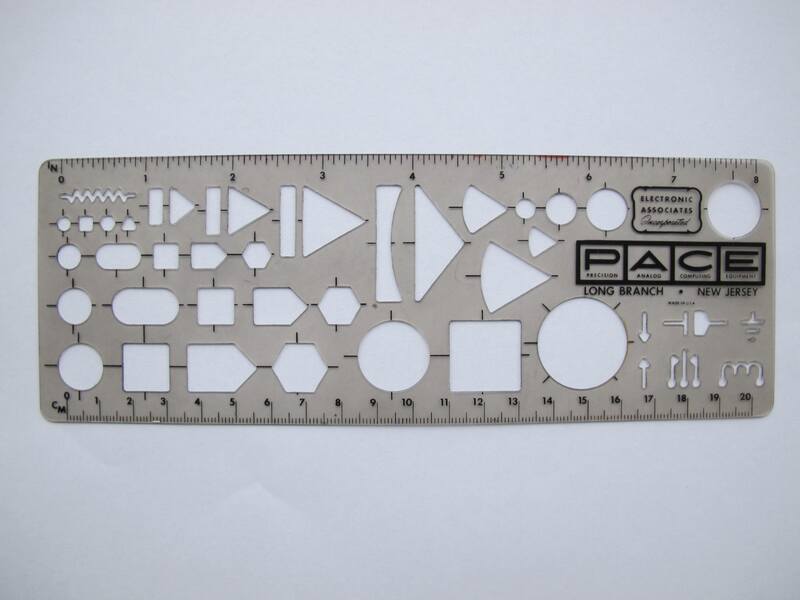 EAI drawing template, picture by Mr. Graham Barton. EAI 380 computer, courtesy of Dr. Peter Guida MD. 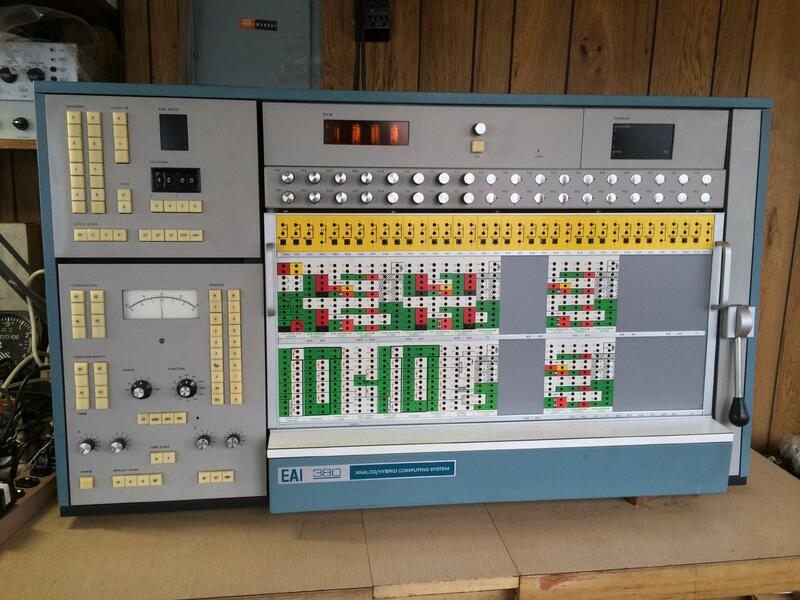 EAI display control panel (picture: Anthony Lavillonniere). 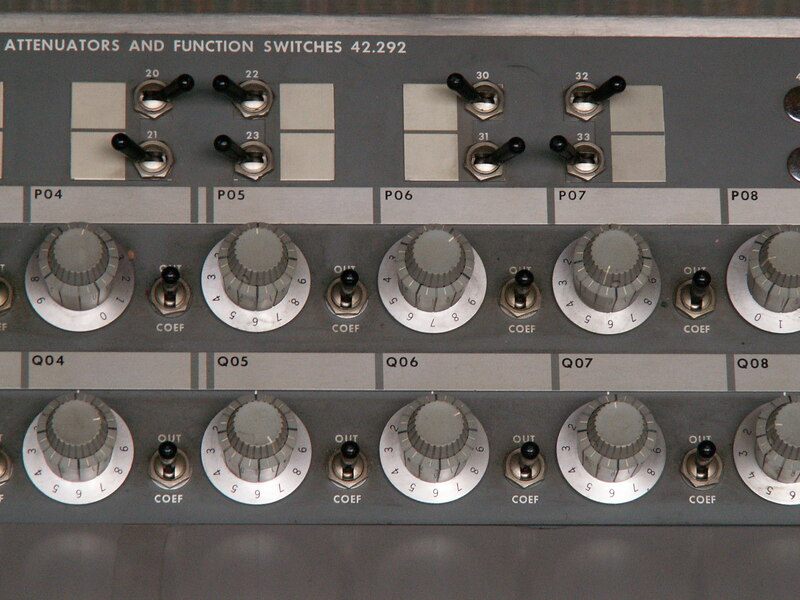 EAI Starlight arithmetic control module (courtesy of John Douceur). 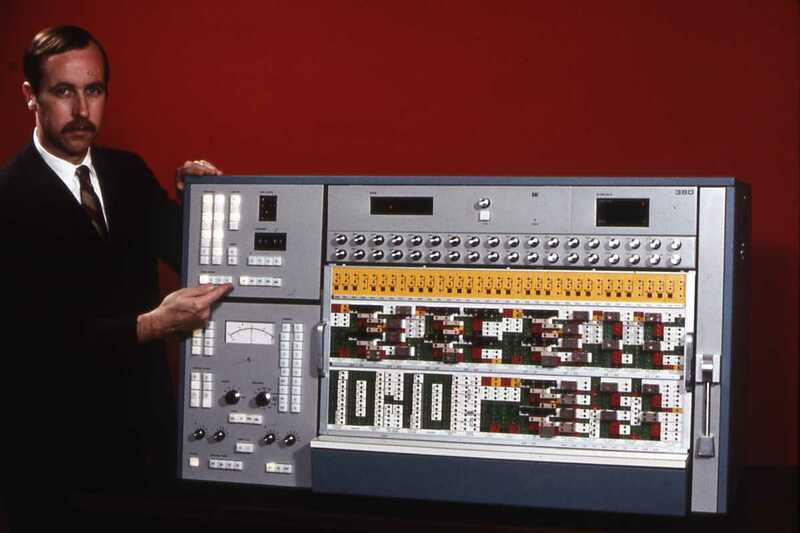 EAI Starlight, John Douceur showing one of its modules (courtesy of John Douceur). 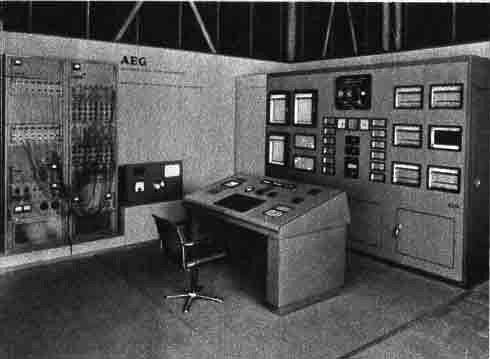 The GEDA (Goodyear Electronic Differential Analyzer) Power Dispatch Computer (cf. 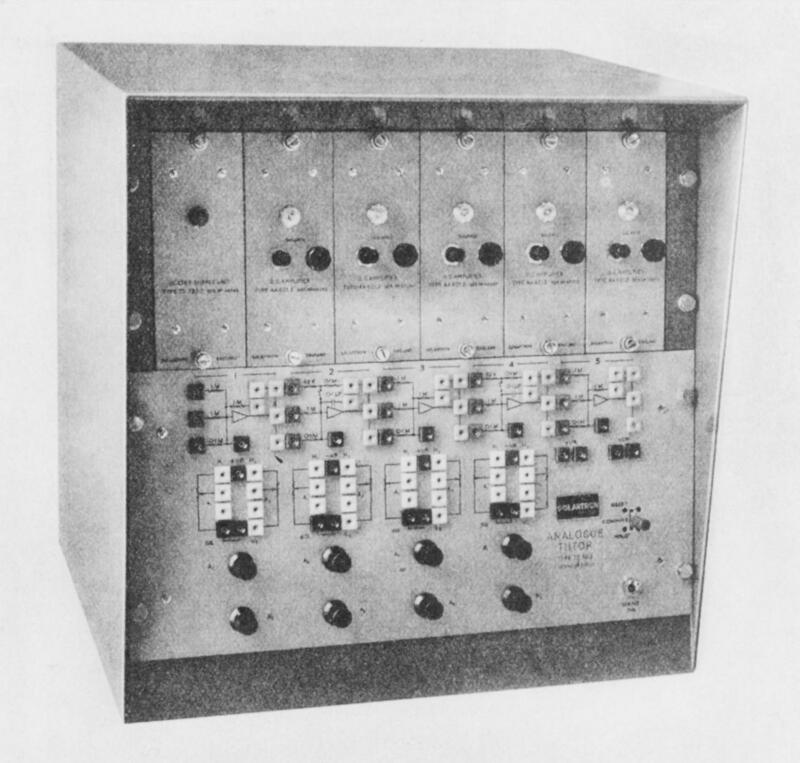 "New GEDA Power Dispatch Computer", in "Instruments and Automation", Vol. 30, Feb. 1957, p. 157). 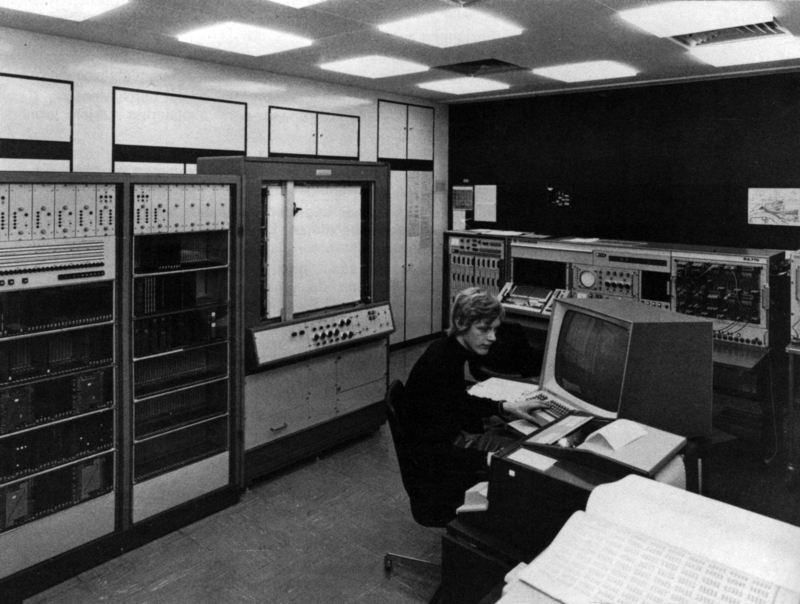 Richard Day runs a inertia-coupling simulation which was implemented on GEDA analog computers (NASA photo E-1841). 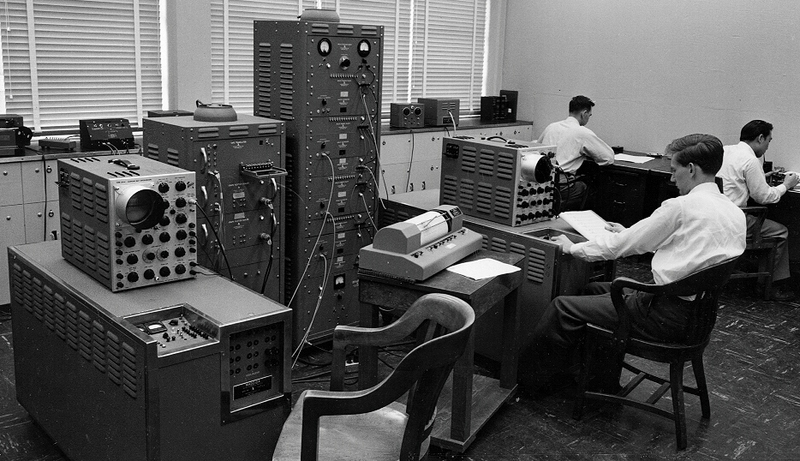 Installation of GEDA analog computers at NACA, October 1956 (NASA photo E-2626). 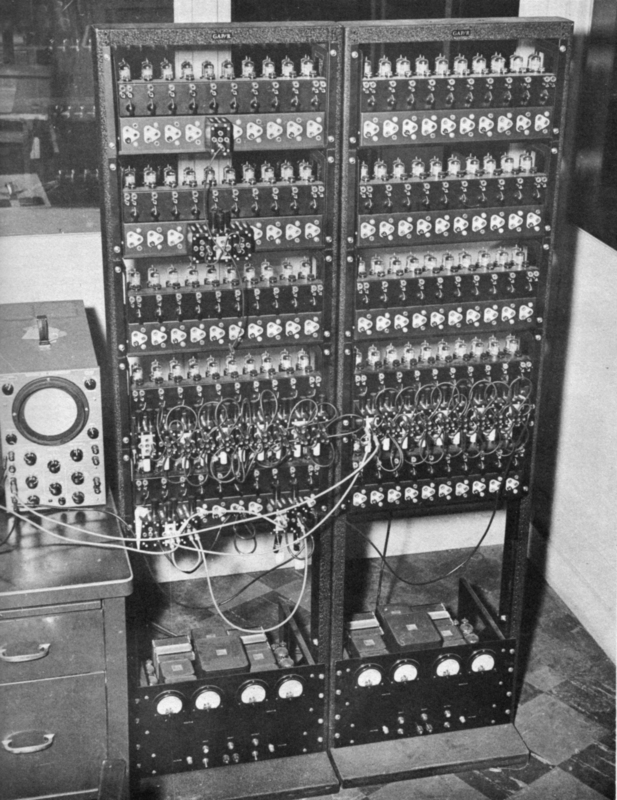 This is a picture of the first electronic analog computer developed and built by Dr. Helmut Hoelzer in Peenemünde as it was used after WWII at the Redstone Arsenal (source: Marshall Space Flight Center). 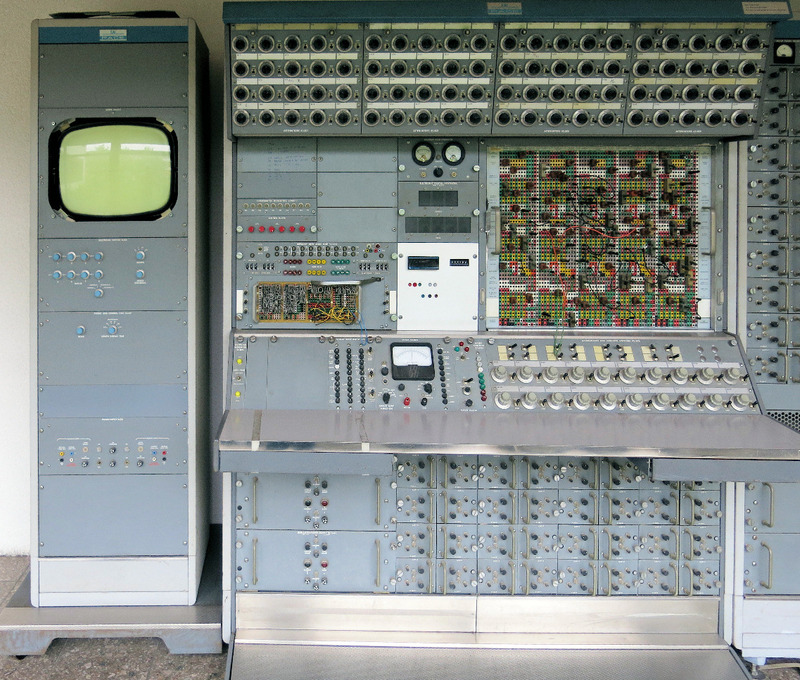 This picture shows the so called Mischgerät - world's first fully electronic on-board computer that was used to guide the A4 rocket (photo: Adri de Keijzer). 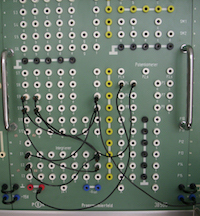 Patchpanel from a HSI SS 100 analog computer used at the famous car simulator at Volkswagen (Germany) (picture: Dr. Bernd Richter, Dr. Walter Zimdahl). 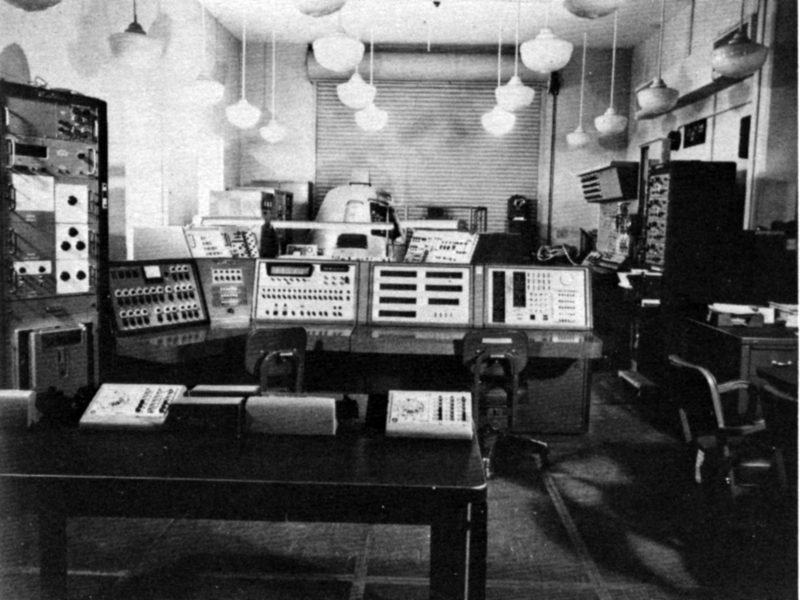 In 1959 the development of the EARI (short for "Elektronische Analogierechenanlage Ilmenau") was completed at the "Institut für Physik" of the "Hochschule für Elektrotechnik Ilmenau in the German Democratic Republic. This machine consisted of 16 operational amplifiers, seven quad-potentiometer units, seven drawers with two adders each, five multipliers, six inverters, three oscilloscopes, two compensating voltmeters, three special function generators etc. (cf. this paper). 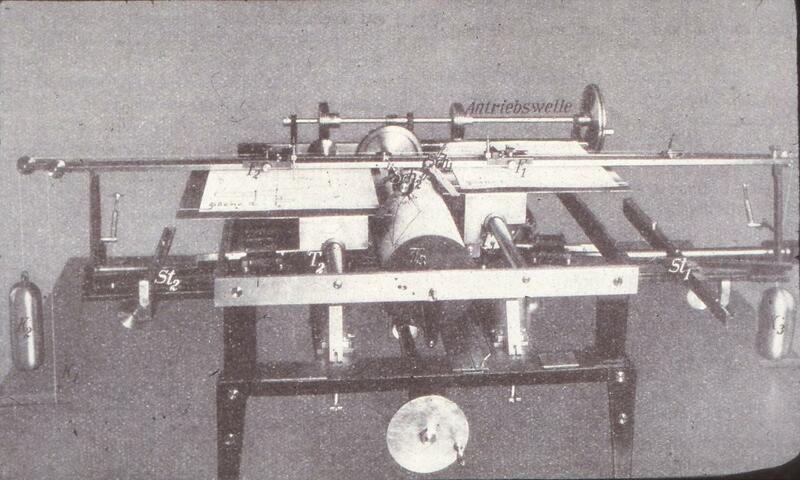 This picture shows a top view of the "Fahrdiagraph" developed by Udo Knorr (patented in 1920) This device was a true differential analyzer with feedback and predates the machines developed by Vannevar Bush (picture source: Dr. Ralf Bülow). Side view of the "Fahrdiagraph". 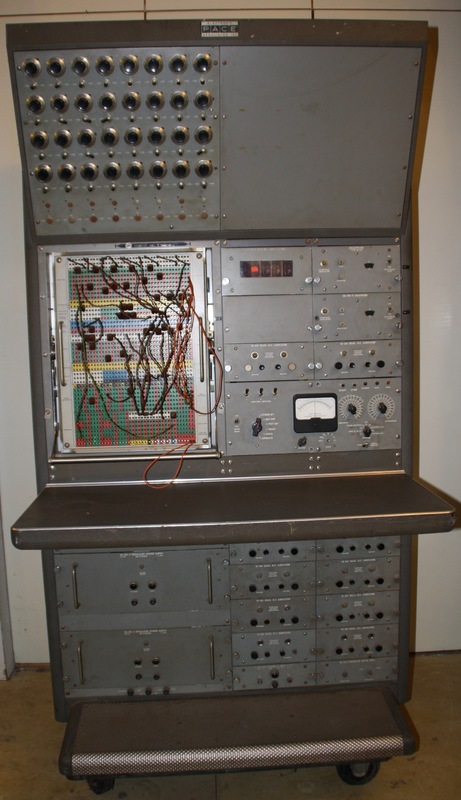 The production model of MADDIDA used in the Navy Electronics Laboratory (NEL, File Number E1278). 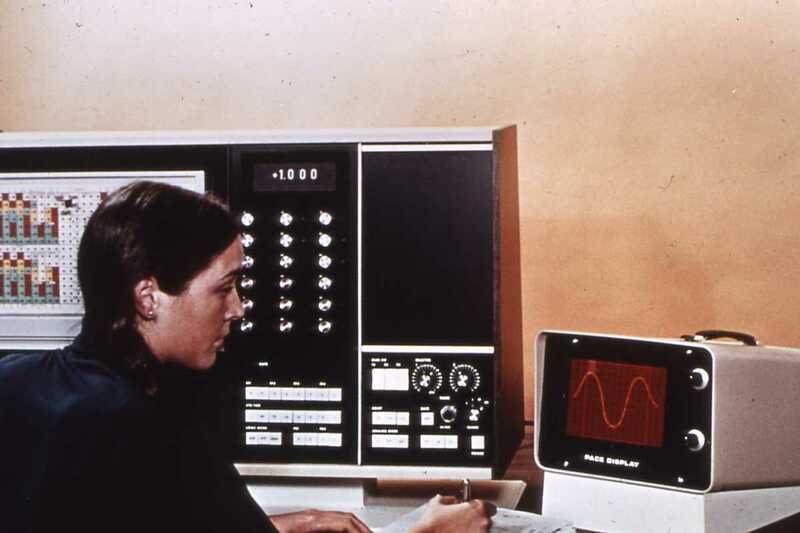 The Packard Bell TRICE DDA, a so called Digital Differential Analyzer - a digital analog computer (cf. W. Ameling, "Aufbau und Arbeitsweise des Hybrid-Rechners TRICE", in "Elektronische Rechenanlagen", 5 (1963), Heft 1, p. 30). 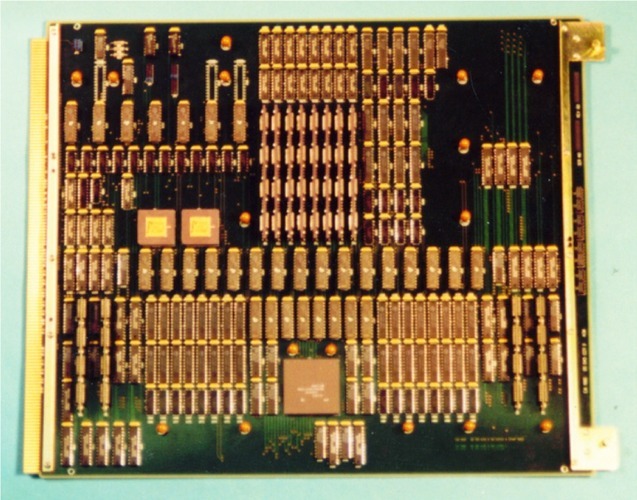 Closeup of a multiplier module of the Packard Bell TRICE DDA, a so called Digital Differential Analyzer - a digital analog computer (cf. W. Ameling, "Aufbau und Arbeitsweise des Hybrid-Rechners TRICE", in "Elektronische Rechenanlagen", 5 (1963), Heft 1, p. 30). 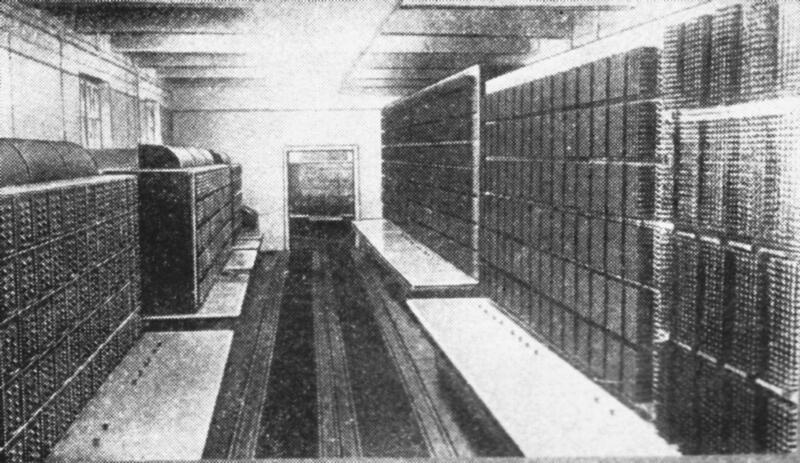 Philbrick analog computer installation at the Pullman-Standard Car Manufacturing Company (cf. 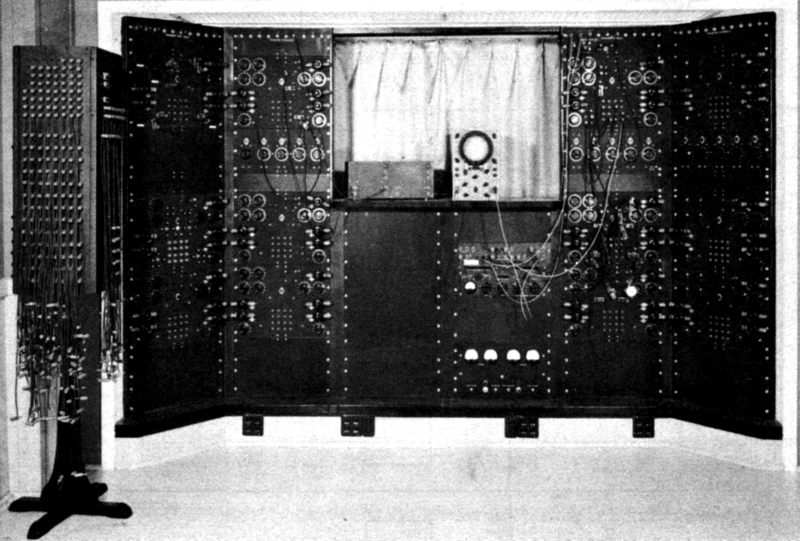 Jerry Roedel, "History and Nature of Analog Computors", in Henry M. Paynter (Ed. ), "A Palimpsest on the Electronic Analog Art", printed by Geo. A. Philbrick Researches Inc., AD 1956, p. 488). "In 1956 I was a tech in the Test Instrumentation group, with GE's Aircraft Gas Turbine division in Cincinnati (Evendale) Ohio. 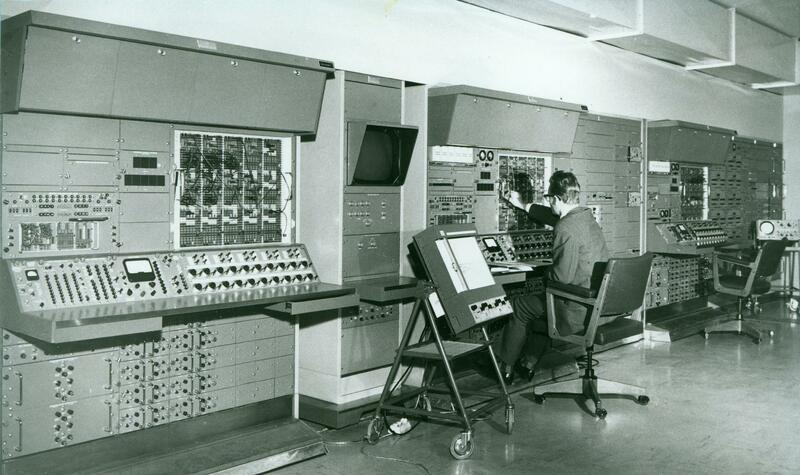 We were simulating some of the engine control test functions using op-amps and Philbrick 'black-cube' modules. 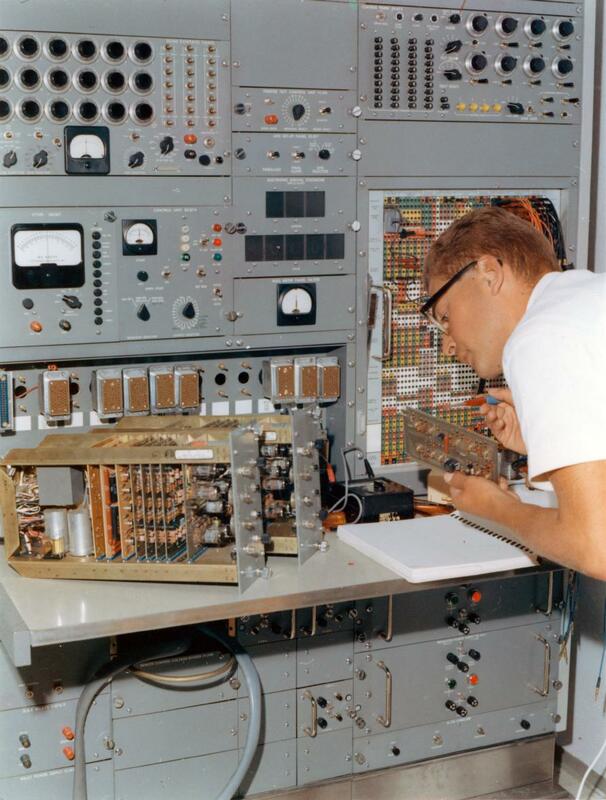 By 1961 I had moved to Procter & Gamble to work in the Instruments and Controls section of the Engineering Development division, then located at the company's Miami Valley Laboratories. 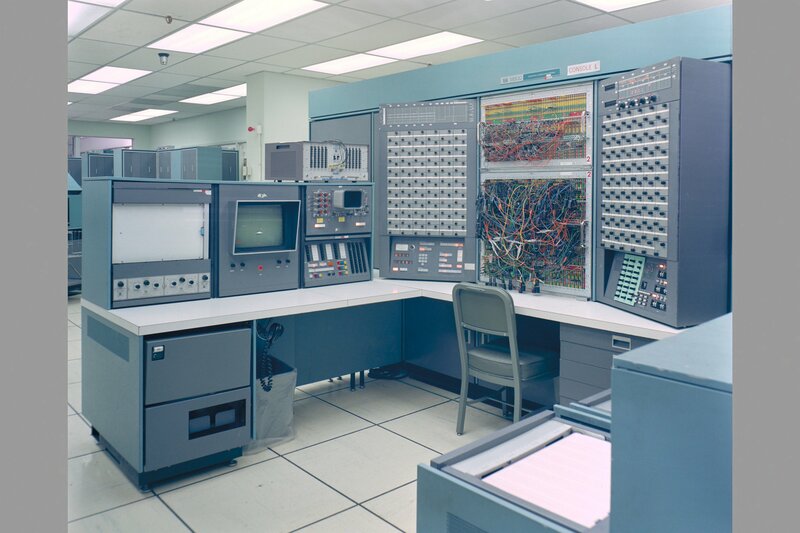 Because of my past experience with Philbrick, I was selected to head the analog computing effort there, where we simulated control systems being developed for use in P&G's many production facilities which ranged from detergents to paper products to edible oil refineries. About 1963, another engineer and I were asked to produce papers outlining the best systems for computation -- I argued for analog systems due to the complexity of the analyses and the high frequency components of much of our data. My associate was assigned digital computation, using the then-available 8-bit, punched-paper-tape fed machines. 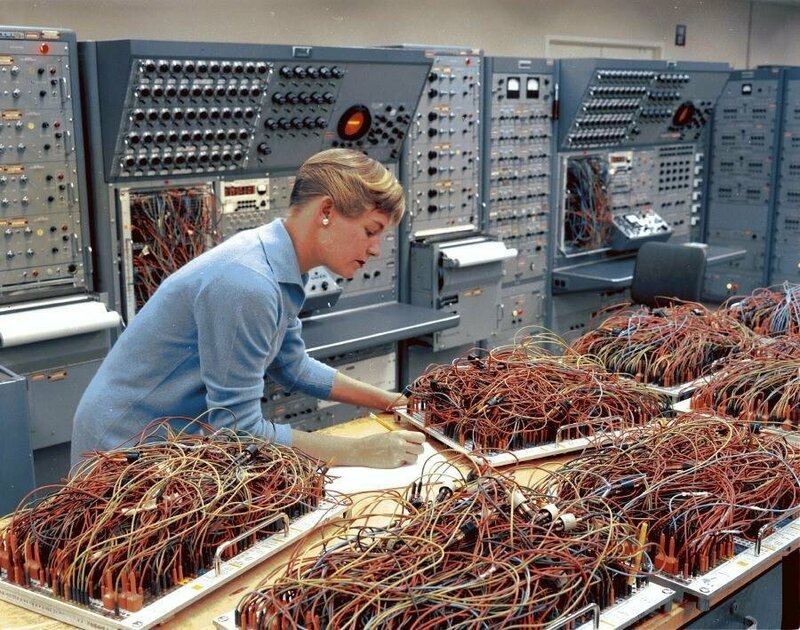 As you can guess, the analog systems were greatly superior on that day... but the future was just around the corner. 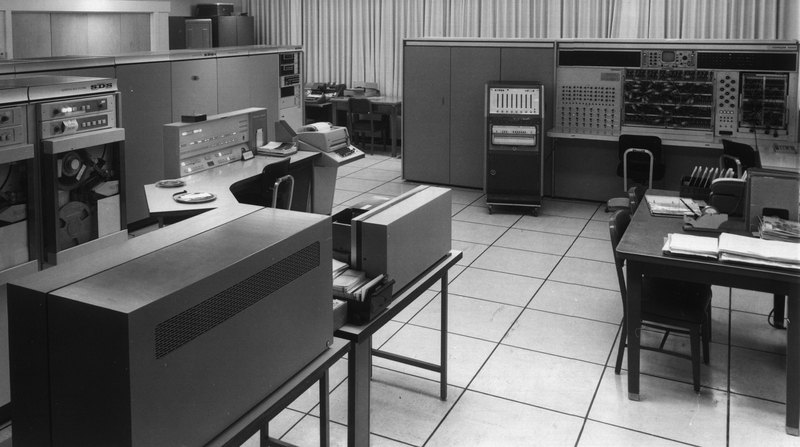 To this day I'd love to know where all of those Philbrick black boxes went, when the first IBM digital computers were purchased. At the time I didn't care because I was too busy learning to program machine language 16-bit variable word length digital computers. 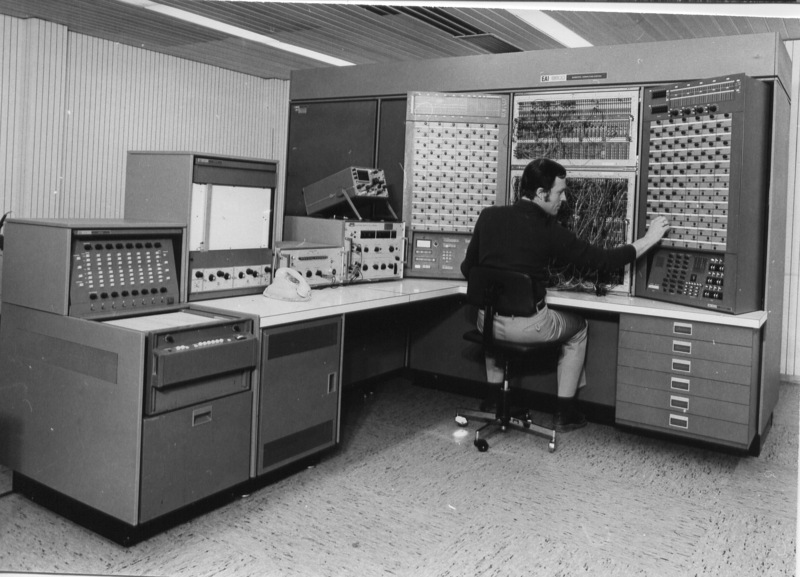 Ah - and then IBM allowed us to "try" their latest advance - Fortran. We never looked back. 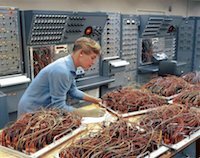 But I still fondly remember GAP's little black cubes, resistors and capacitors on dual-banana-plugs, miles of black and red test wire, signal generators and oscilloscope patterns." 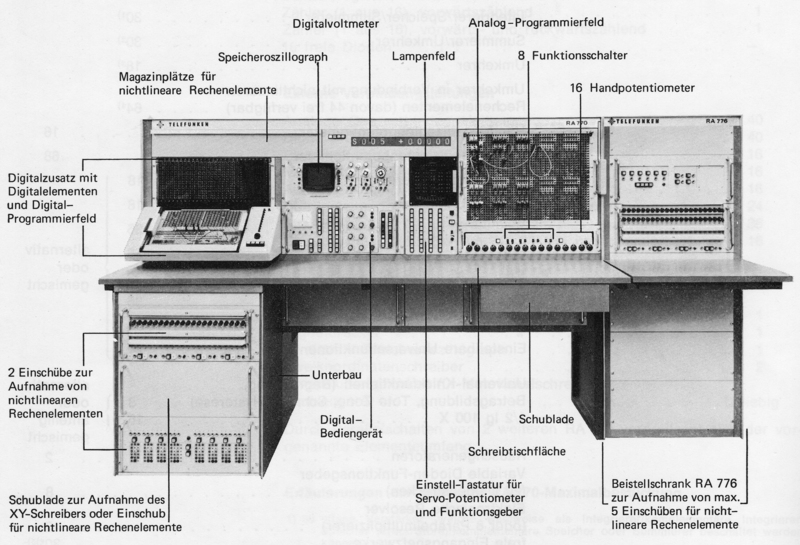 The ENDIM 2000 analog computer was a tube based design developed and manufactured in the former German Democratic Republic at "Rechenelektronik Glashütte". About 20 machines were produced - only one seems to have survived at the Technische Sammlungen Dresden. 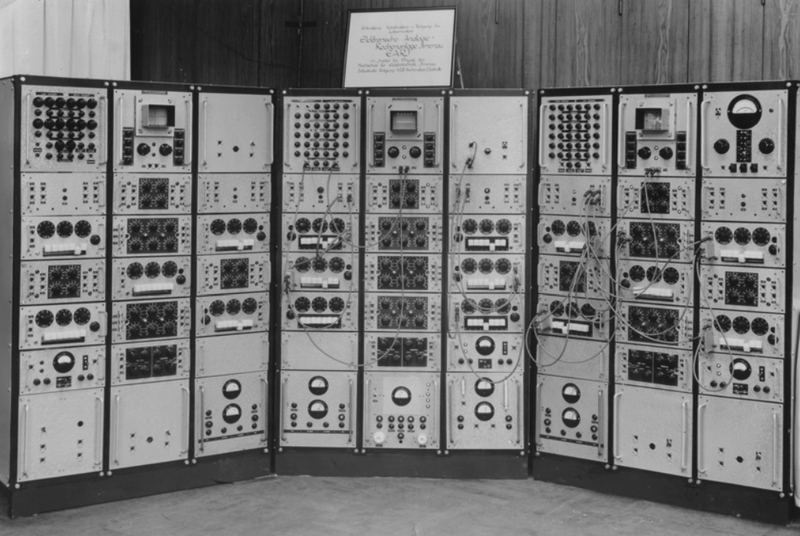 A maximum configuration contained 64 chopper stabilized amplifiers (32 integrators/summers + 32 summers), 12 multipliers, 16 function generators and 90 coefficient potentiometers (cf. this paper). 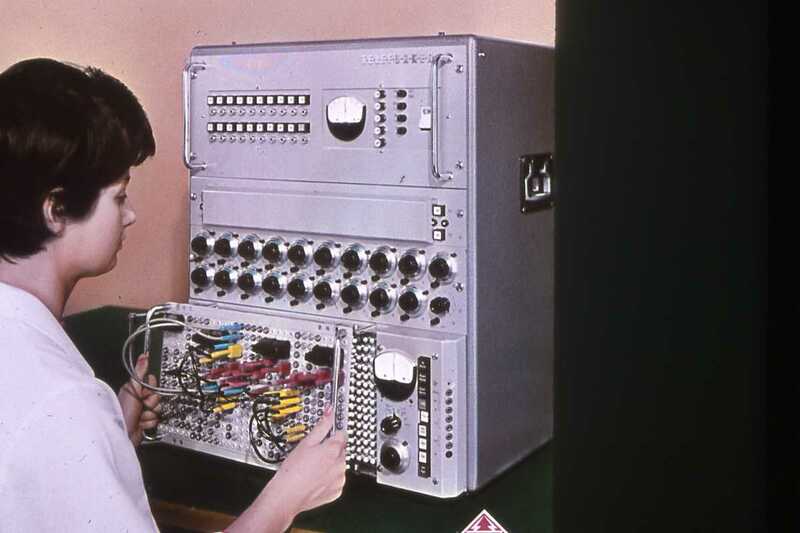 This picture of an ENDIM 2000 analog computer is from the Universität Halle. 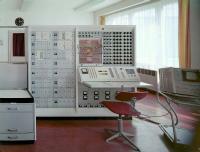 Another picture of an ENDIM 2000 installation (Bundesarchiv). 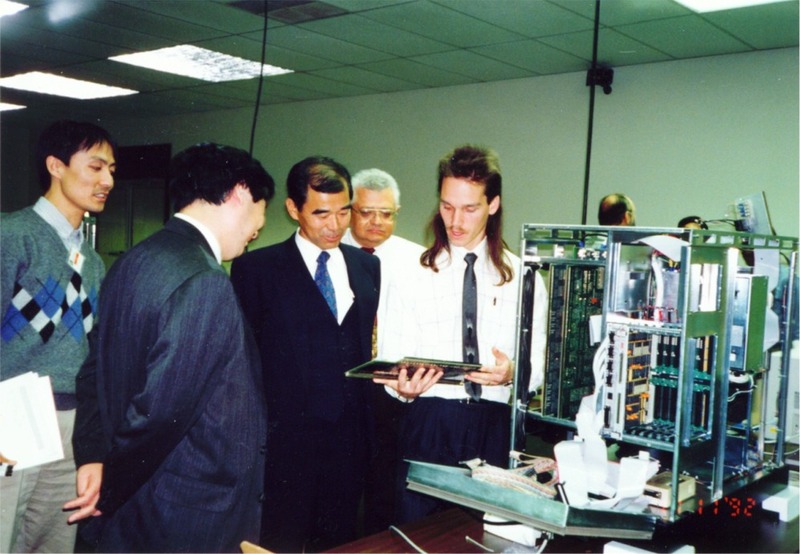 ENDIM 2000 with peripheral units in operation (this picture was taken from here). 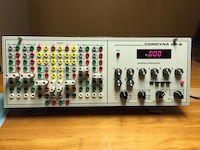 Special purpose oscilloscope for the ENDIM 2000 analog computer. 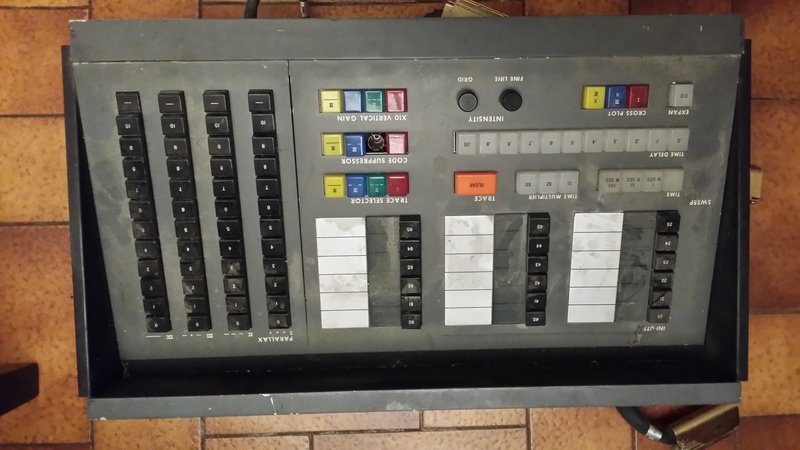 REAC analog computer with automatic setup feature. 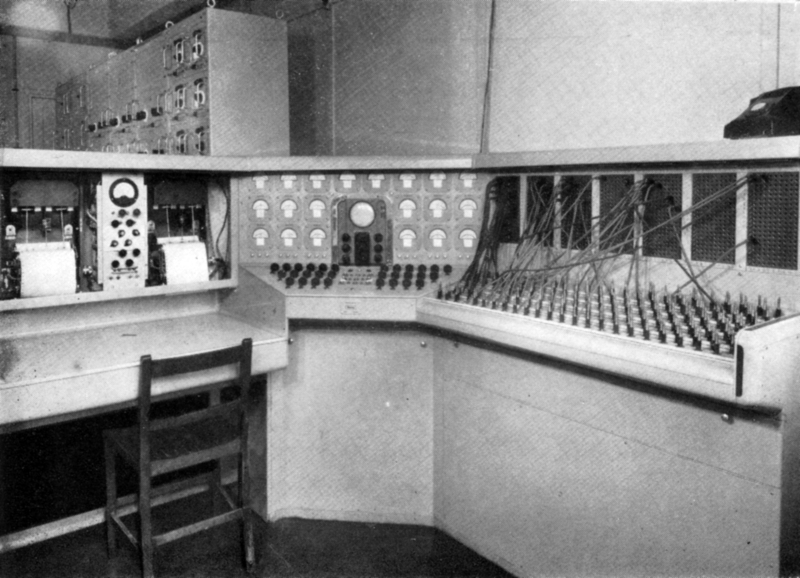 Control desk of the GEPUS analog computer (cf. C. A. A. Wass, "Introduction to Electronic Analogue Computers", London, Pergamon Press Ltd., 1955, p. 209). 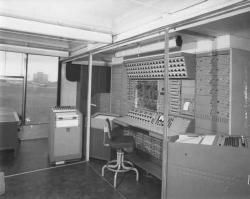 Control room of the TRIDAC analog computer (cf. C. A. A. Wass, "Introduction to Electronic Analogue Computers", London, Pergamon Press Ltd., 1955, p. 214). 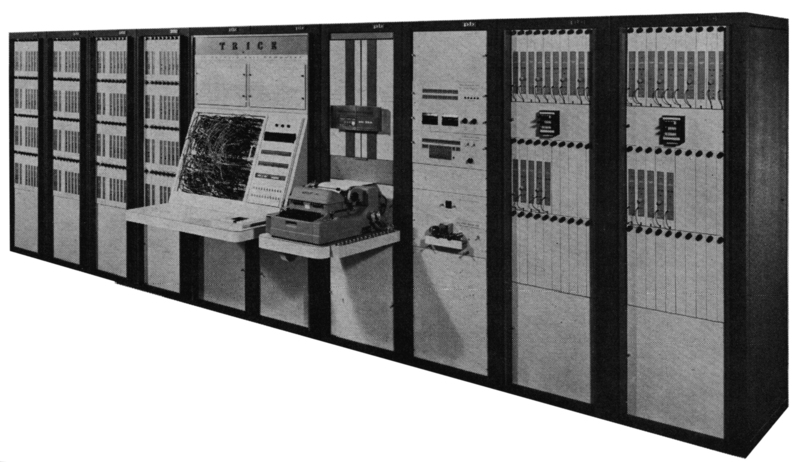 Overall structure of the TRIDAC analog computer (cf. C. A. A. Wass, "Introduction to Electronic Analogue Computers", London, Pergamon Press Ltd., 1955, p. 214). 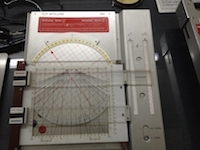 Swash plate based function generator for trigonometric functions as used in the TRIDAC analog computer (cf. C. A. A. Wass, "Introduction to Electronic Analogue Computers", London, Pergamon Press Ltd., 1955, p. 214). Tube based Solartron Minispace analog computer. Tube based Solartron Tutor analog computer with only five chopper stabilized operational amplifiers and eight coefficient potentiometers. 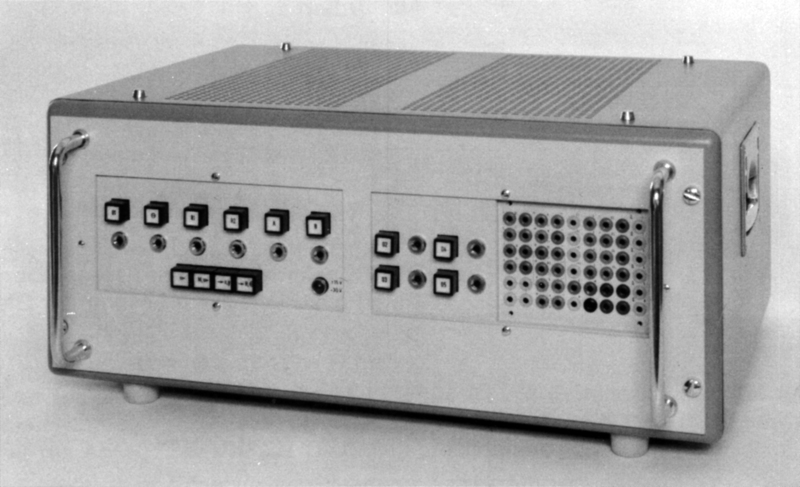 Front view of a Systron-Donner 3500 portable analog computer (source: Bill Degnan). 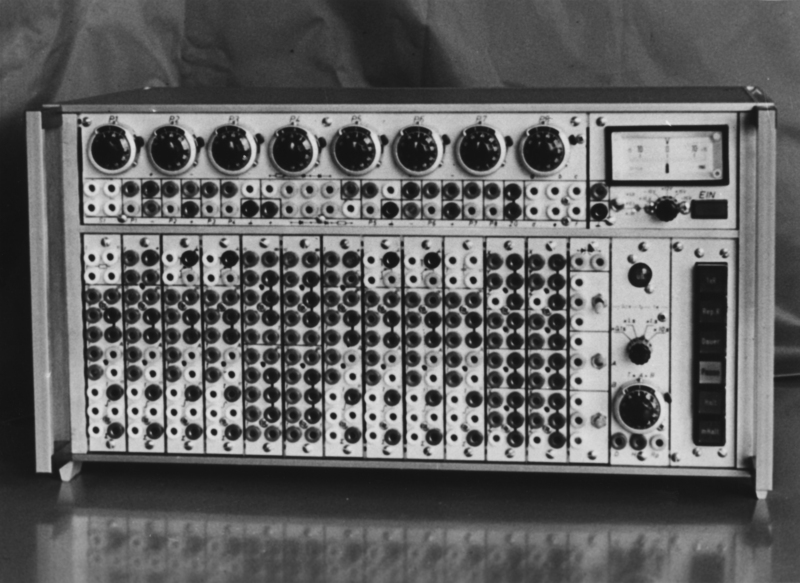 Top view of a Systron-Donner 3500 portable analog computer (source: Bill Degnan). 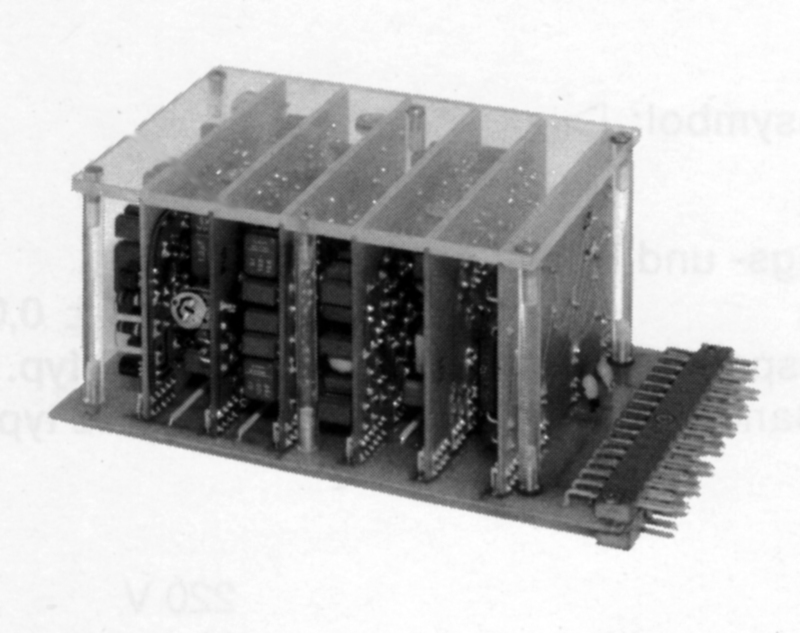 In 1956 Space Technology Laboratories delivered the first so called ADDAVERTER - a multichannel D/A-/A/D-converter which was used to build hybrid computers out of an analog computer and a digital processor. 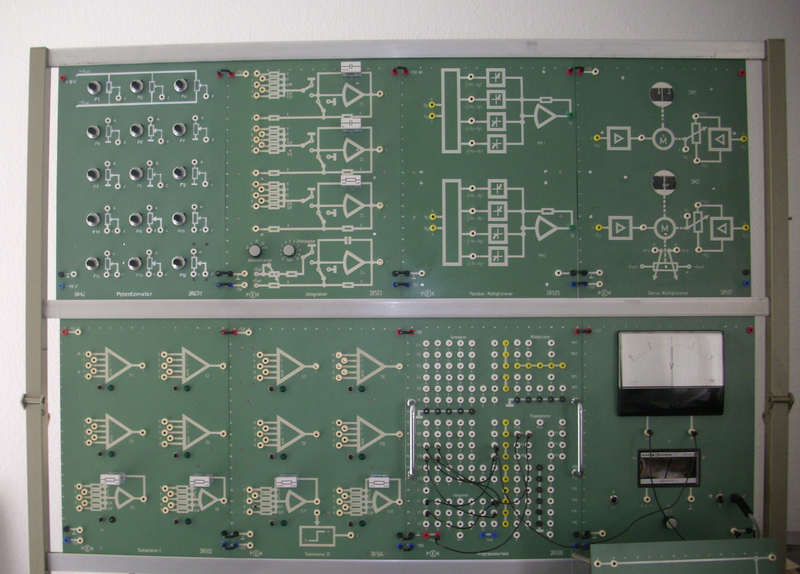 The ADDAVERTER shown here has 15 A/D- and 10 D/A-channels with a range of +/- 100 V and a precision of 0.1 percent. 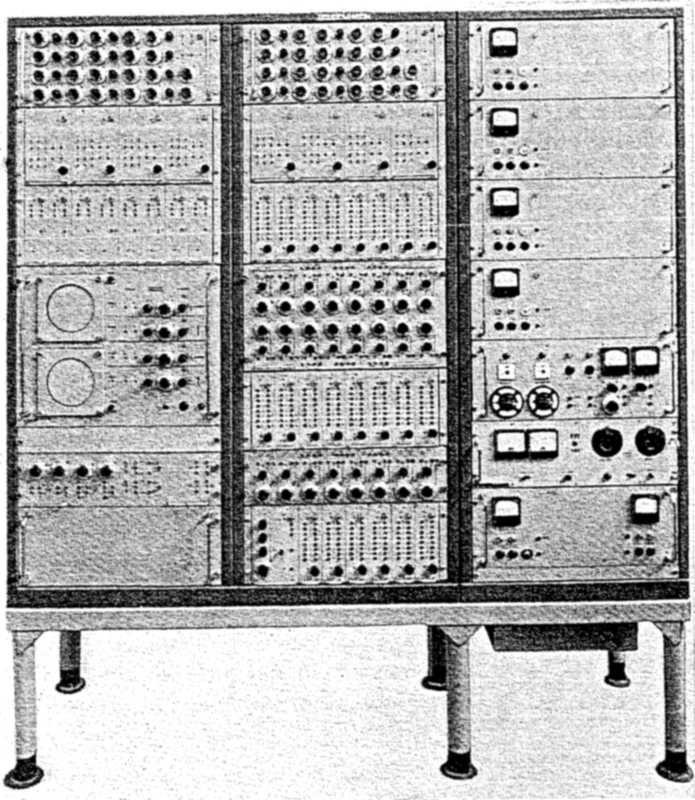 The picture was taken out of "Combined Analog and Digital Systems - Why, When and How" by John H. McLeod and Robert M. Leger, published in "Instruments and Automation", June 1957, p. 1129. 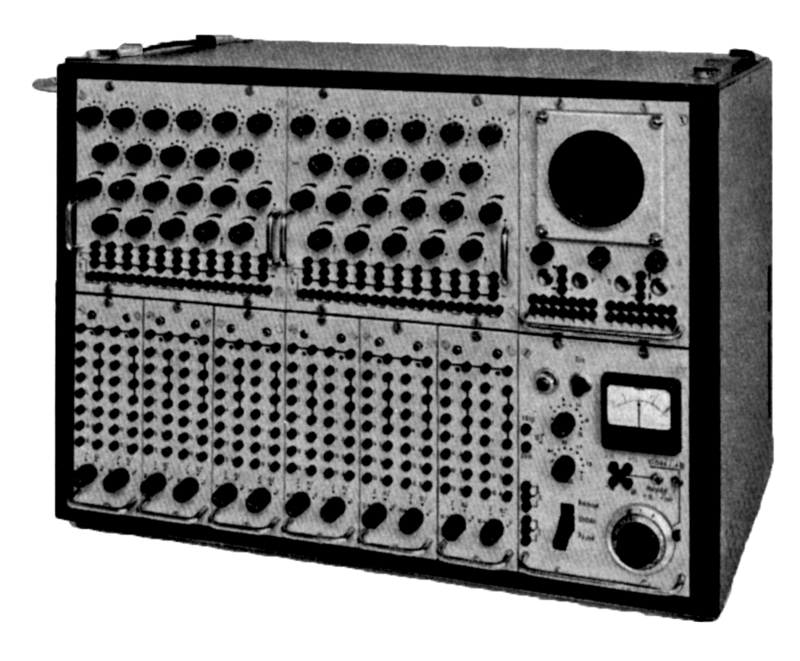 Front view of the very first electronic analog computer built by Telefunken - the RA 1. 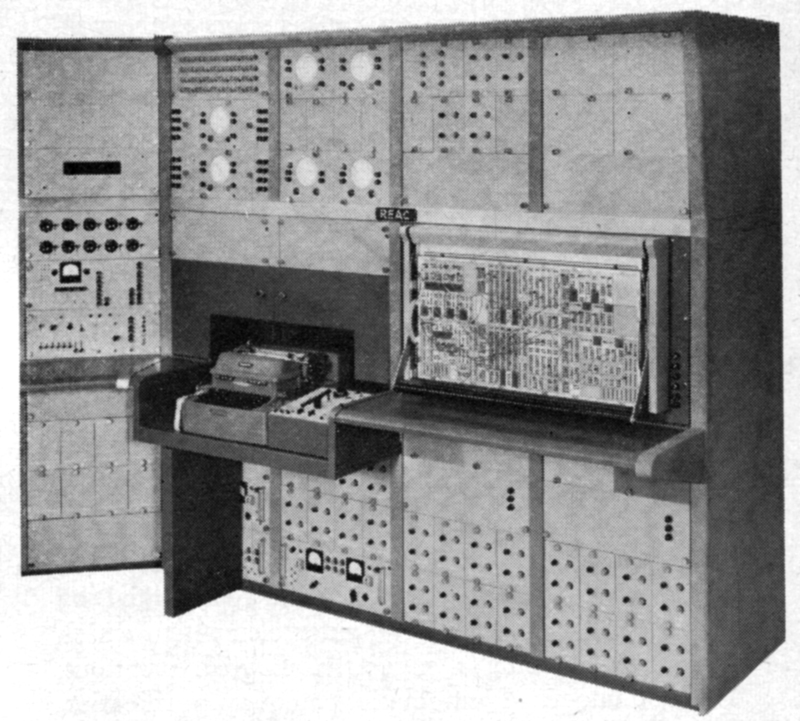 Telefunken RA 463 analog computer in its minimum configuration. 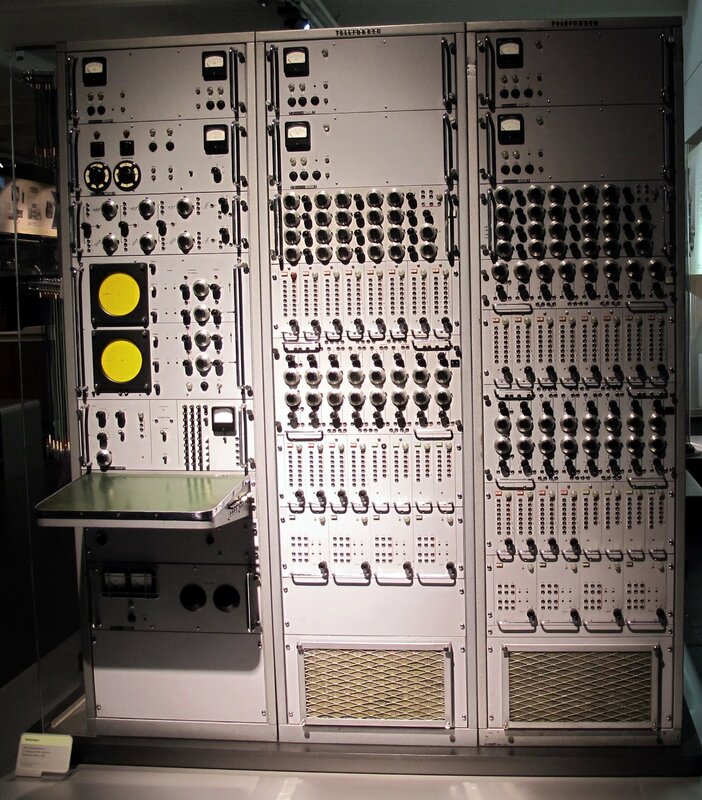 A very large Telefunken RA 463/2 analog computer from 1958 (Photo: Thoms / Deutsches Technikmuseum) which is is part of the collection of the Deutsches Technikmuseum in Berlin (Inv.-Nr. 1/1987/0245). 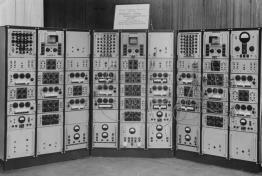 Another large Telefunken 463/2 installation in 1959. 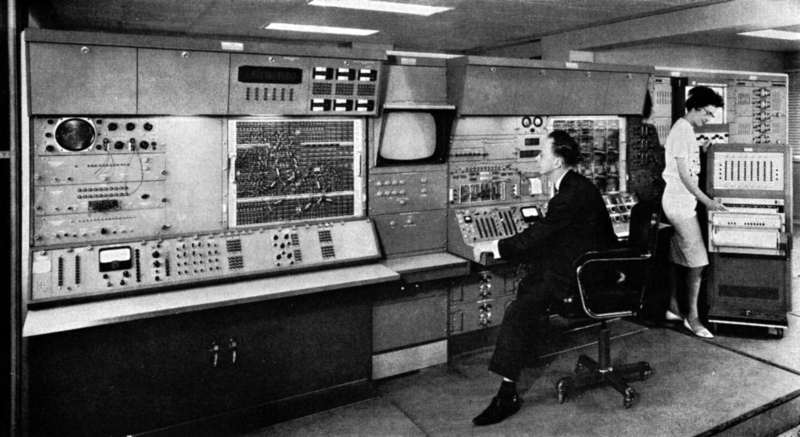 Nuclear reactor simulator, based on a Telefunken RA 463 analog computer (cf. 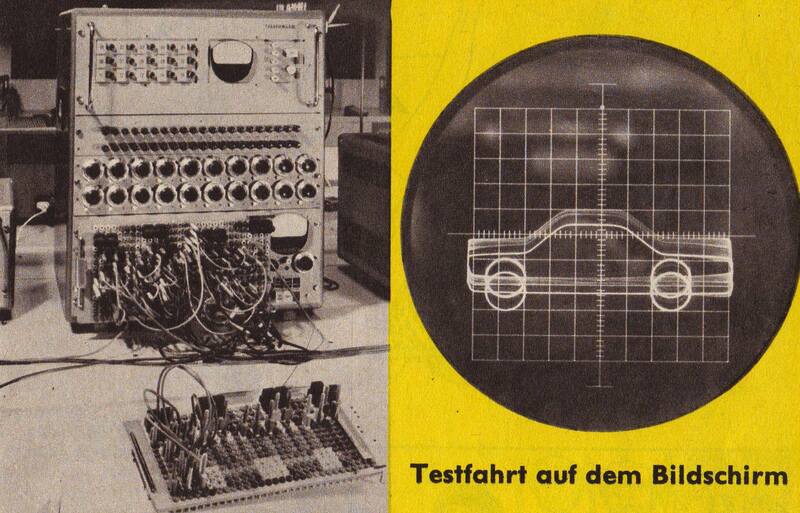 Robert Gerwin, "Atom-Strom für deutsche Städte", in "Hobby - Das Magazin der Technik", Nr. 9, September 1958). 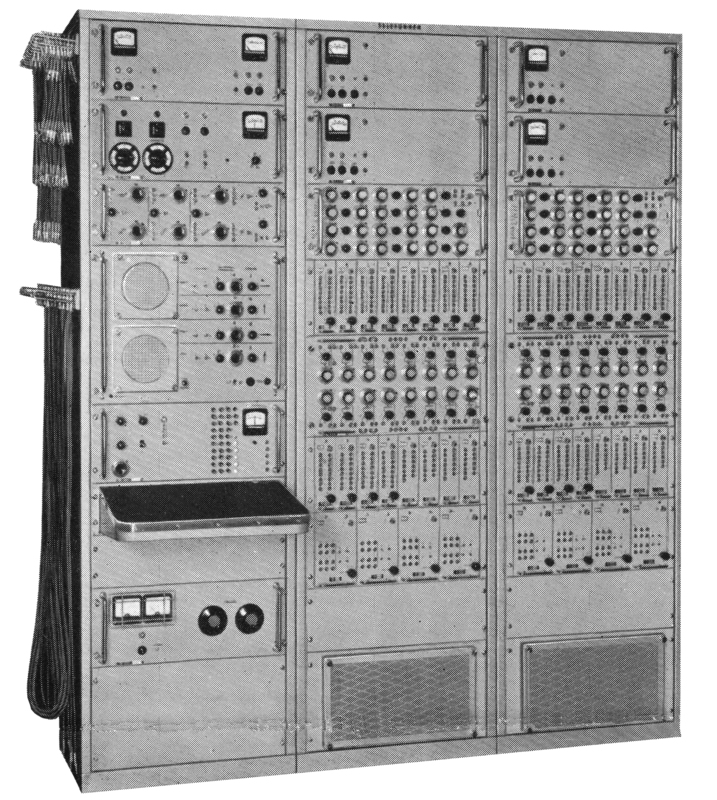 Telefunken RA 463/2 analog computer in its maximum configuration (cf. 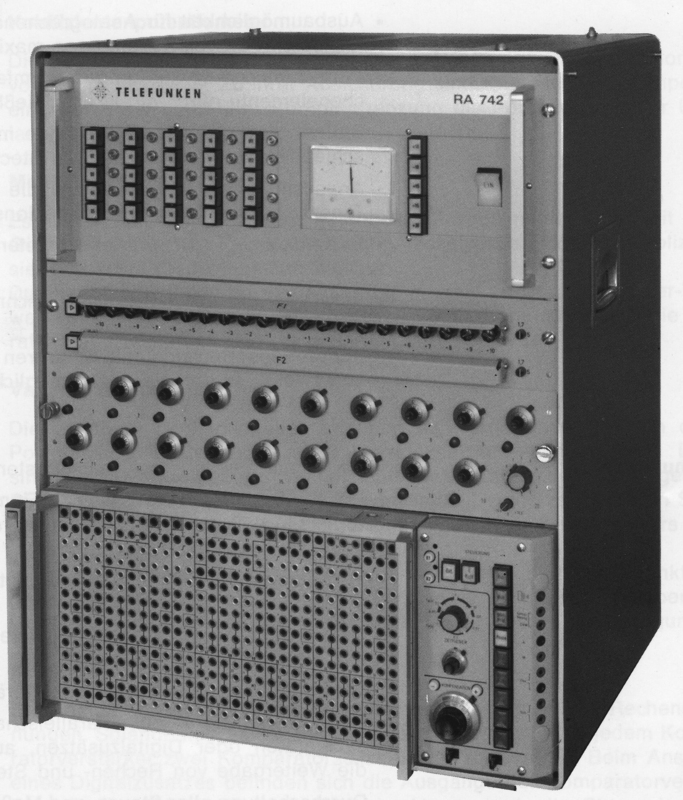 "Elektronischer Analogrechner RA 463/2", Telefunken, AH 5.2, April 1958). 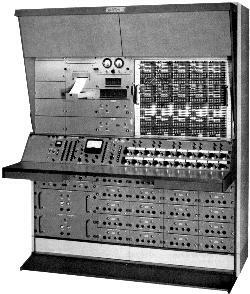 Telefunken RA 463/2 analog computer (picture source: http://commons.wikimedia.org/wiki/File:TMW_Analogrechner_Telefunken.jpg). 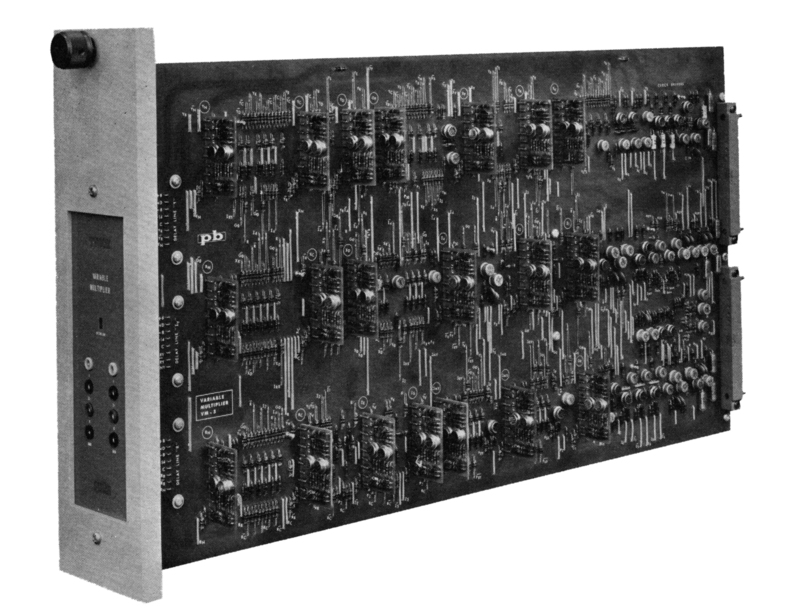 First prototype of a fully transistorized electronic analog computer made by Telefunken (late 1950s - before EAI developed the TR-10 and TR-20) (cf. 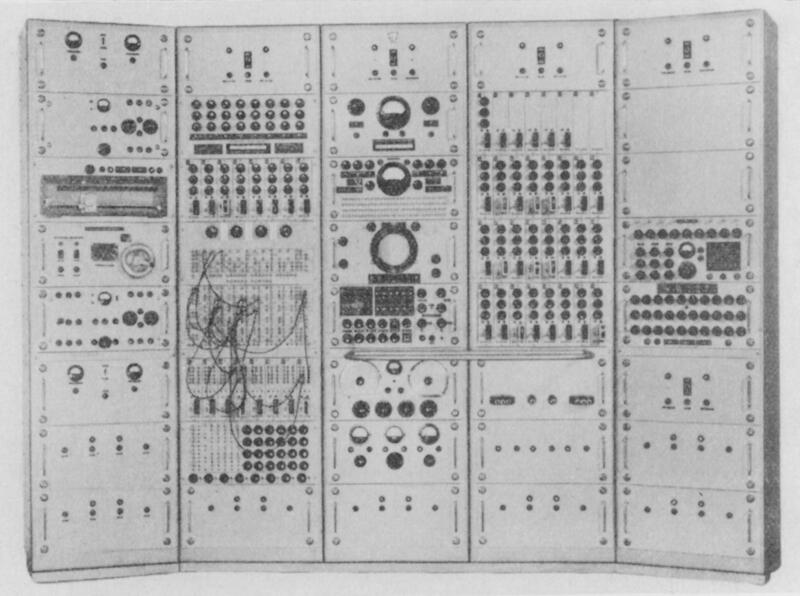 Dietrich Ernst, "Elektronische Analogrechner - Wirkungsweise und Anwendung", R. Oldenbourg Verlag München, 1960, p. 255). 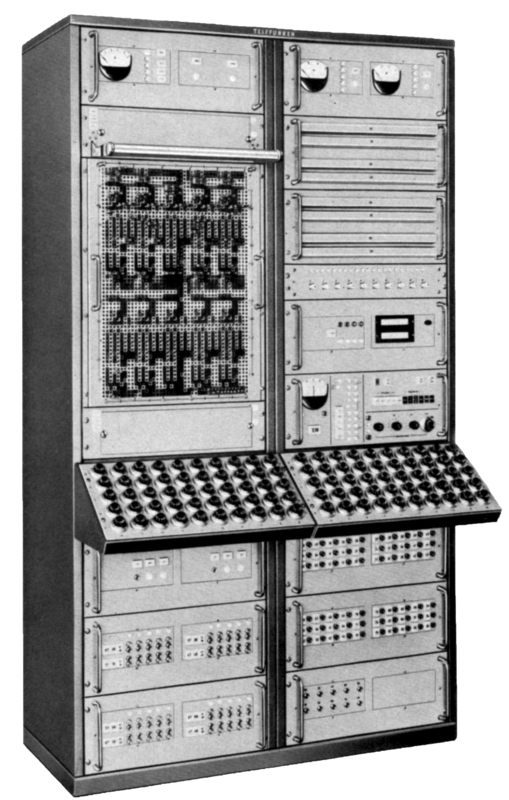 In 1959 Telefunken brought the world's first fully transistorized table top analog computer to the market. 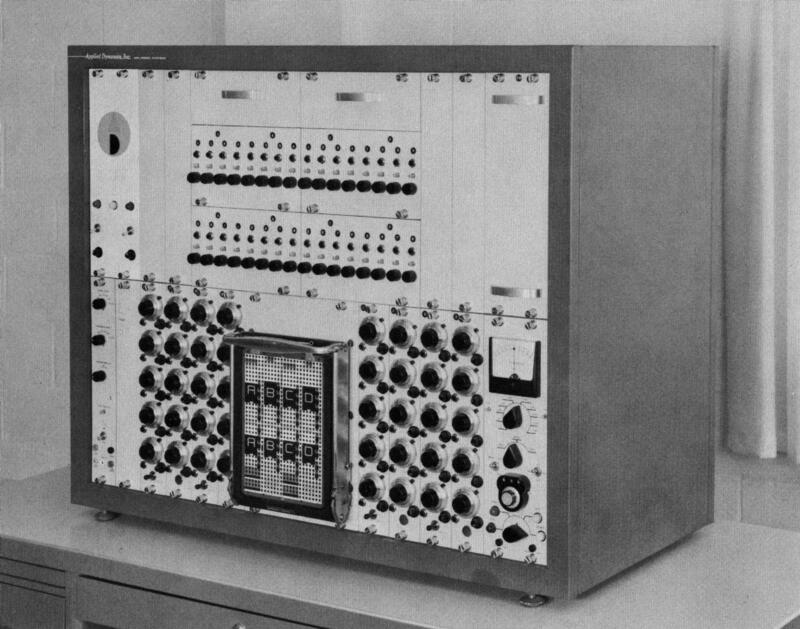 This machine, the RAT 700 was to become the first of a large family of transistorized analog computers developed by Telefunken, eventually leading to the RA 770 precision analog computer. 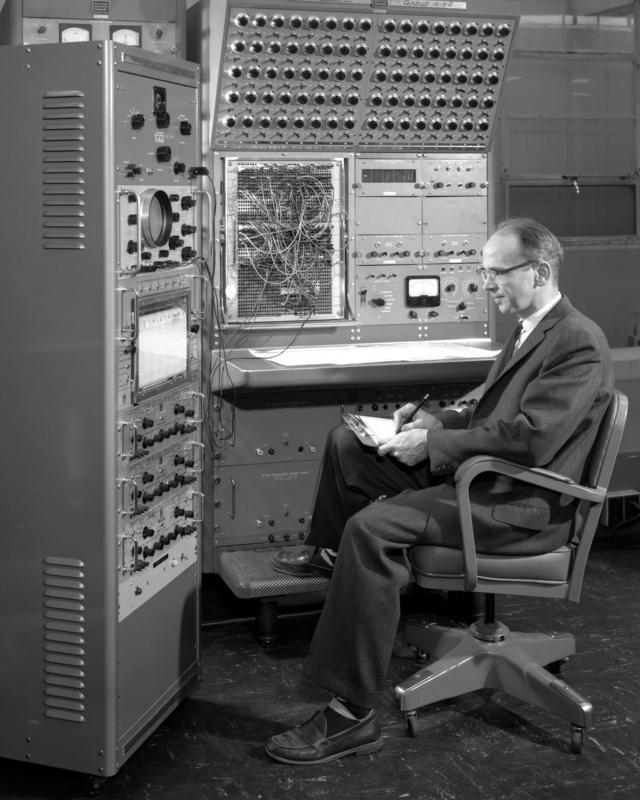 This picture shows Mr. Winkler, an engineer of the "Laboratory Walter" with the Telefunken RAT 700 table top analog computer (cf. 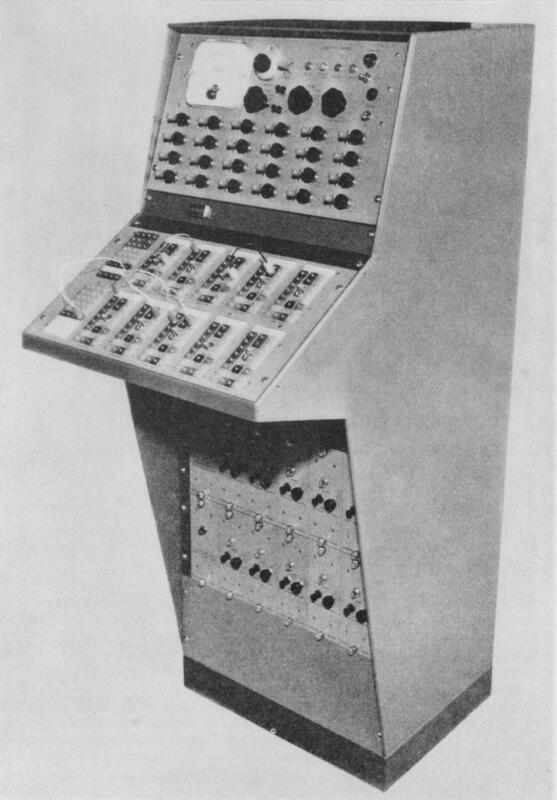 Robert Gerwin, "Intelligente Automaten", Chr. Belser Verlag, 1964, p. 84). 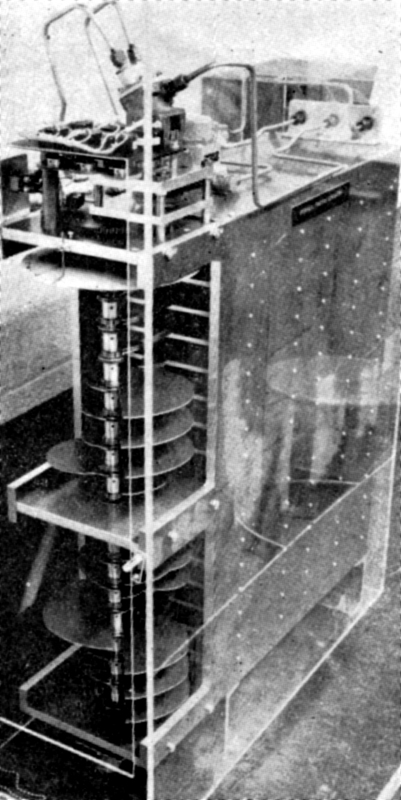 In 1965 the German "Hobby"-magazine published an article about a mass-spring-damper simulation that was shown at a large exhibition in Germany. 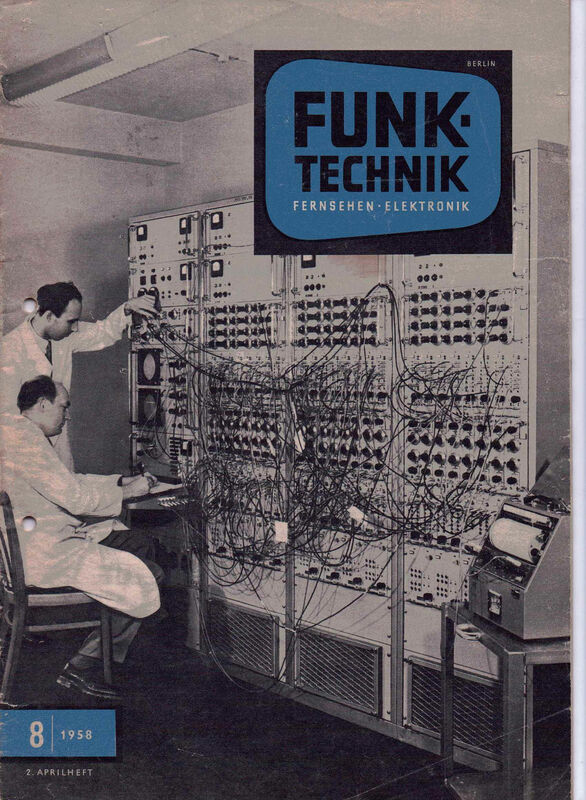 This simulation was a true eye catcher and resulted in quite some sales for Telefunken (more about this particular simulation can be found here. 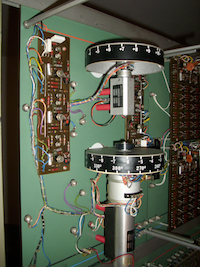 Telefunken RA 710 table top analog computer. 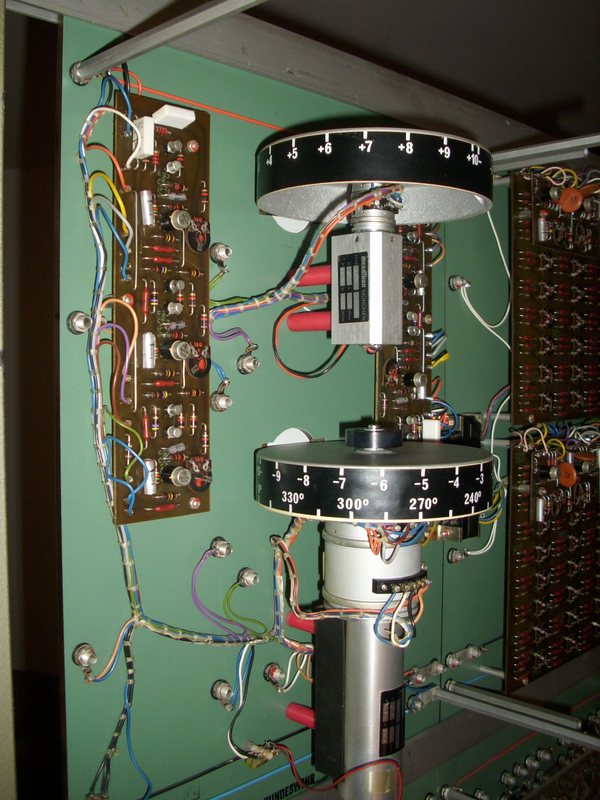 Telefunken RA 742 table top analog computer. 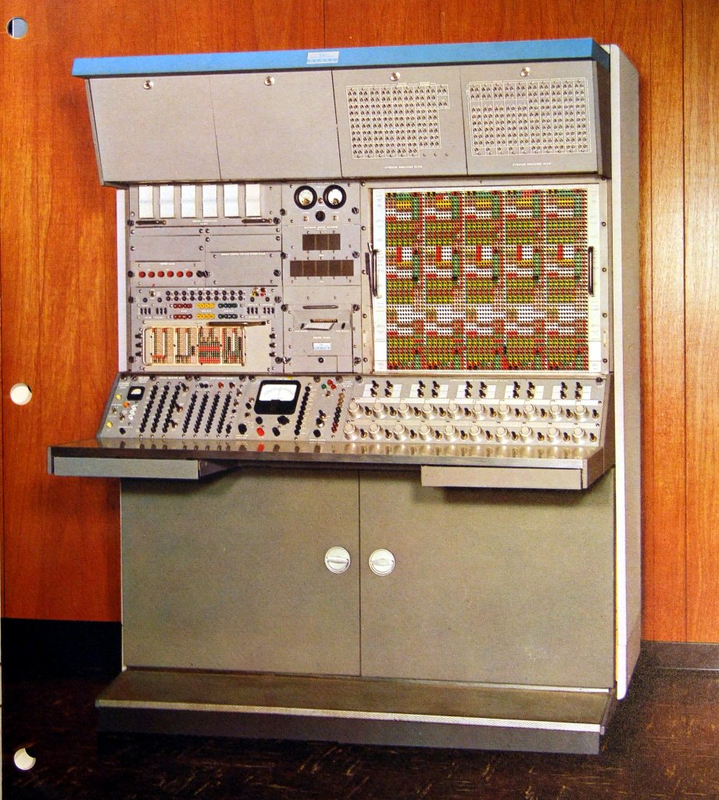 Telefunken precision analog computer RA 800 in its minimal configuration (cf. 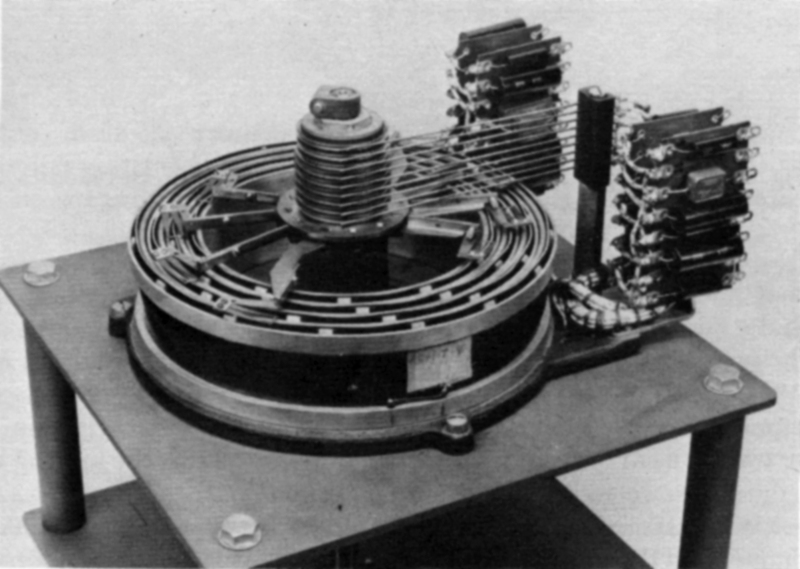 G. Meyer-Brötz, "RA 800 - Ein transistorisierter Präzisions-Analogrechner", in "Telefunken Zeitung", Jg. 33 (September 1960), Heft 129, p. 176). 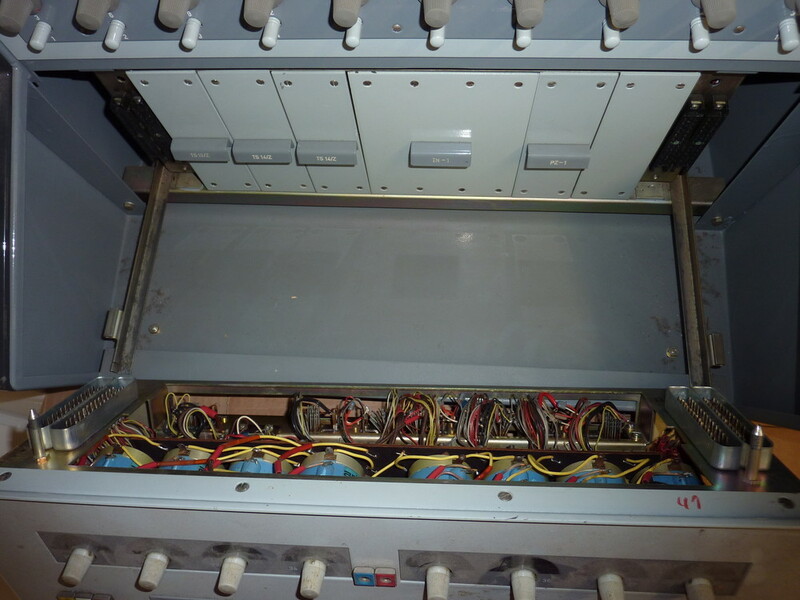 Drawer containing 30 high precision, chopper stabilized operational amplifiers, used in the Telefunken RA 800 (cf. 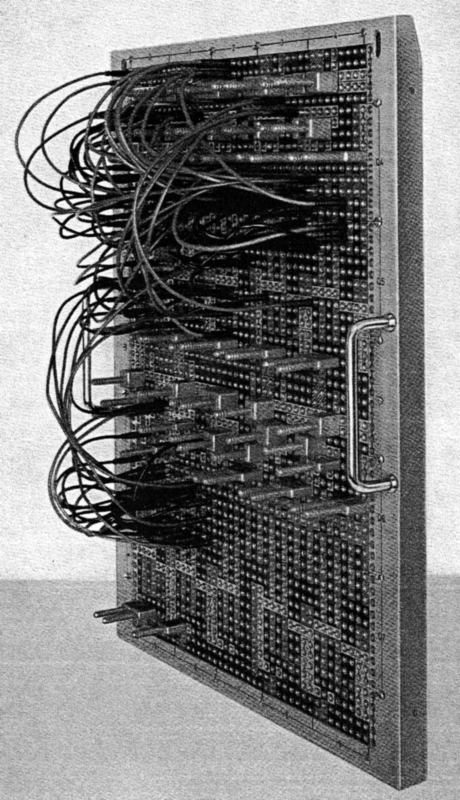 G. Meyer-Brötz, "RA 800 - Ein transistorisierter Präzisions-Analogrechner", in "Telefunken Zeitung", Jg. 33 (September 1960), Heft 129). 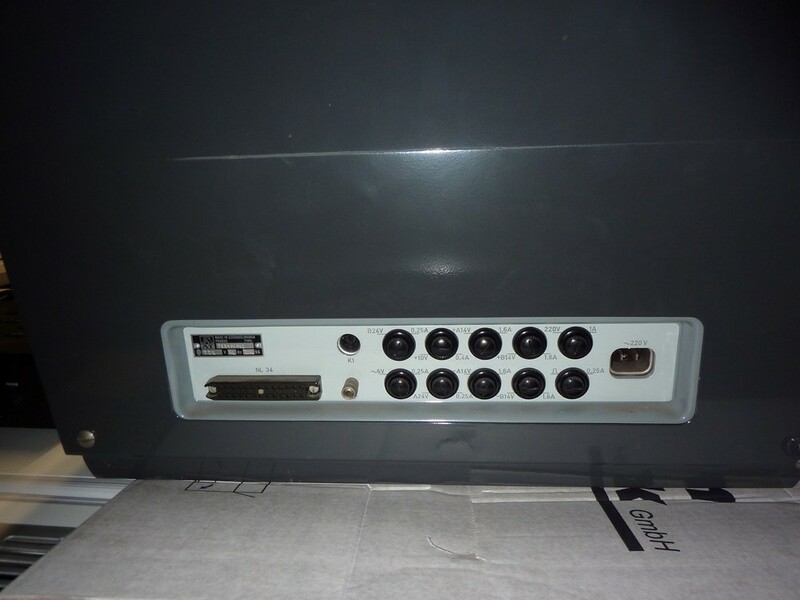 Closeup of the removable patch panel of a Telefunken RA 800 (cf. 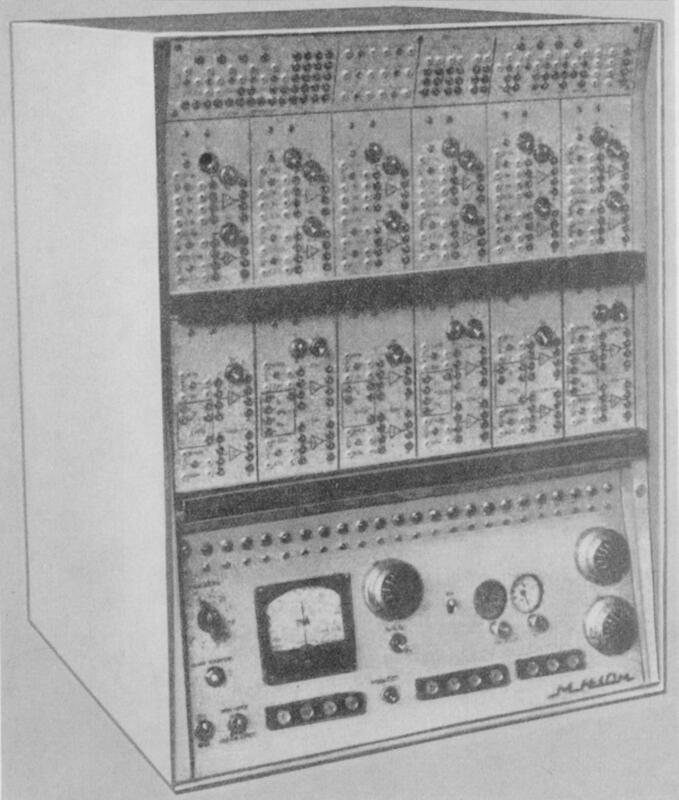 G. Meyer-Brötz, "RA 800 - Ein transistorisierter Präzisions-Analogrechner", in "Telefunken Zeitung", Jg. 33 (September 1960), Heft 129). 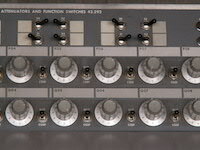 Telefunken precision analog computer RA 800 (cf. Adolf Kley, "Analogrechner", in Helmar Frank (Ed. ), "Kybernetische Maschinen", R. Oldenbourg Verlag München, Wien, 1968, p. 133). 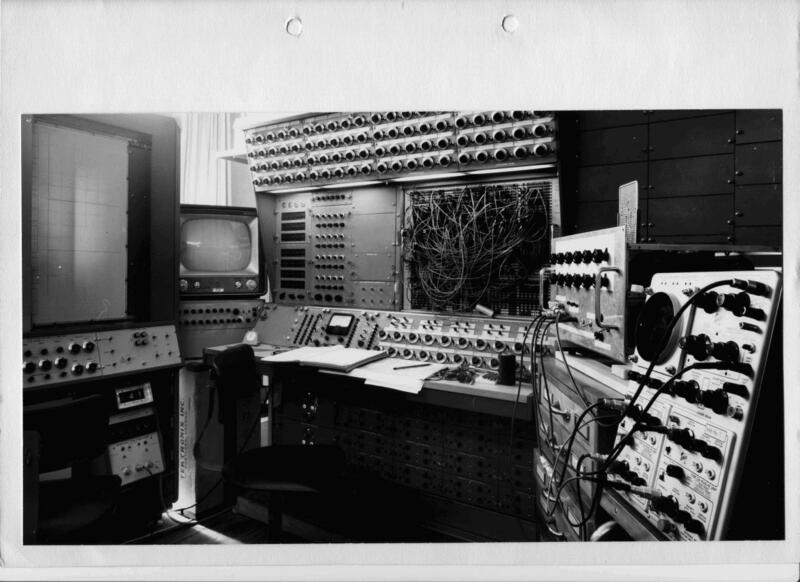 This picture shows a remarkable installation at a Telefunken laboratory in the early 1960s. 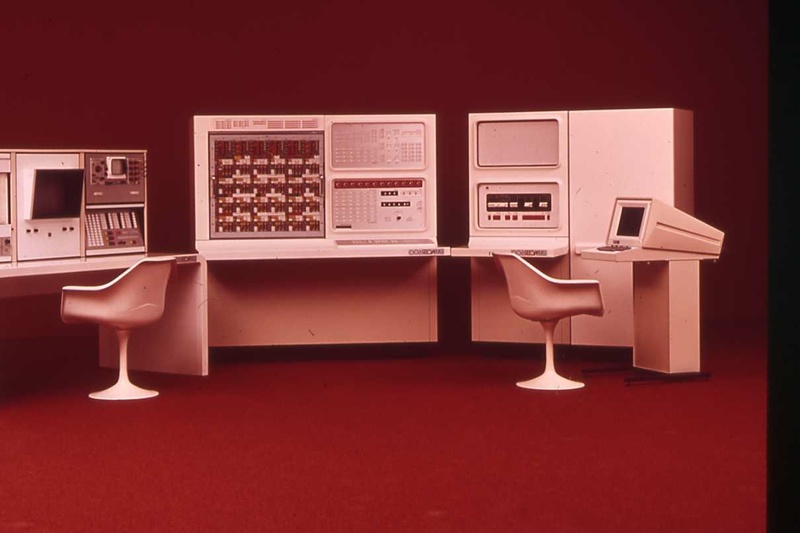 On the right is a minimum configuration RA 800 precision analog computer which is supported by five RAT 700 table top computers sitting on the desks on the left (each of these computers weighs about 100 kg!). 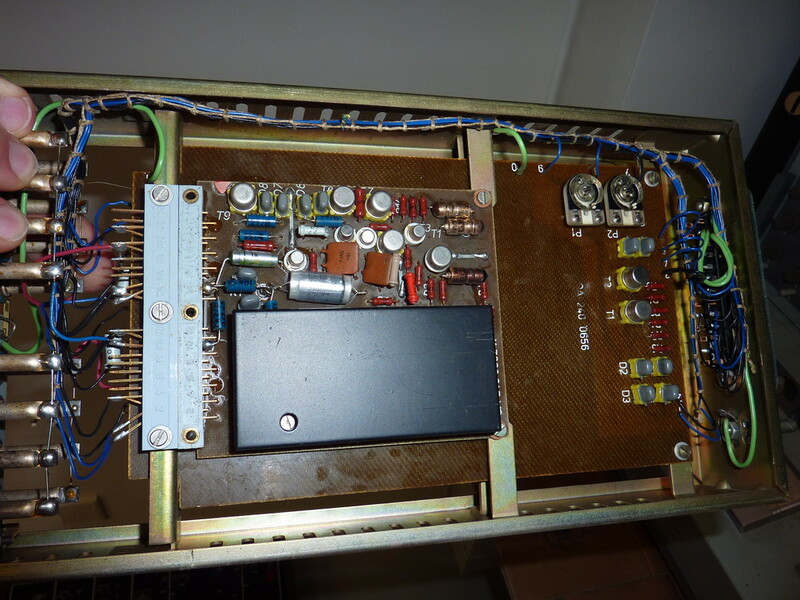 In addition to that there is a digital voltmeter on top of the third RAT 700 and a small oscilloscope (Tektronix?) next to the RA 800. 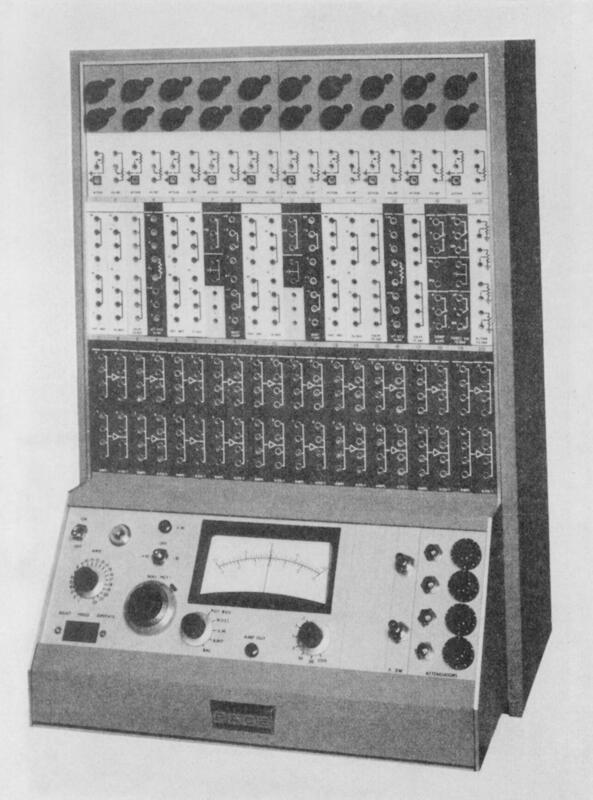 Telefunken Hybrid computer RA 800H (cf. 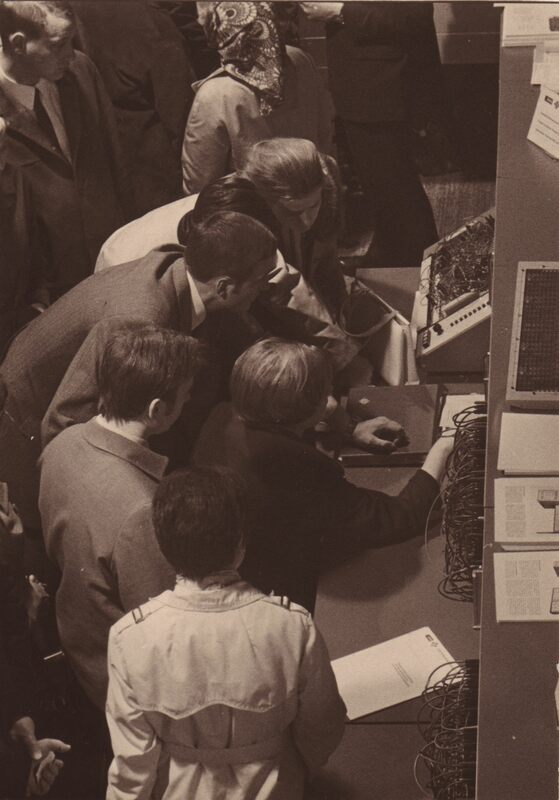 Helmut Adler, "Elektronische Analogrechner", VEB Deutscher Verlag der Wissenschaften, Berlin, 1968, p. 273). 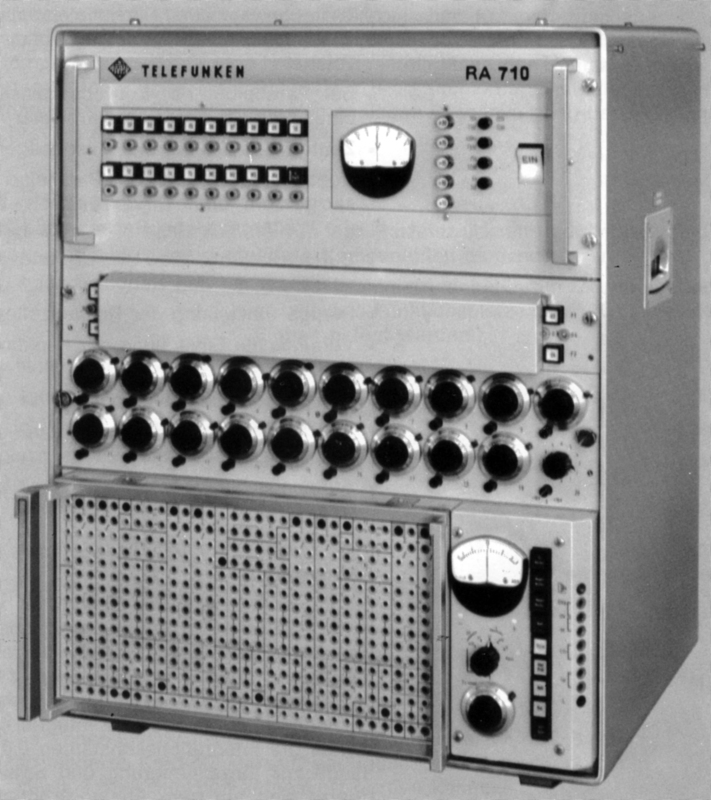 Promotion picture of a Telefunken RA 770 precision analog computer. 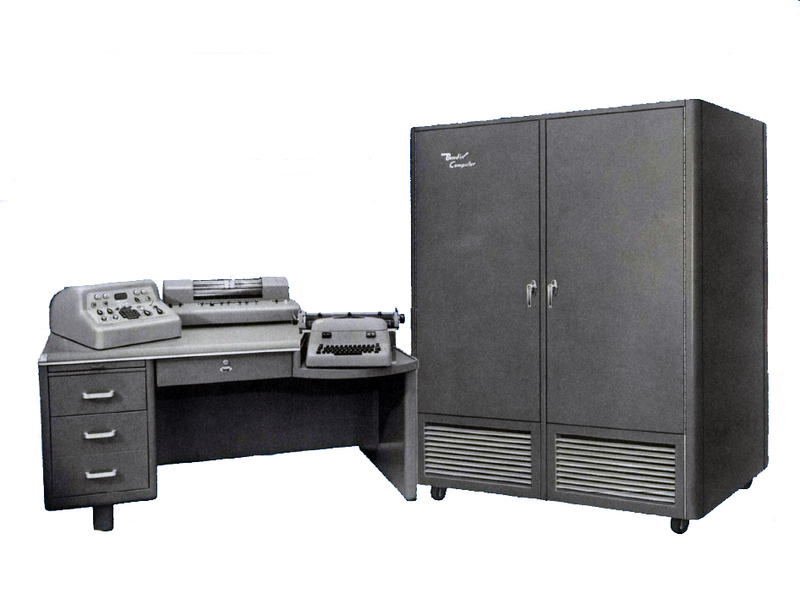 Promotion picture of a Telefunken RA 770 precision analog computer with annotations. 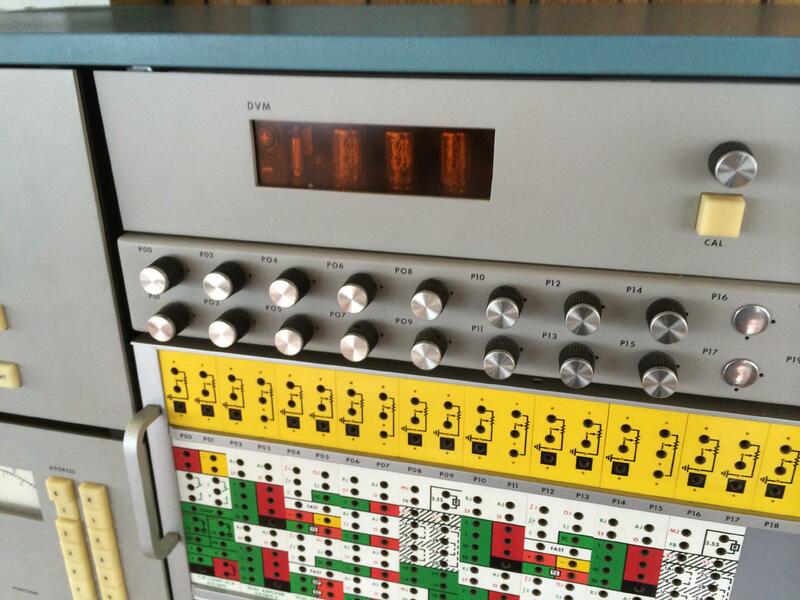 This picture shows a rather rare setup of a Telefunken RA 770 precision analog computer. The two racks on the right side of the picture are the so called RA 775 - in fact a second RA 770 but without the control logic etc. 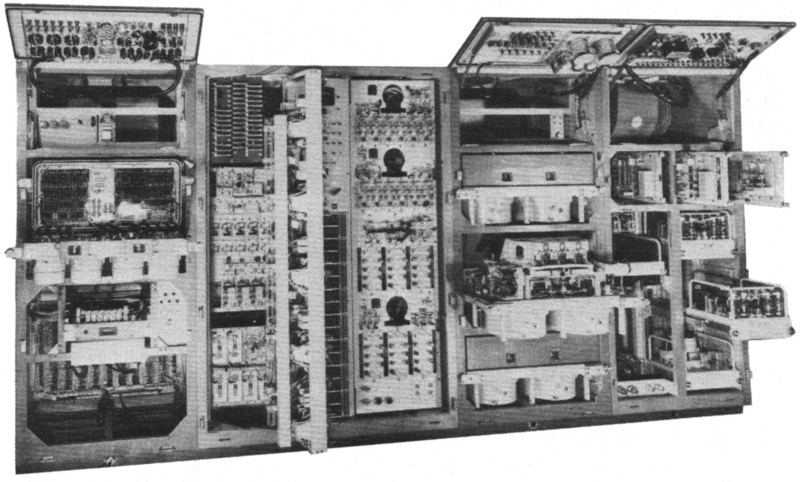 This extension acted as a slave computer to the main RA 770. 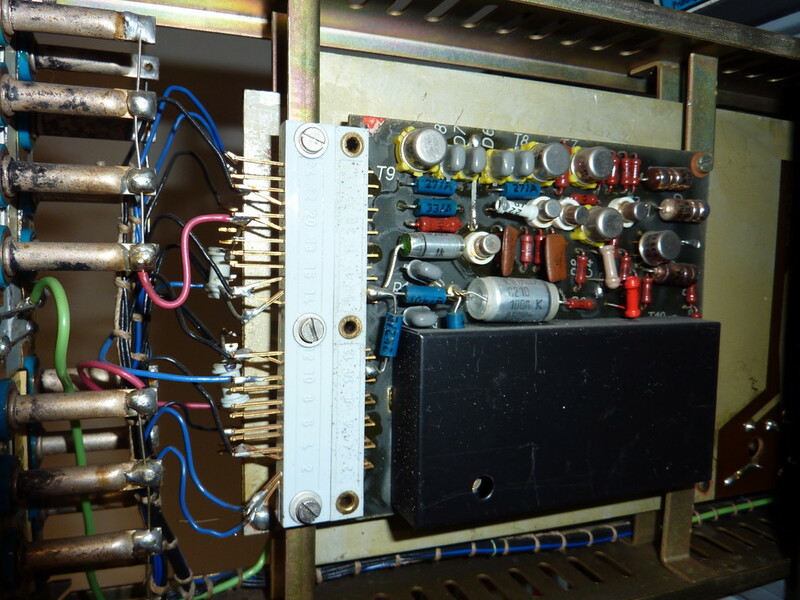 A maximum configuration would consist of one RA 770 with two RA 775 extensions giving all in all about 600 operational amplifiers. 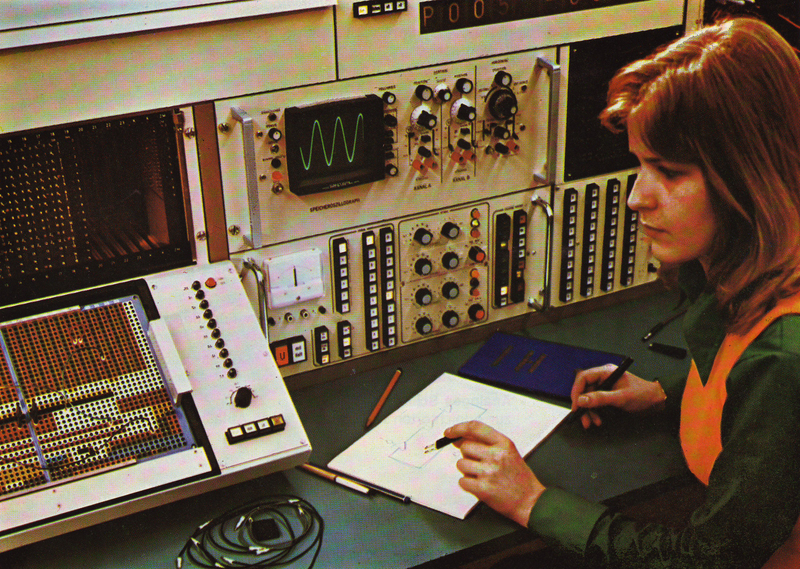 You will note that the picture has been poorly edited by hand where the oscilloscope is mounted. 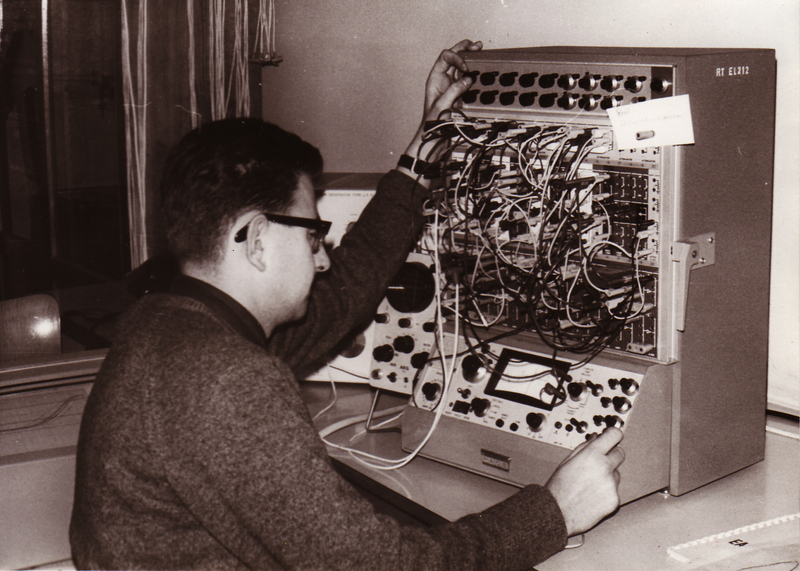 This was caused by the fact that Telefunken stopped the production of its own OMS 811 special purpose oscilloscope and started shipping its analog computers with slightly modified storage oscilloscopes made by HP - that's the oscilloscope that has been edited into the photo. 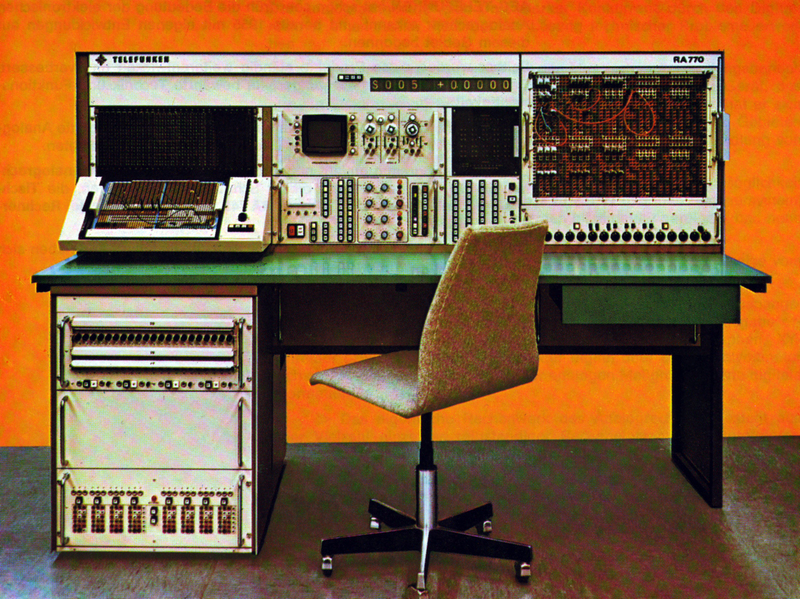 Promotion picture of a Telefunken HRS860 hybrid computer system consisting of a RA 770 precision analog computer and a Telefunken TR-86 digital computer. 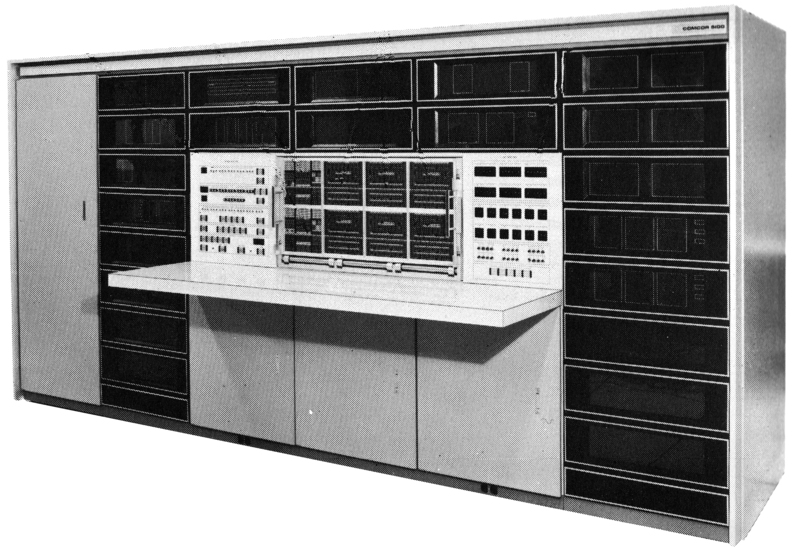 Promotion picture of a Telefunken HRS860 hybrid computer system consisting of a RA 770 precision analog computer and a Telefunken TR-86 digital computer (cf. 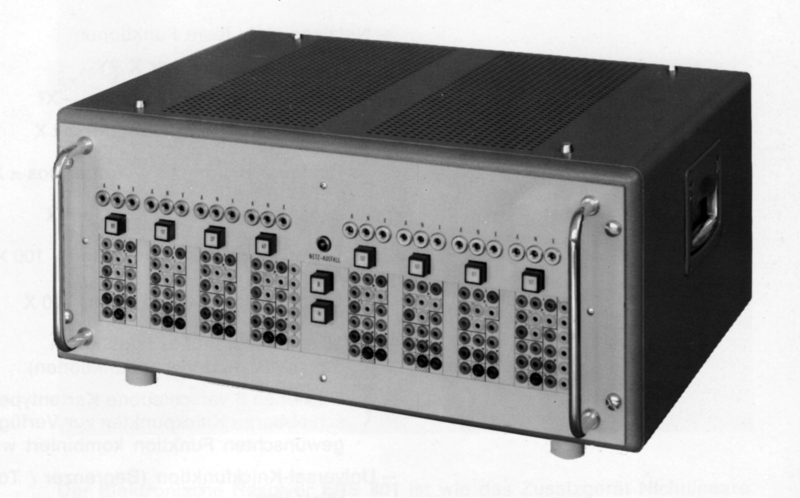 "Kurzbeschreibung - Hybrides Rechensystem HRS 860", AEG-TELEFUNKEN, Fachbereich Informationstechnik, N41 AC 52 0473). 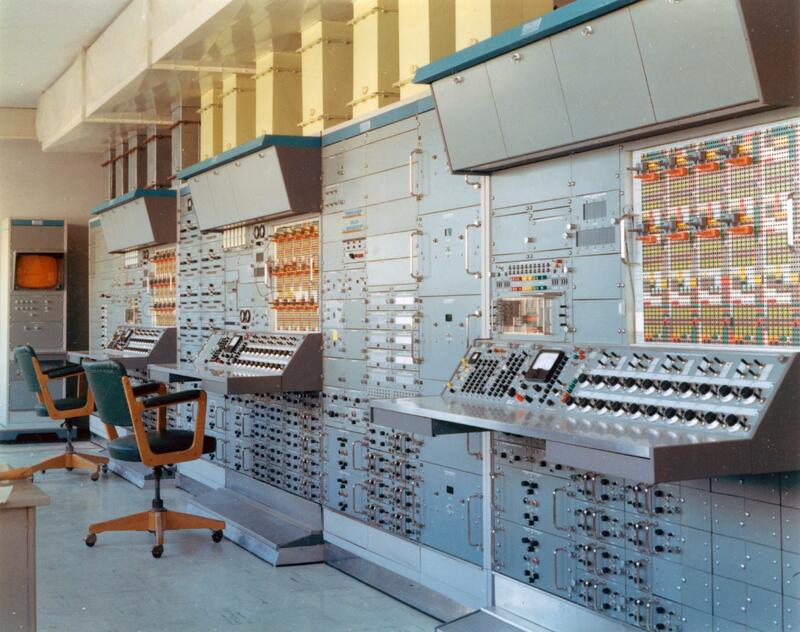 The Telefunken RA 770 that was once installed at the Deutsches Elektronensynchrotron in Hamburg. This shot was taken during an open house ceremony (picture: Inge Borchardt). 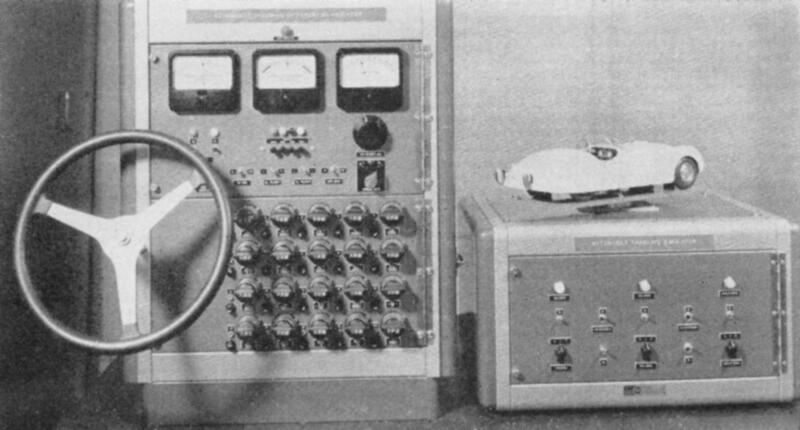 Promotion picture of a Telefunken electronic resolver ERS 801. 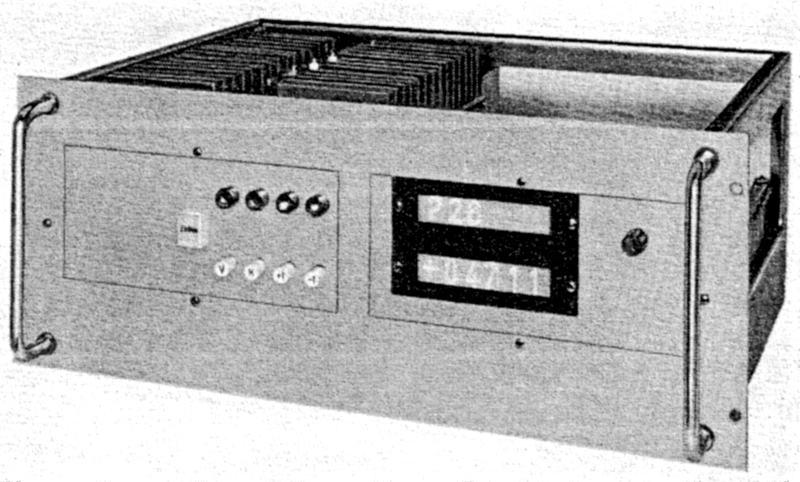 Promotion picture of a Telefunken time delay unit LZG 102. 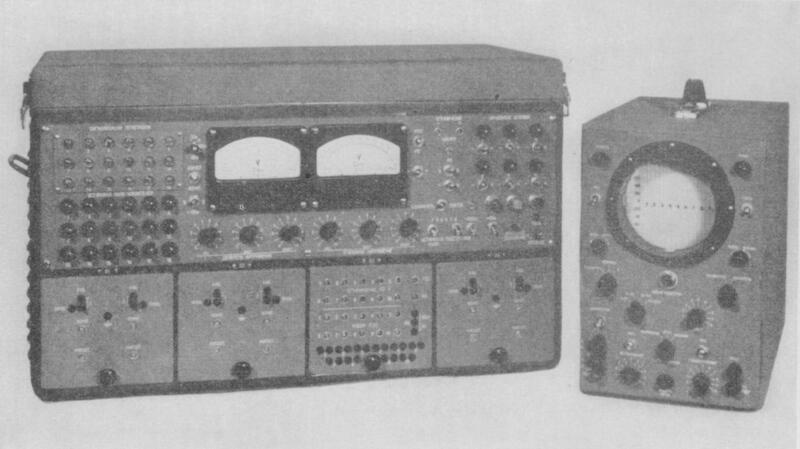 Promotion picture of a Telefunken non-linear functions unit NNT 740. 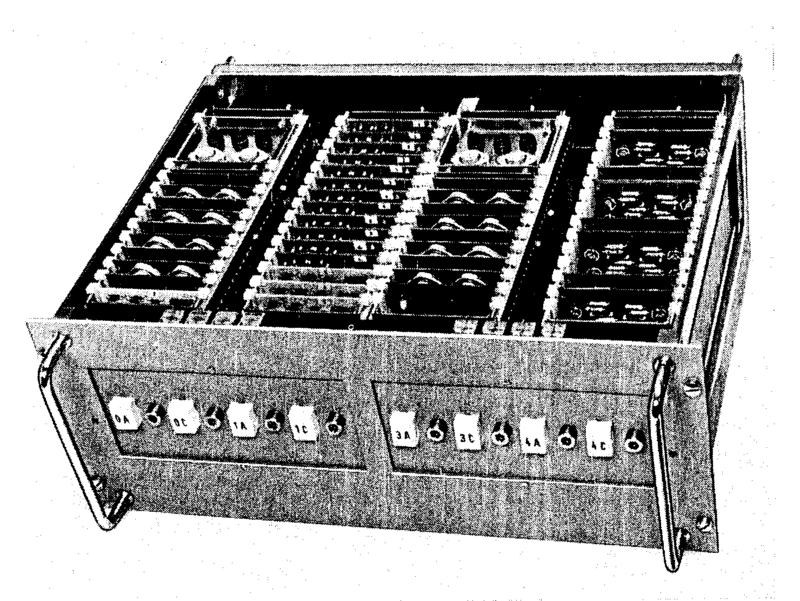 Early version of the non-linear functions drawer as used in the Telefunken RA 800 precision analog computer. The first five digit digital voltmeter made by Telefunken for its RA 800 precision analog computer. 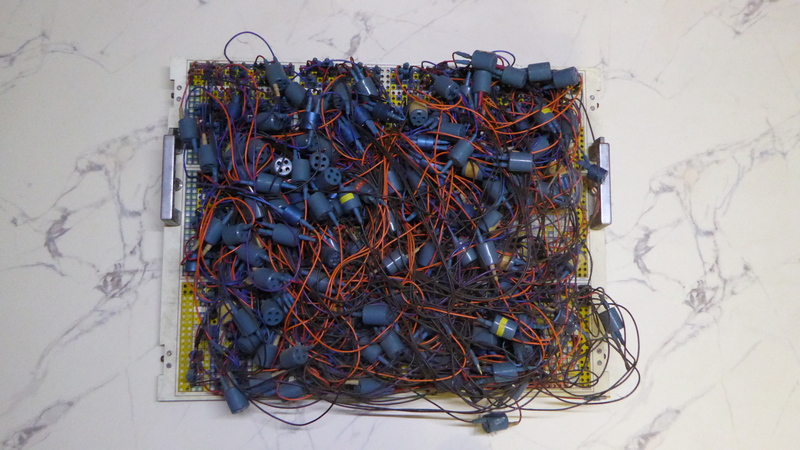 Drawer containing four five-channel time division multipliers. 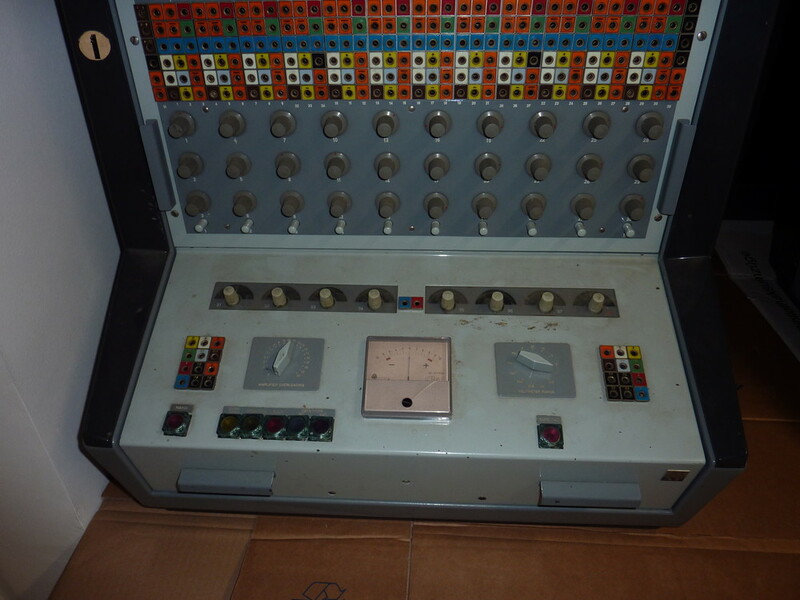 Telefunken random noise generator RGF 104. 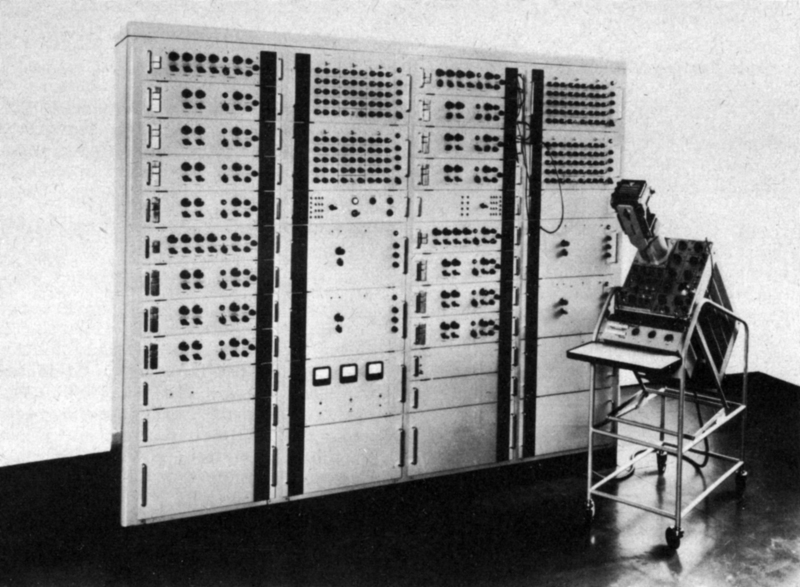 Tube based analog computer built by Valvo in 1957. 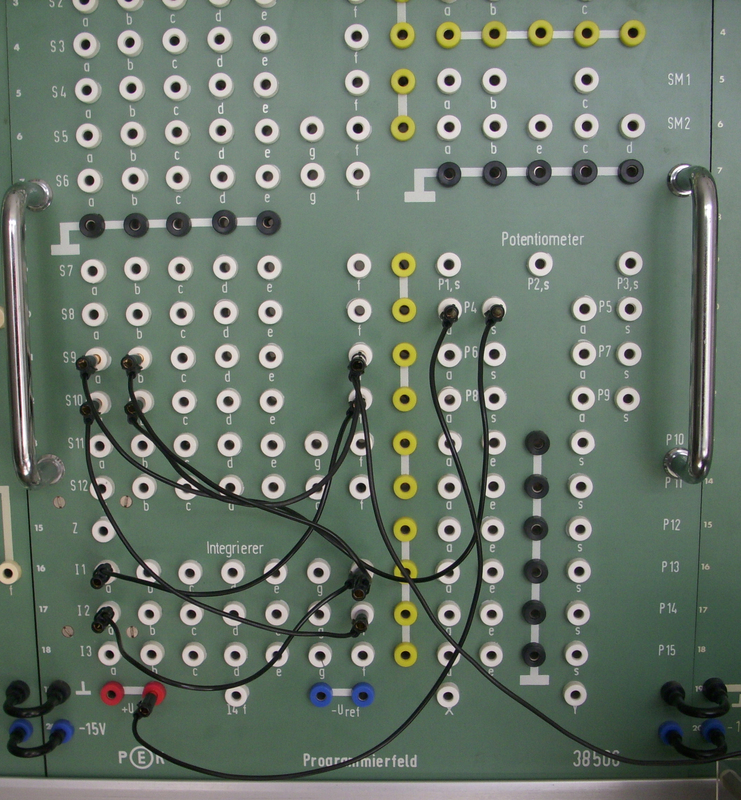 Closeup of the patch field of the Valvo analog computer shown above. In the late 1950s/early 1960s the "Wissenschaftlich-Technische Büro für Gerätebau" in east Berlin developed the UNIMAR - a tube based analog computer that was used mainly for the simulation of control systems. I would like to thank Robert Limes for this picture. This picture shows a small analog steering simulator (cf. John H. McLeod, Suzette McLeod, "The Simulation Council Newsletter", in "Instruments and Automation", Vol. 31, Dec. 1958, p. 1995). 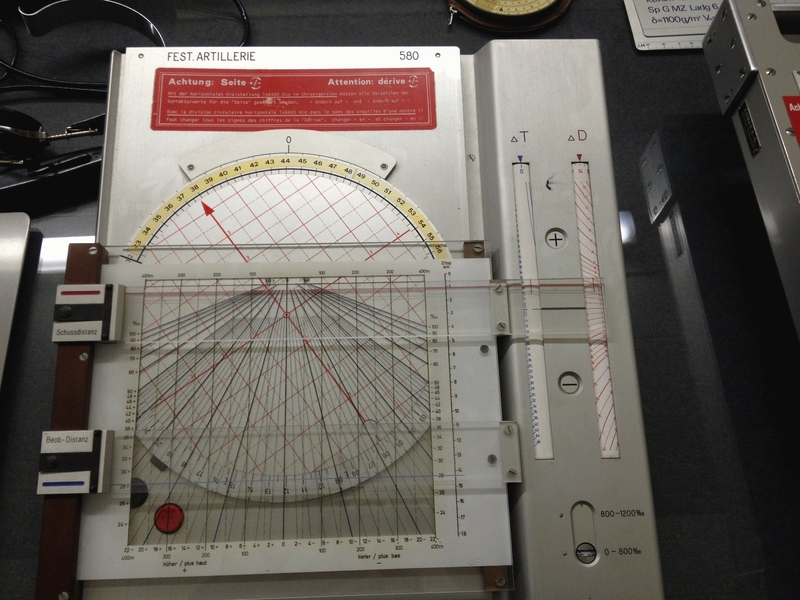 A function generator used in an analog computer for flight simulation. 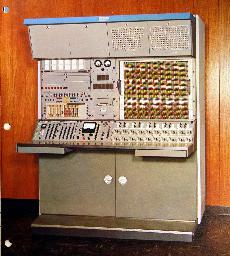 Small russian analog computer BPRR-2 - this machine was used to solve optimization problems in industrial processes (cf. 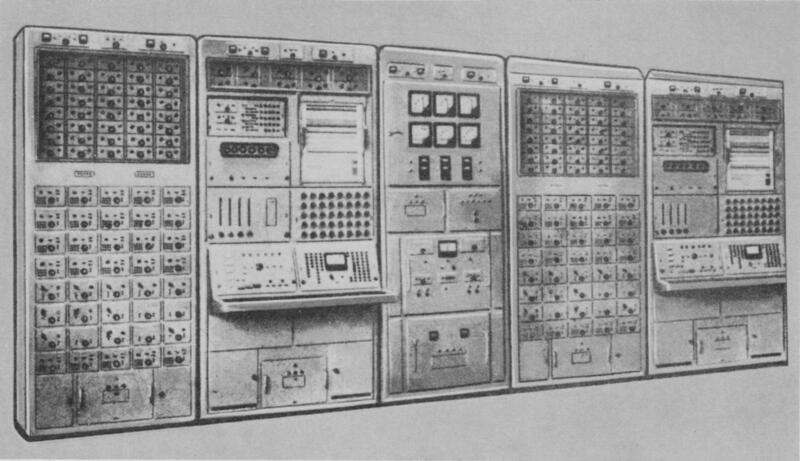 V. B. Ushakov, "Soviet Trends in Computers for Control of Manufacturing Processes", in "Instruments and Automation", Dec. 1958, p. 1961). 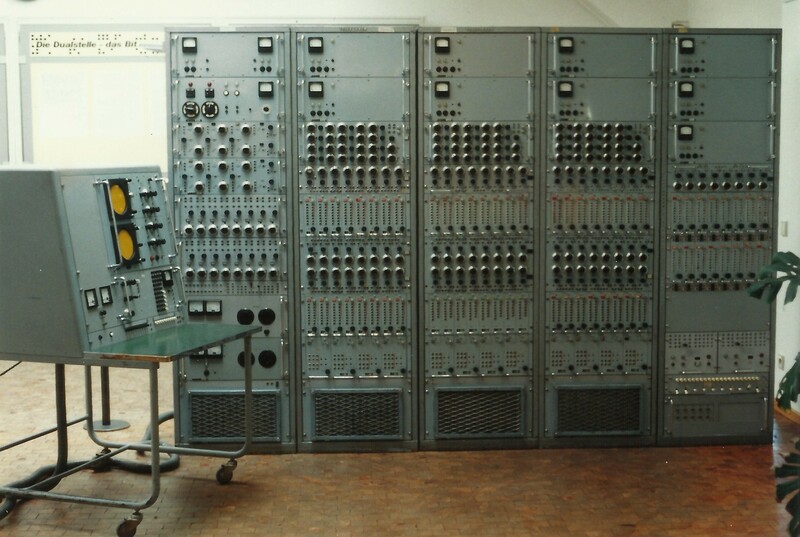 Large scale russian special purpose analog computer ZI-S used to solve questions in the field of hydraulics (cf. 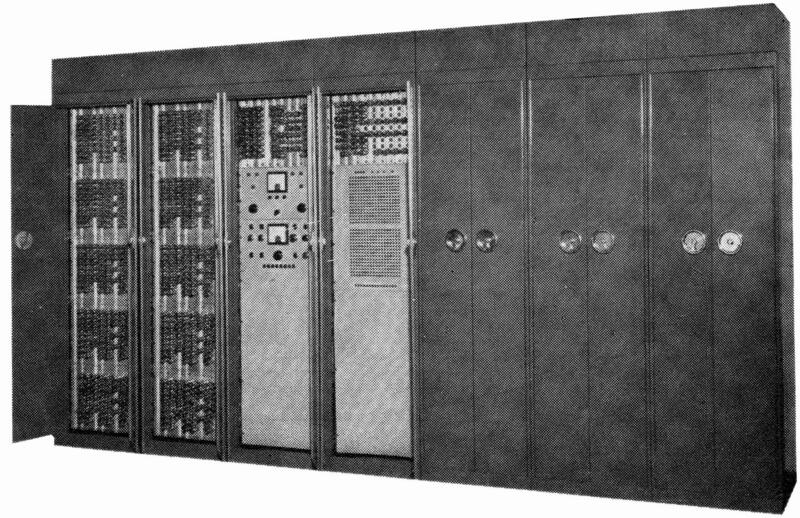 V. B. Ushakov, "Soviet Trends in Computers for Control of Manufacturing Processes", in "Instruments and Automation", Nov. 1958, p. 1812). 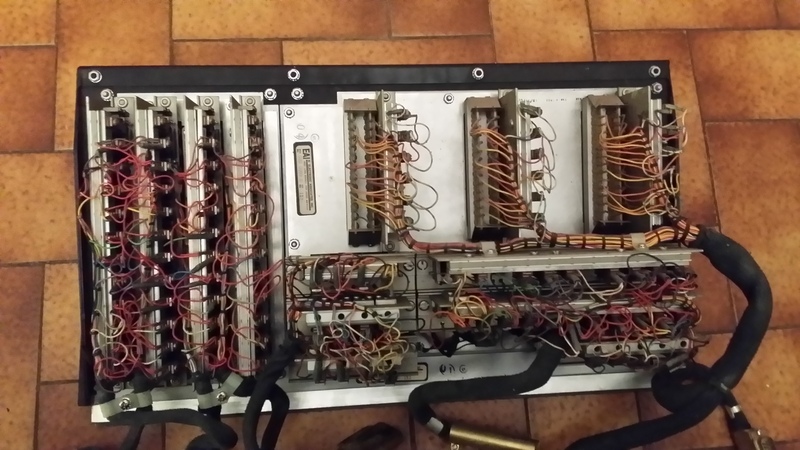 Very small russian MN7 table top analog computer (I would love to learn more about this machine - please let me know if you have any information about it). 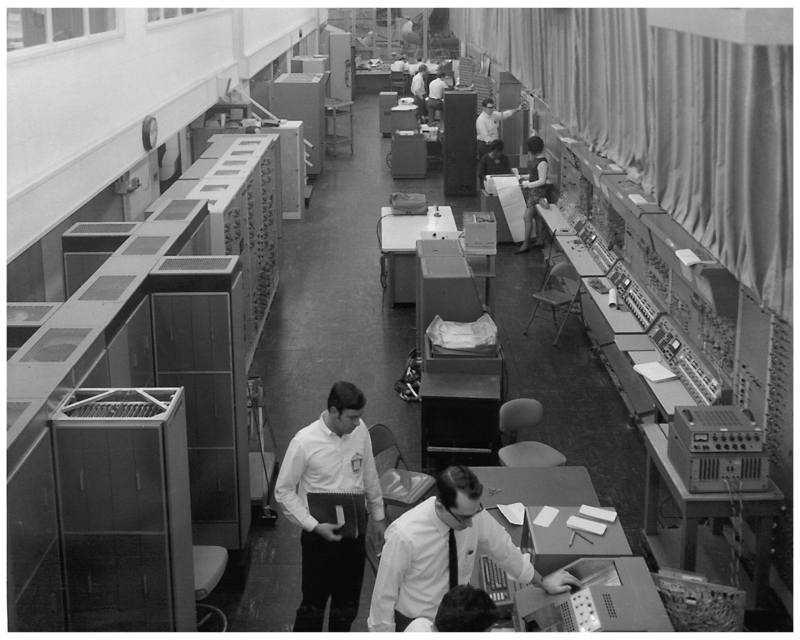 The patch field is hidden under the top lid of the computer, so during normal operation the setup can not be changed accidentally. 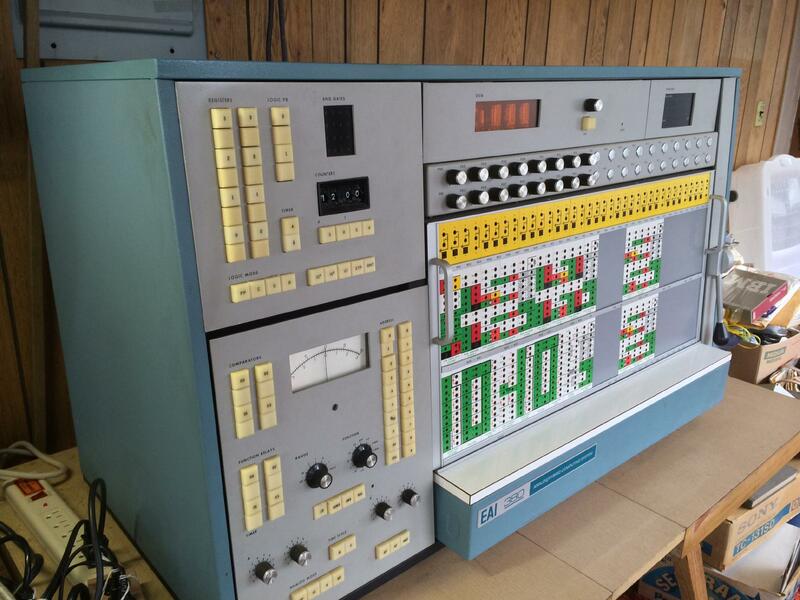 Small russian MN10M table top analog computer (I would love to learn more about this machine - please let me know if you have any information about it). 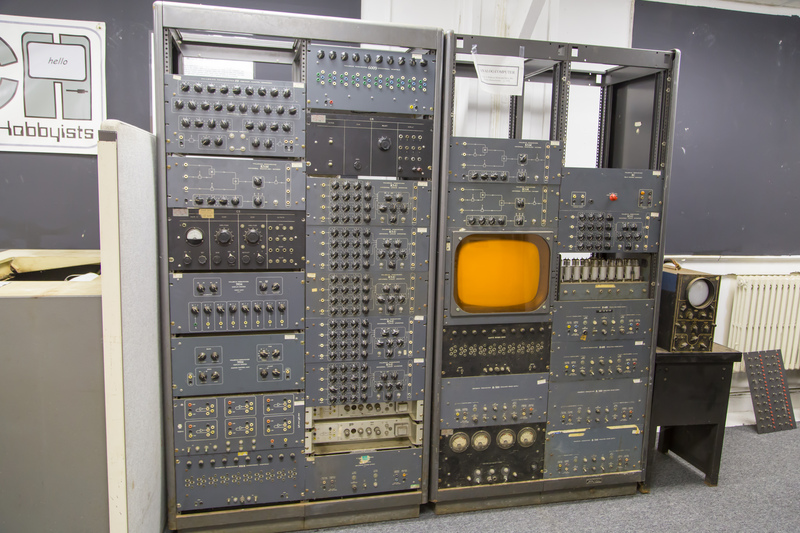 Large russian analog computer MN17M (I would love to learn more about this machine - please let me know if you have any information about it). Don P. Mitchell shed some light onto this particular machine: "With regard to the MN-17M analog computer, MN stands for 'modeli Nelineinye' meaning non-linear model. I found some information just googling in Russian [...]:"
"Electronic computer installation MH-17M is designed to solve systems of linear differential equations. Set of functional blocks machine allows up to 80 operations of integration and summation, 80 operations inverting or summing and ask for the voltage divider 160 of constant coefficients. 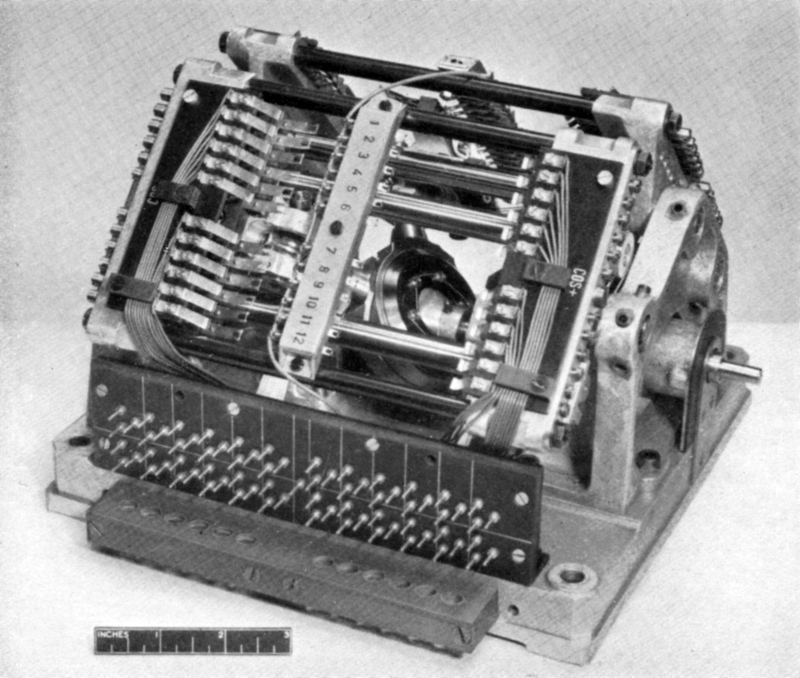 Machine MH-17M includes 10 blocks of operations works, division and square root, 16 blocks of one continuous non-linear functions of one variable, 8 blocks of trigonometric functions, 6 nonlinear specialized units (backlash limitation dead band), 8 blocks of nonlinearity; 8 specialized linear block with a set of arbitrary linear operator." The Electronic Analog Frost Computor, a direct electronic analog computer, developed by the US Army Corps of Engineers, New England Division (cf. H. P. Aldrich, H. M. Paynter, "First Interim Report - Analytic Studies of Freezing and Thawing of Soils (for the Arctic Construction and Frost Effects Laboratory, New England Division, Corps of Engineers)", in Henry M. Paynter (Ed. 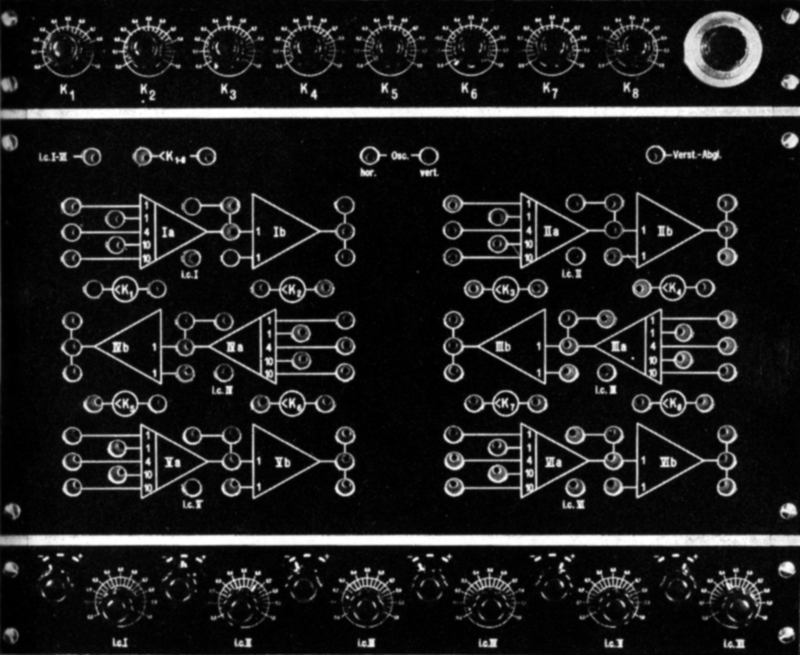 ), "A Palimpsest on the Electronic Analog ARt", printed by Geo. A. Philbrick Researches Inc., AD 1956, p. 259). 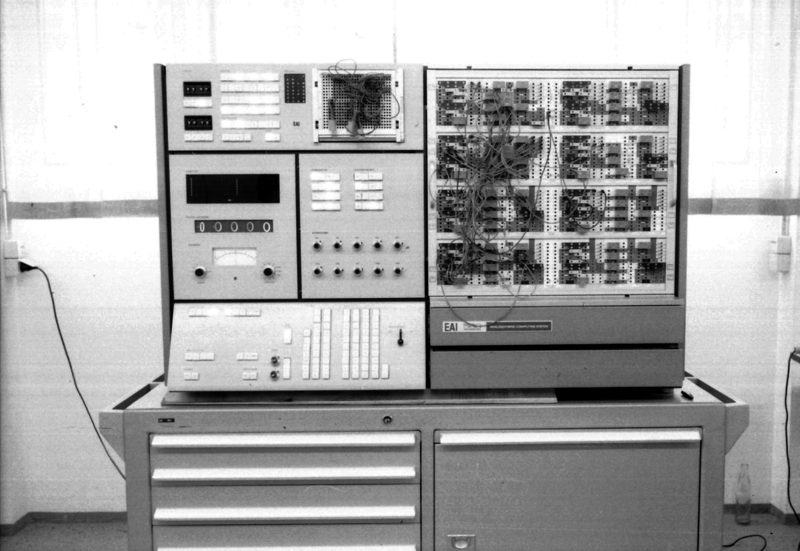 HETAC, the Heat Exchange Transient Analog Computer (cf. 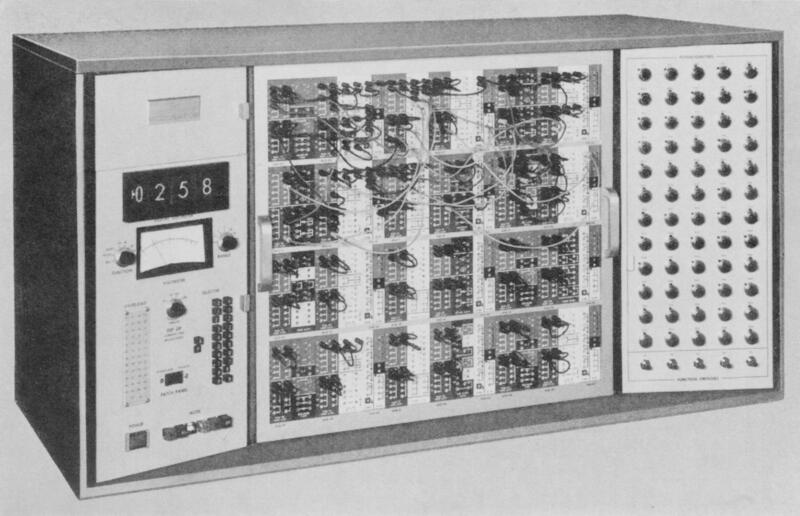 "University Research Instrumentation", in "Instruments and Automation", June 1957, p. 1120). 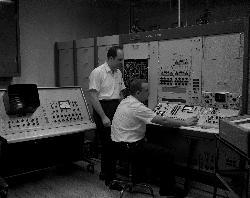 Analog computers at a NASA simulation facility during the development of the control stick for project Mercury. 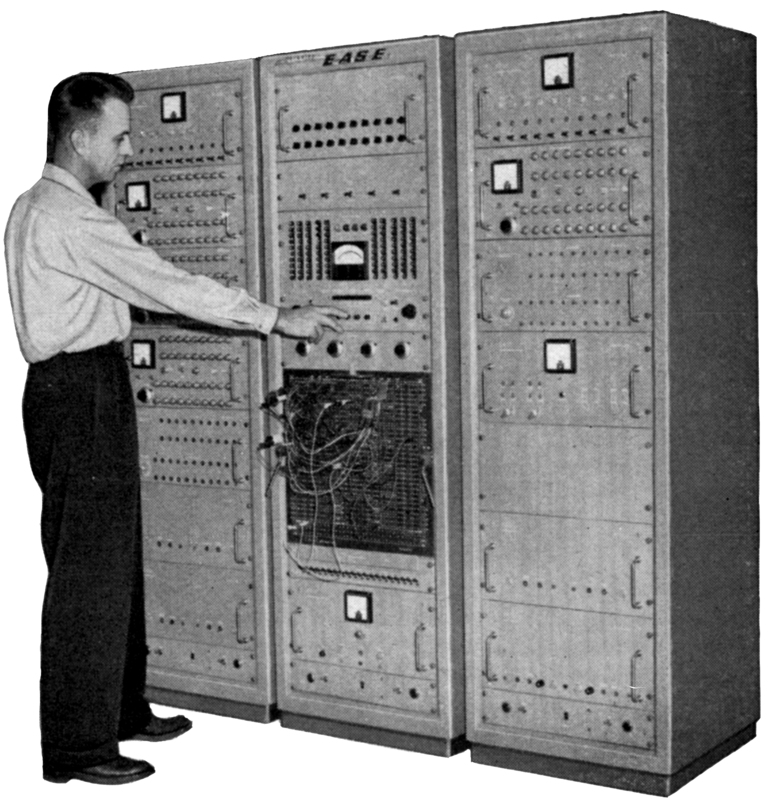 The Nike-Resarch-and-Development analog computer in 1951 (cf. M. D. Fagen (Ed. 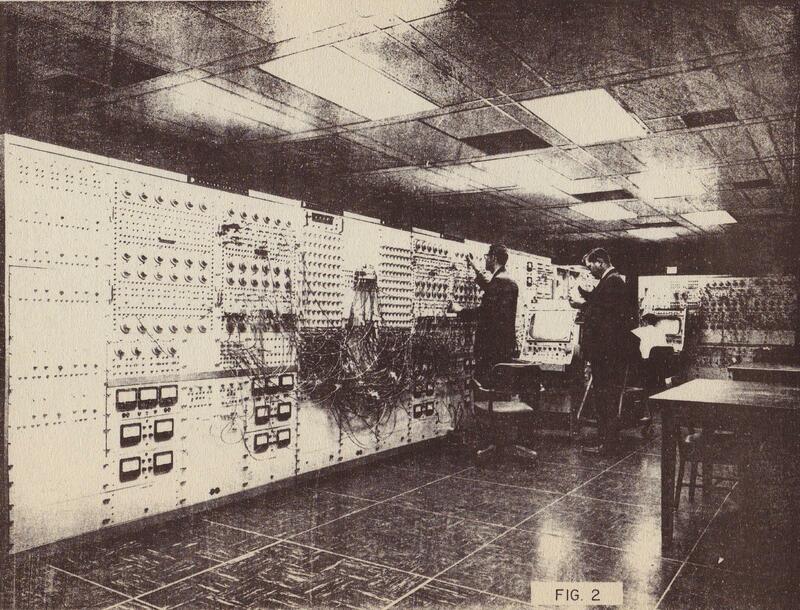 ), "A History of Engineering and Science in the Bell System - National Service in War and Peace (1925 - 1975)", Bell Telephone Laboratories, Inc., p. 383). 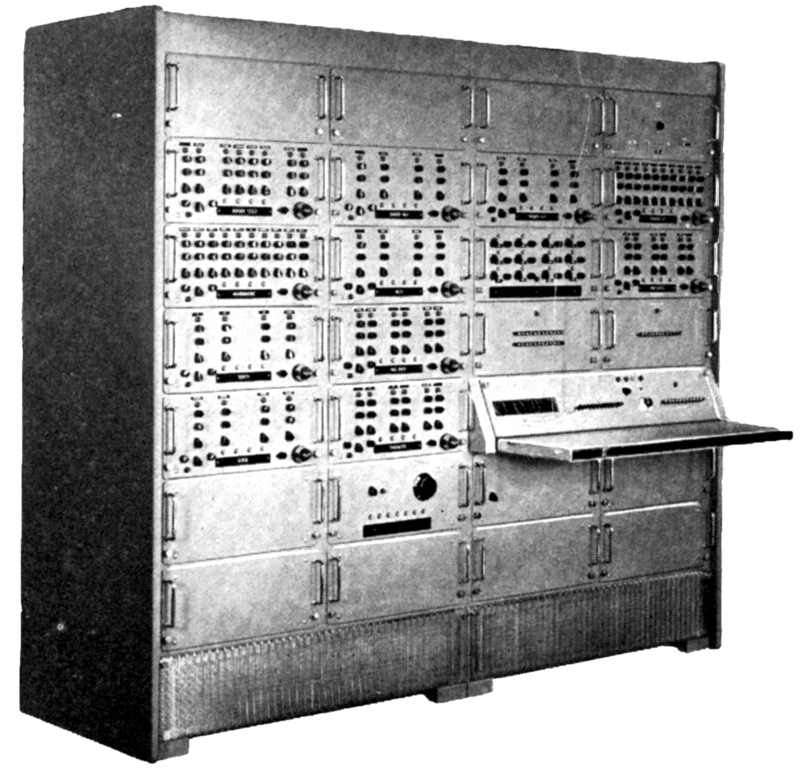 The Nike-Resarch-and-Development analog computer in 1951 with covers opened (cf. M. D. Fagen (Ed. 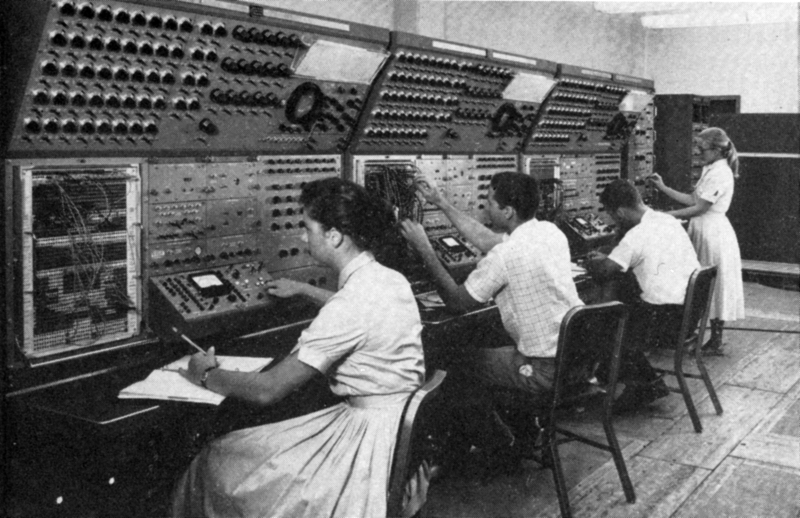 ), "A History of Engineering and Science in the Bell System - National Service in War and Peace (1925 - 1975)", Bell Telephone Laboratories, Inc., p. 383). 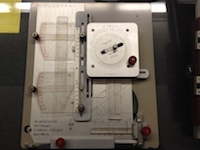 A plotter based quad function generator for functions of the form f(x, y) - the paper is conductive and the function is represented by potential field generated by silver paintings on the paper. 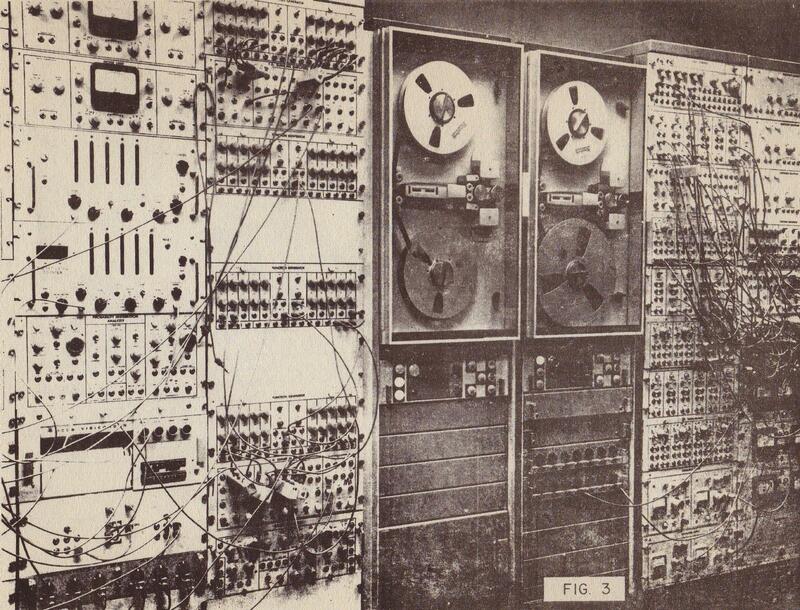 Mechanical tides computers (Fourier synthesizer), picture source: Dr. Ralf Bülow. 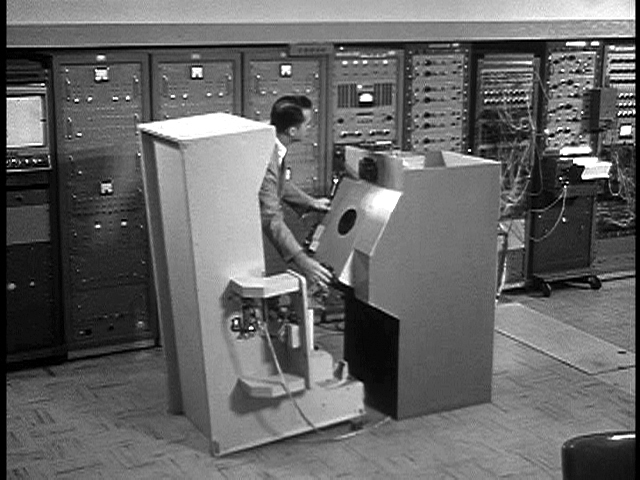 The General Purpose Simulator, GPS for short, which was used during development of the Saturn V rocket to implement a 12 degree of freedom simulation of the 1st stage, taking effects like dynamic winds, bending of the rocket structure, and fuel slosh into account. These simulations could be run 3,000 times faster than real-time. 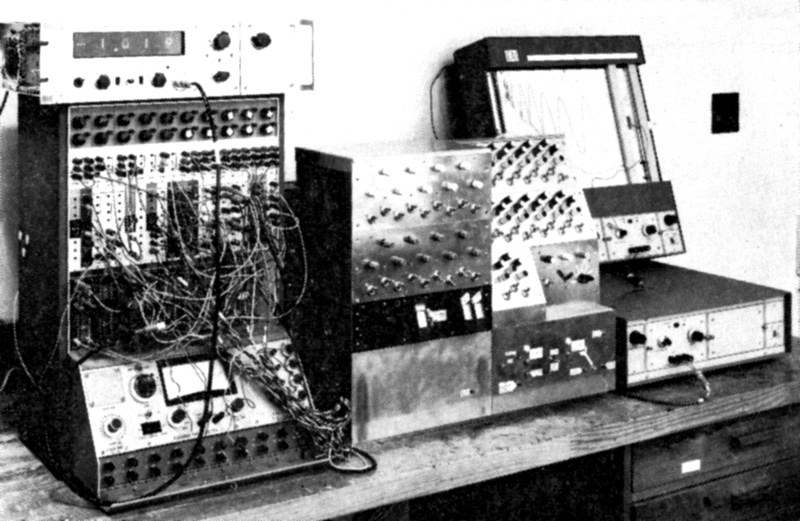 The system contained 50 integrators, 50 summers, 350 coefficient potentiometers, 20 quarter square multipliers, and 15 function generators (containing an additional 70 operational amplifiers). The General Purpose Simulator again. 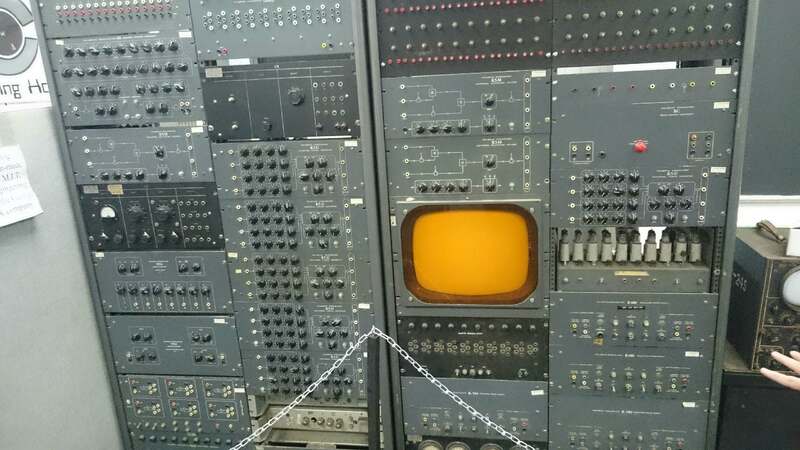 Analog computer used at NASA for lunar landing simulations. 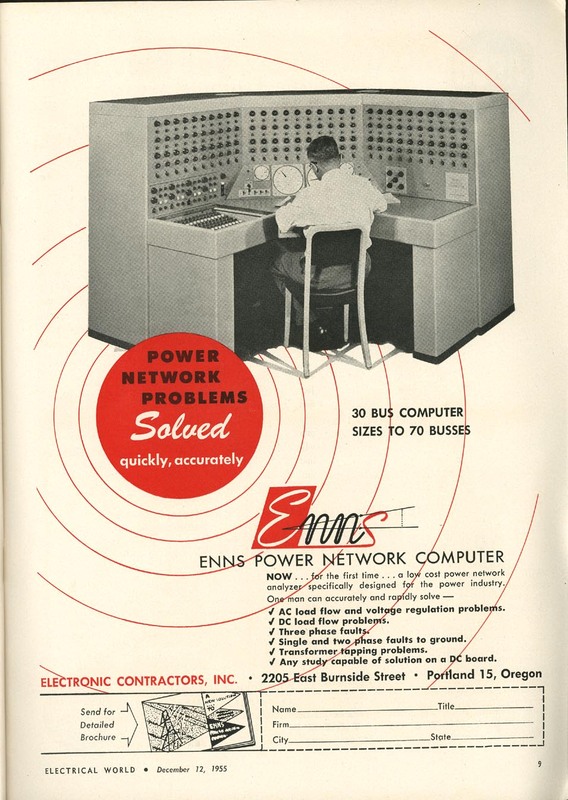 Advertisement for the ENNS power network analyzer.